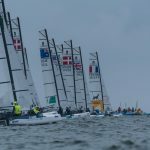 At days break, most of the fleet expected to spend the day sitting on shore awaiting wind. 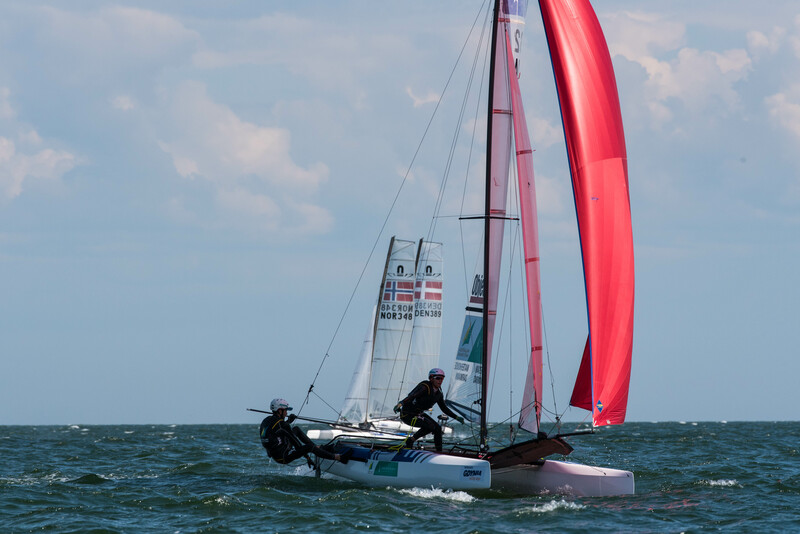 Pleasantly, an unexpected North Eastern wind built before start time to about 8 knots, making for great racing. 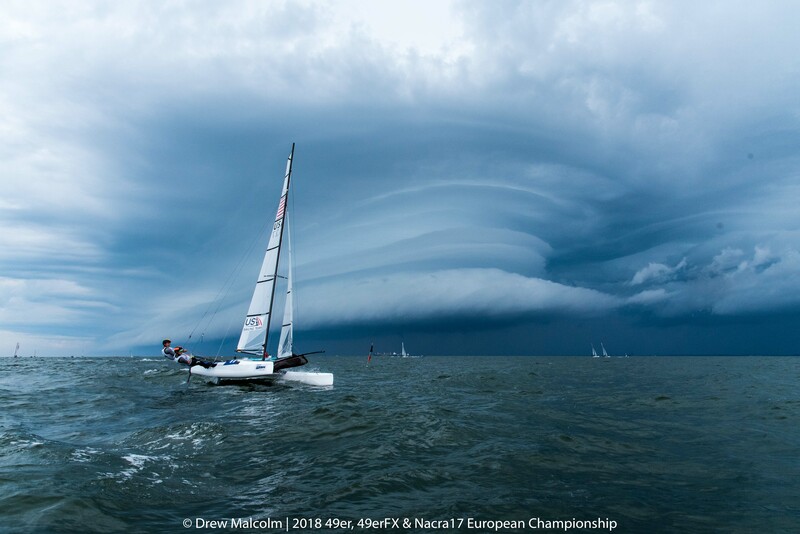 As a storm approached from the South front dominating local conditions. 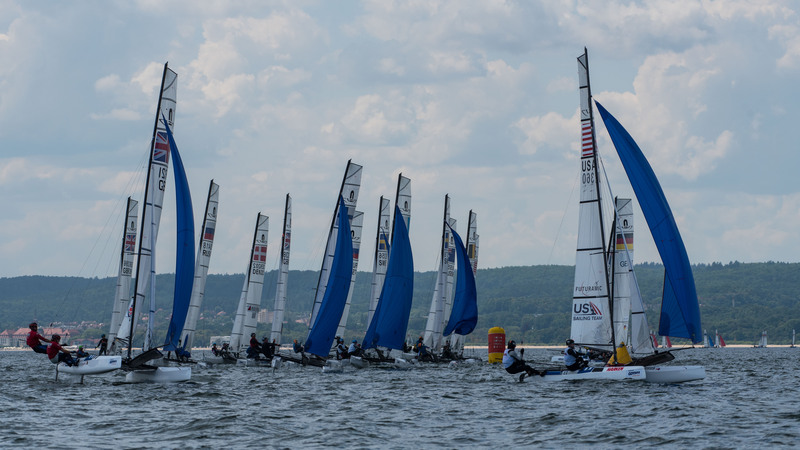 Backing puffs that favored those on the left side of the course eventually gave way to a huge shift all the way to the West, where the wind built all the way up to 18 knots. 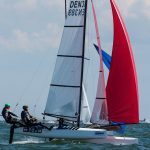 The wind than gradually reduced to finish out racing in down to 10 knots. 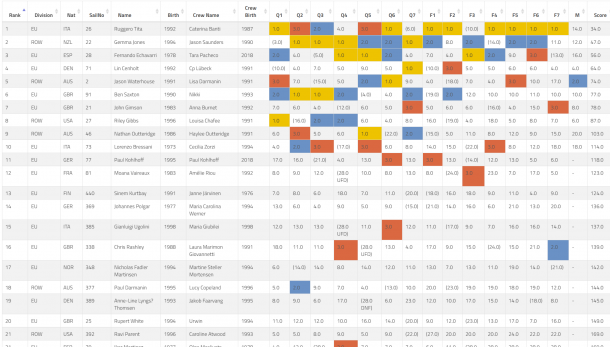 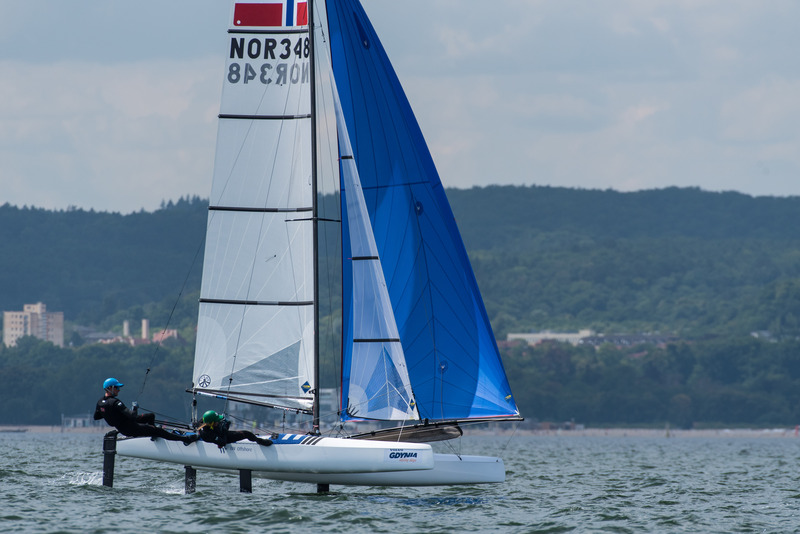 Across all three fleets, no team dominated their fleet like top Norwegian performers Helene Naess and Marie Ronningen. 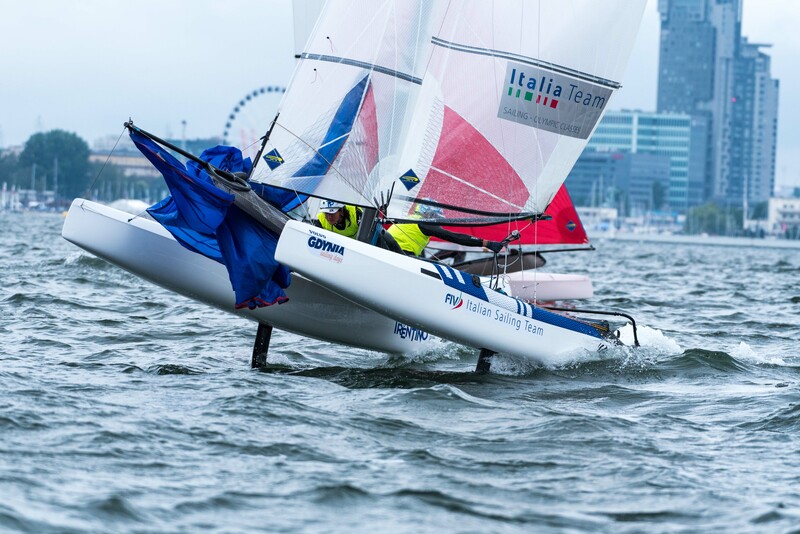 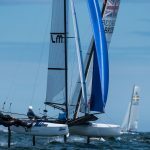 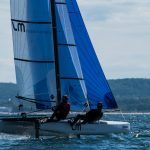 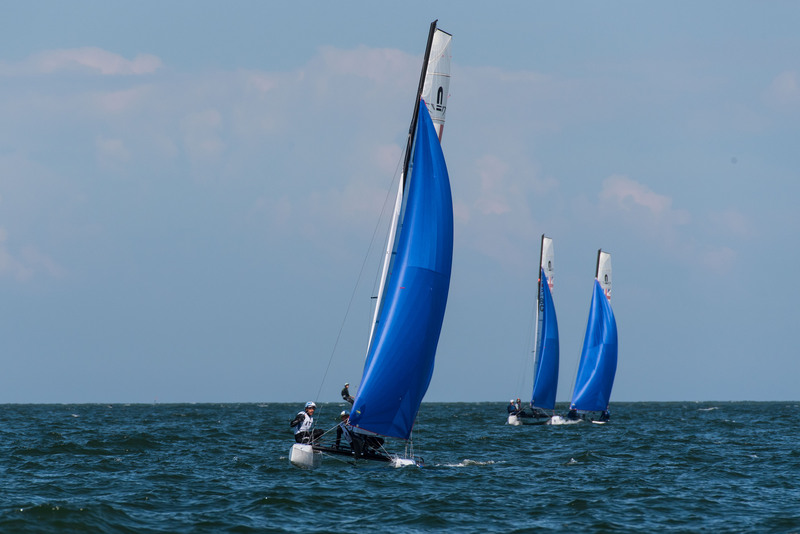 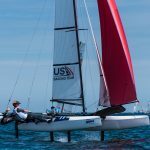 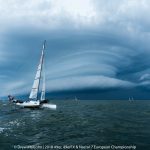 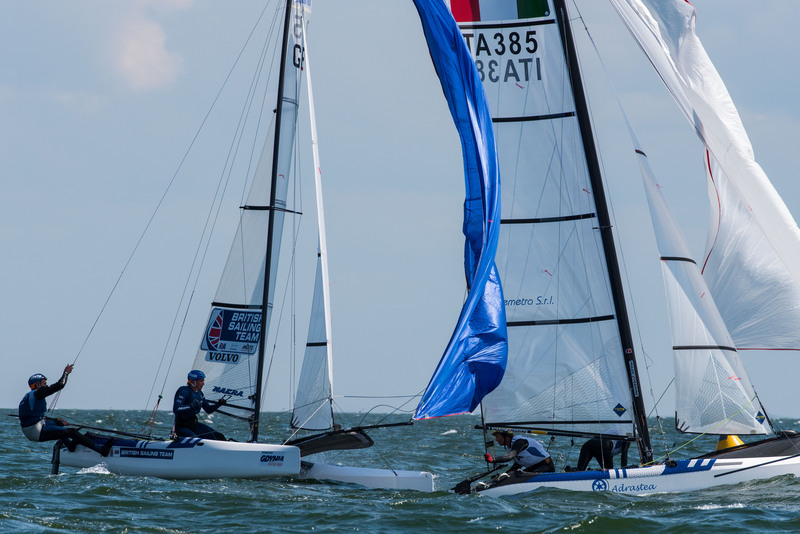 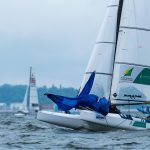 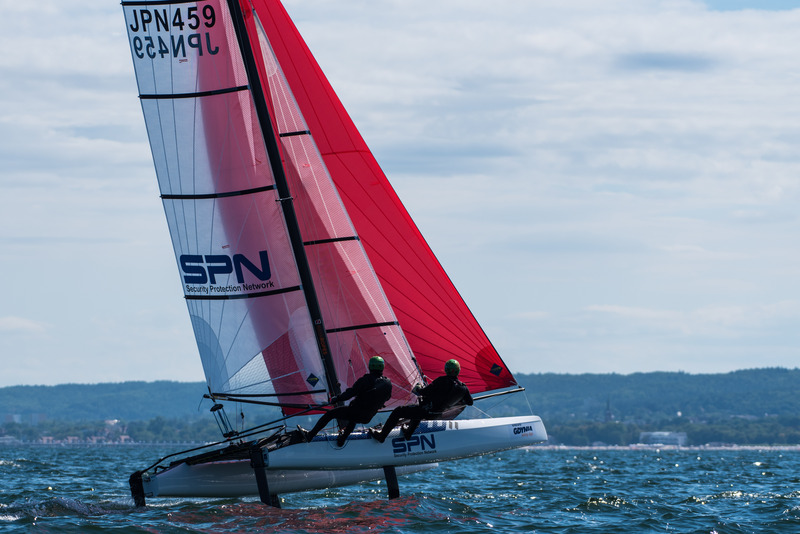 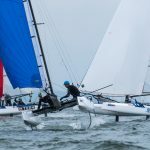 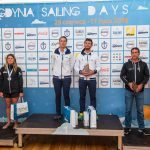 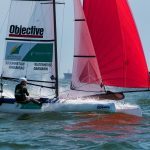 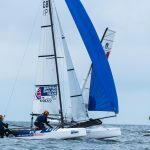 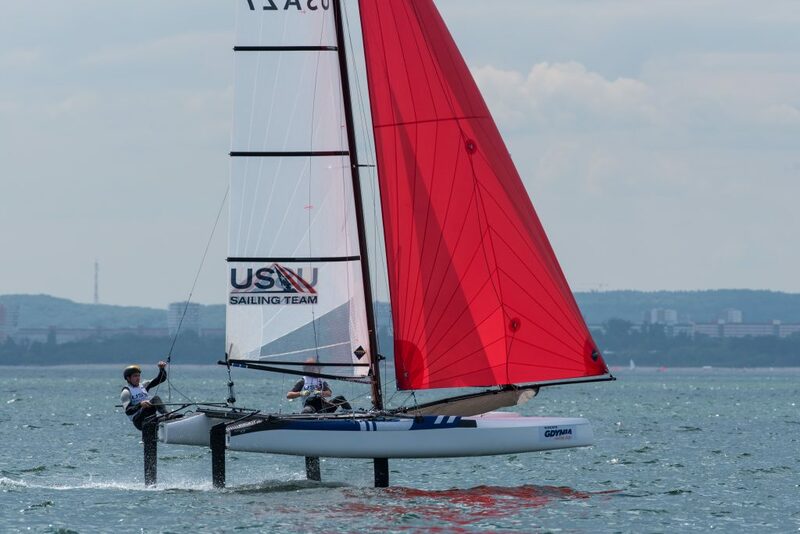 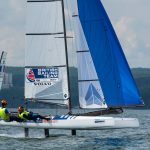 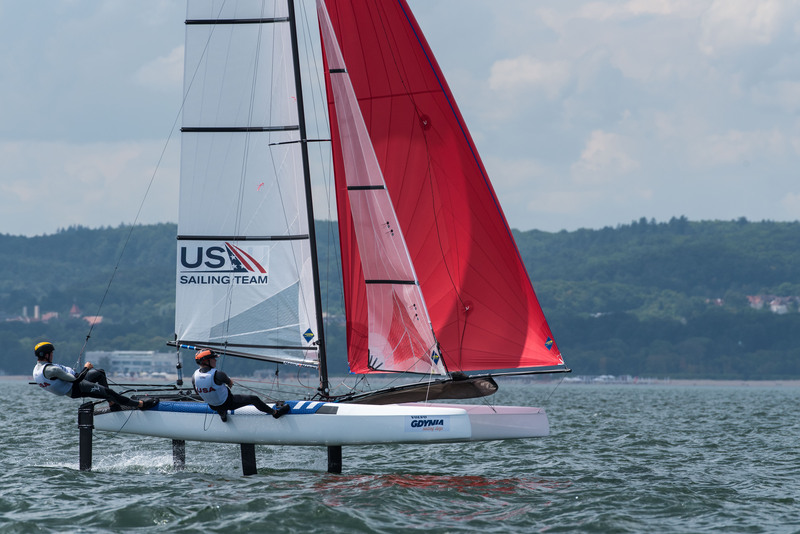 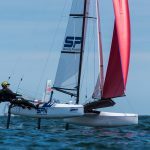 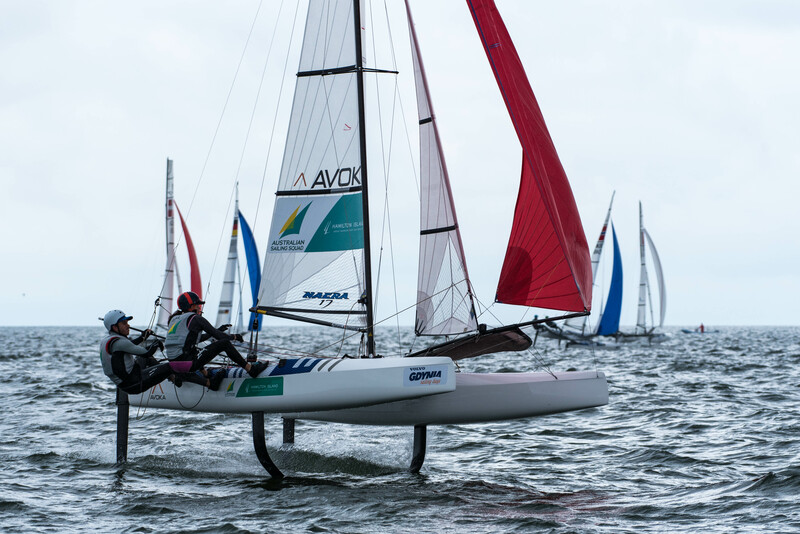 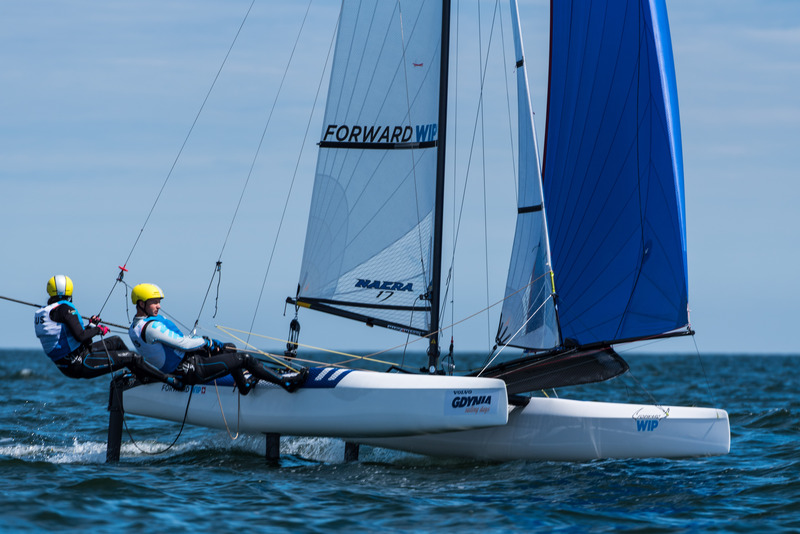 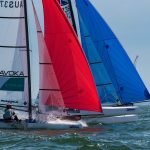 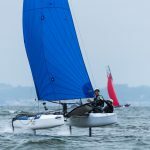 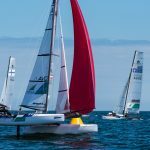 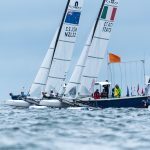 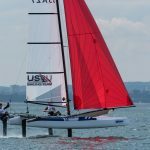 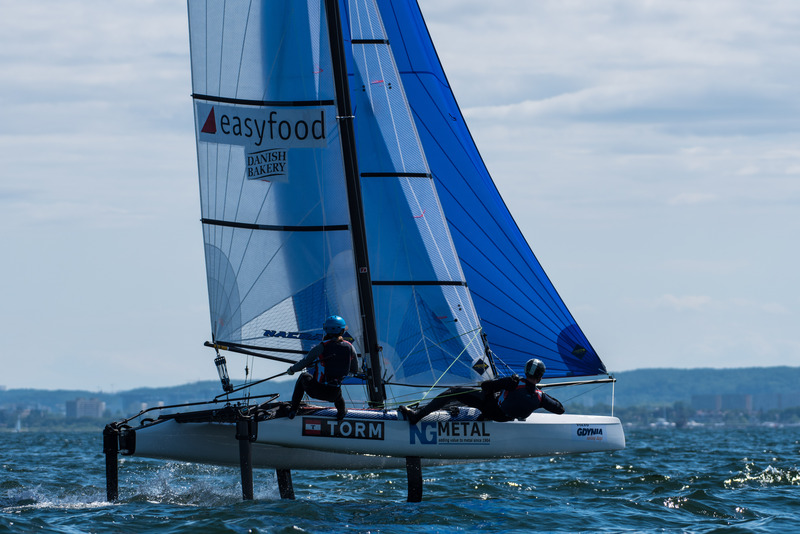 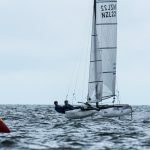 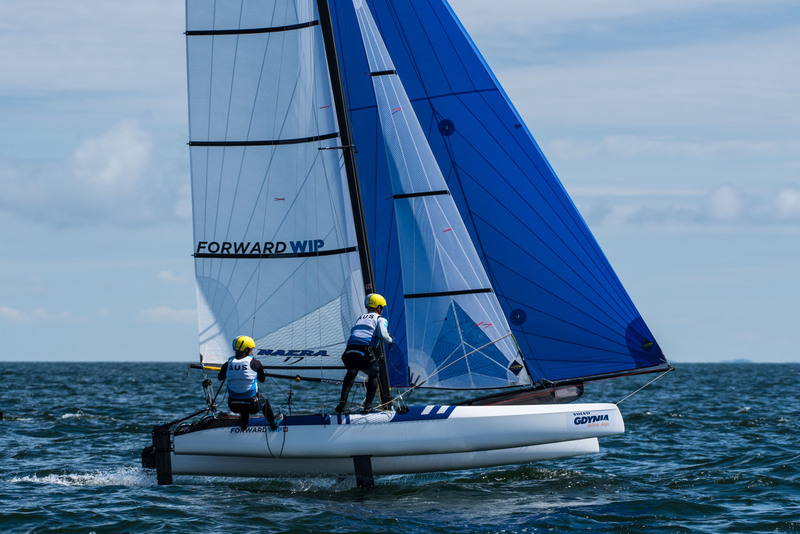 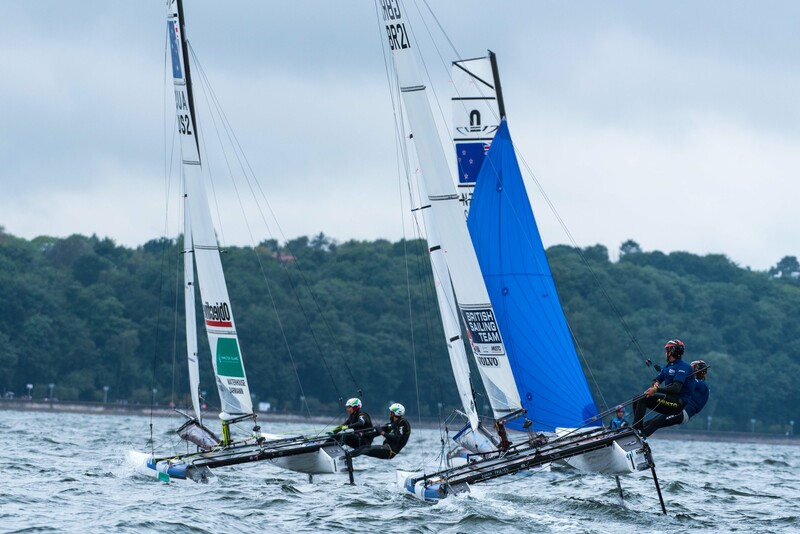 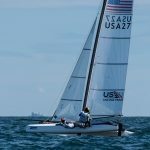 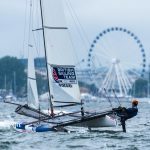 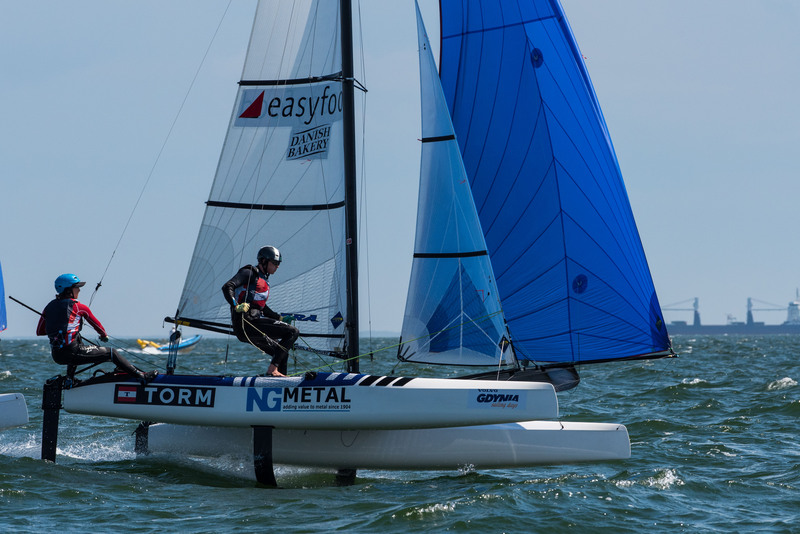 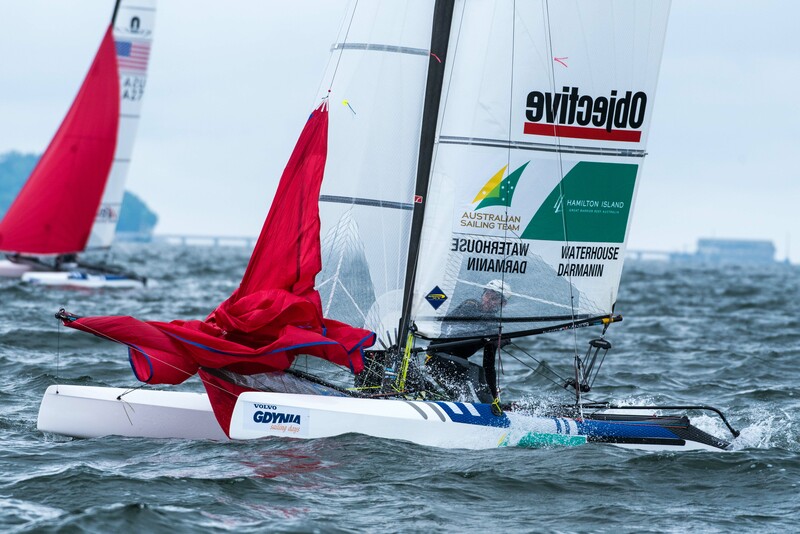 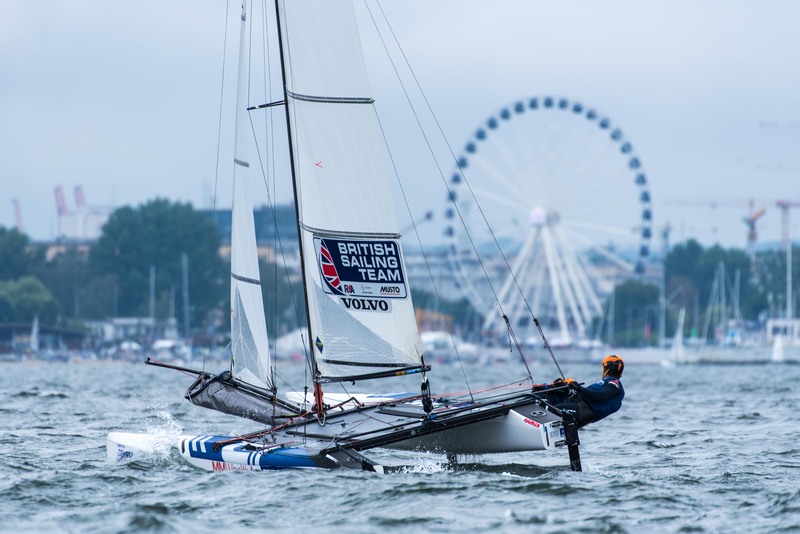 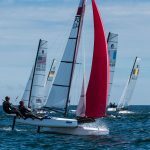 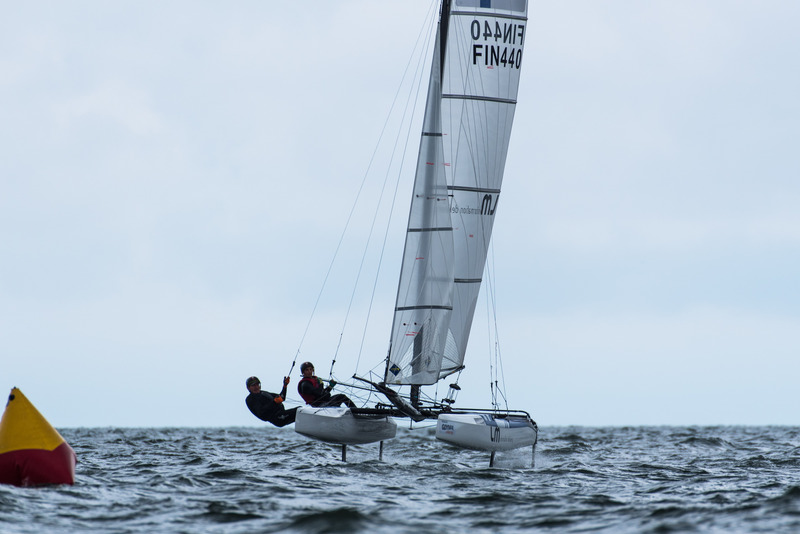 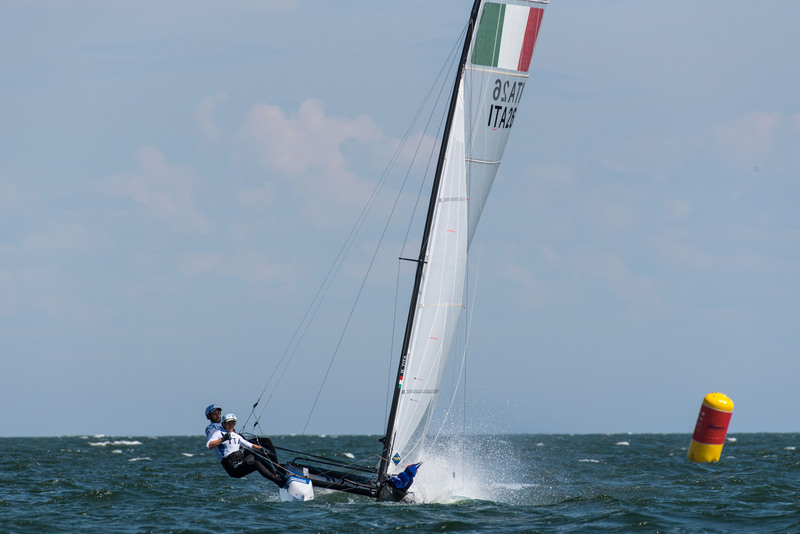 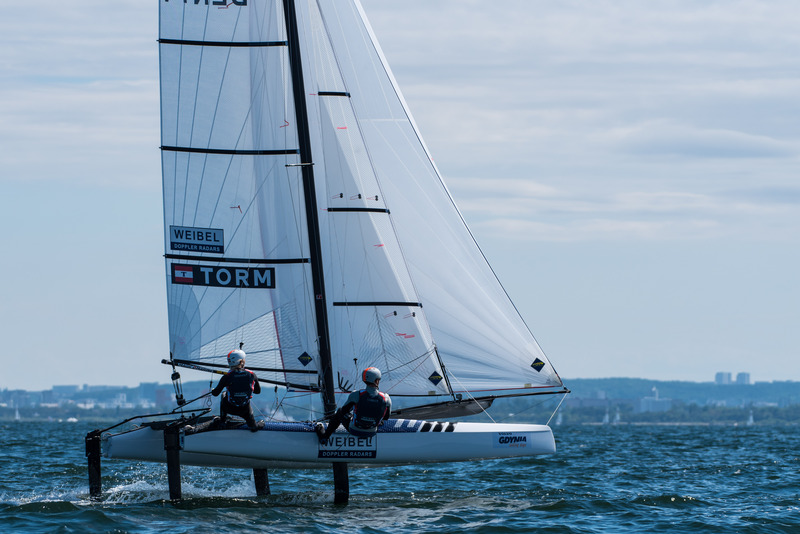 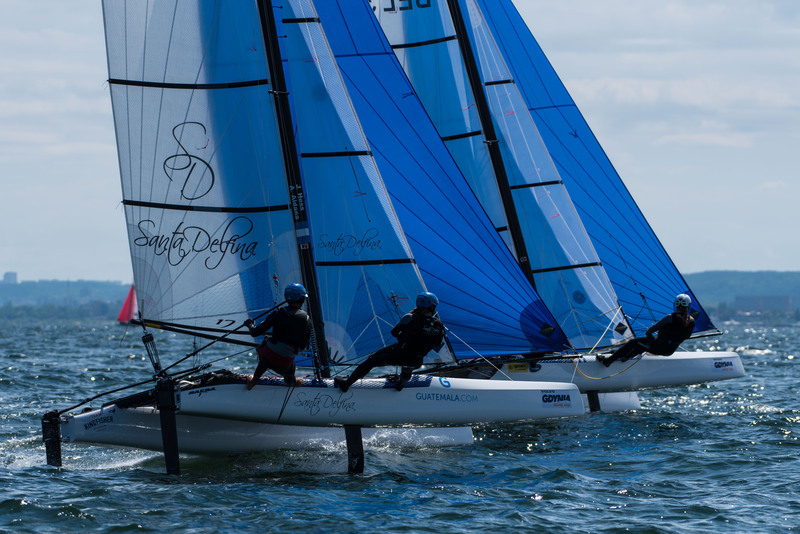 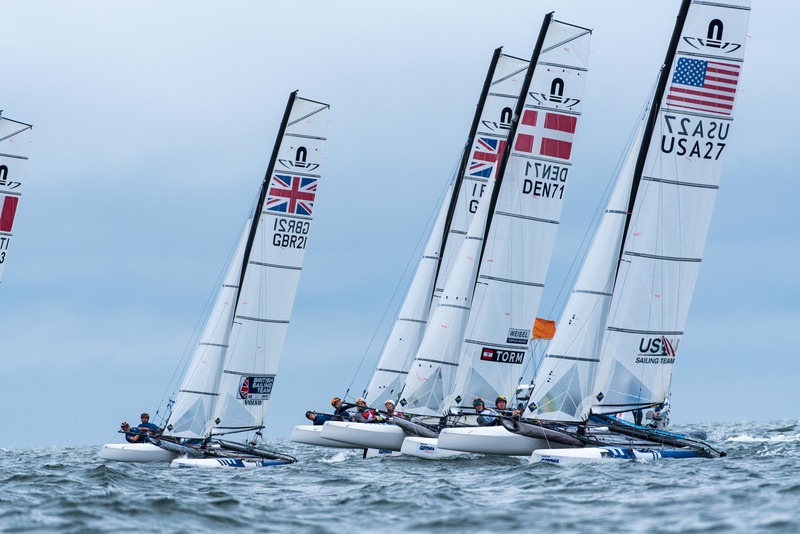 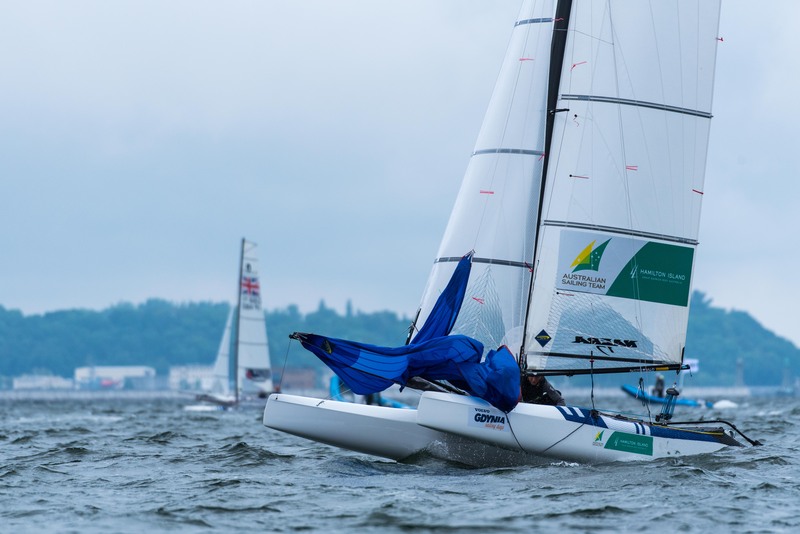 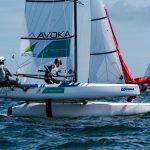 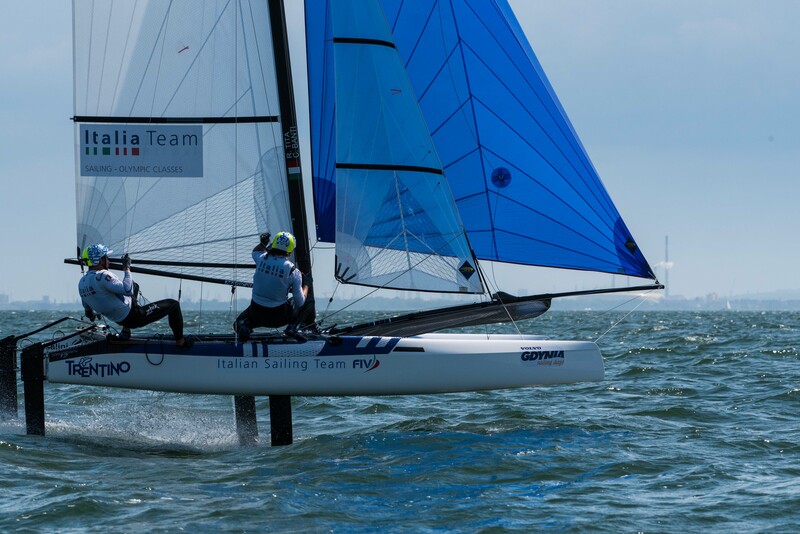 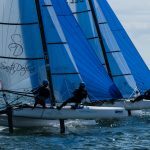 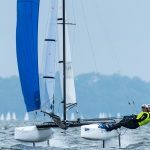 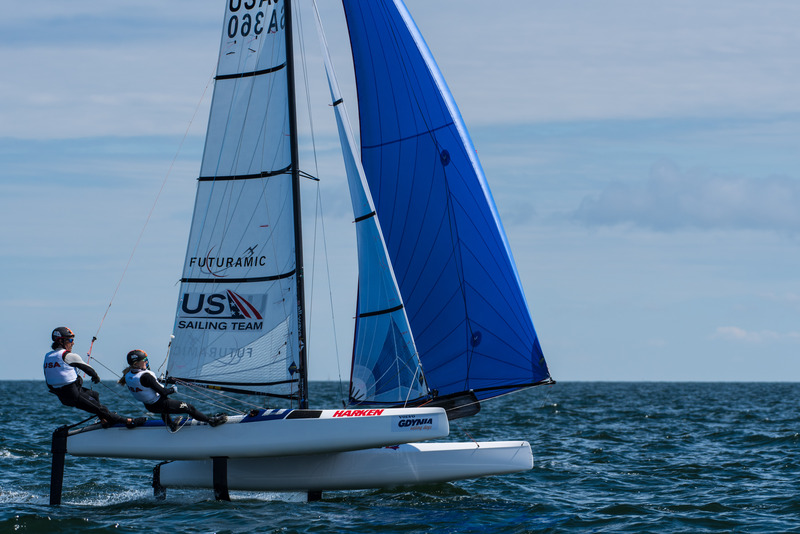 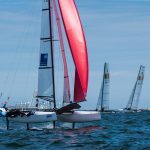 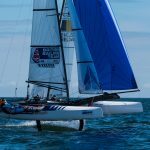 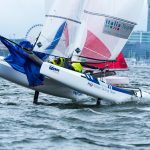 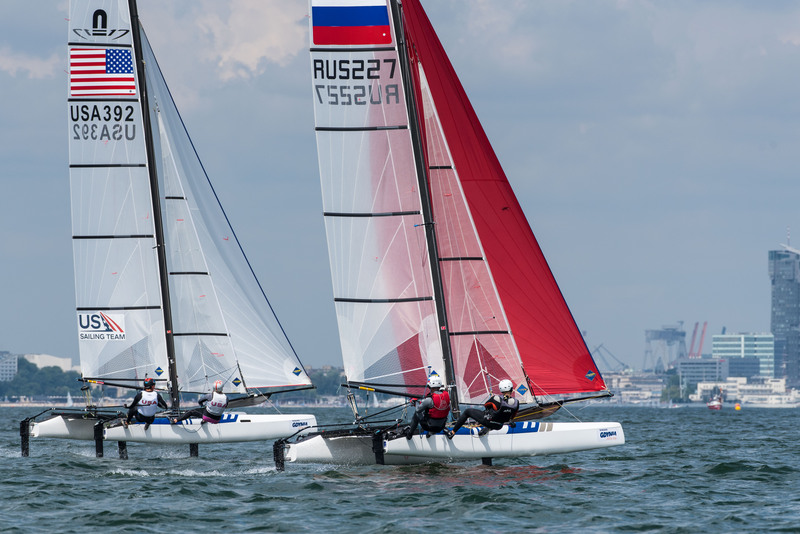 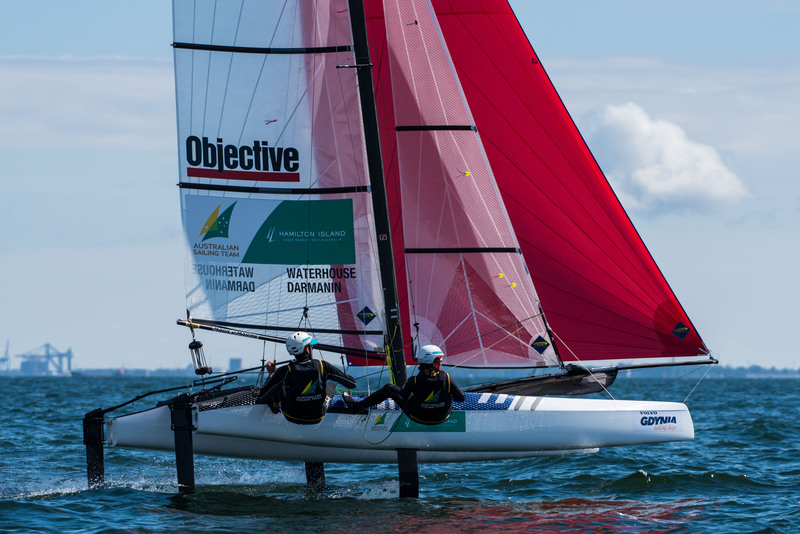 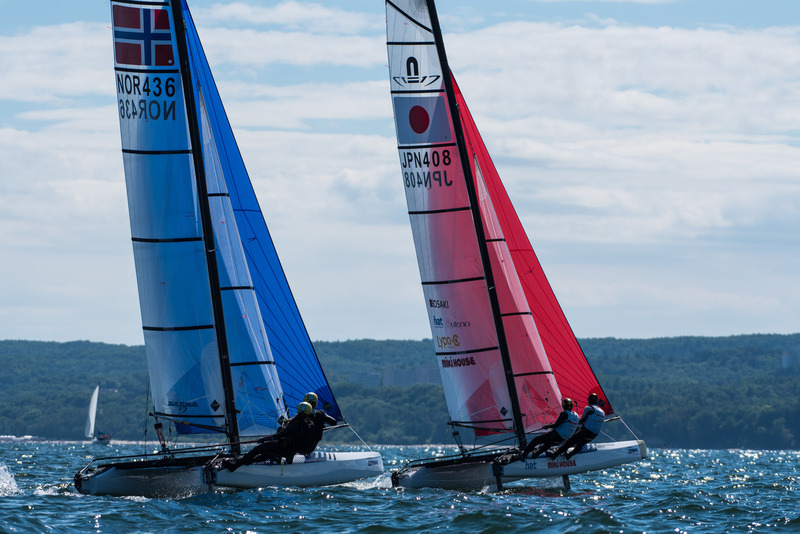 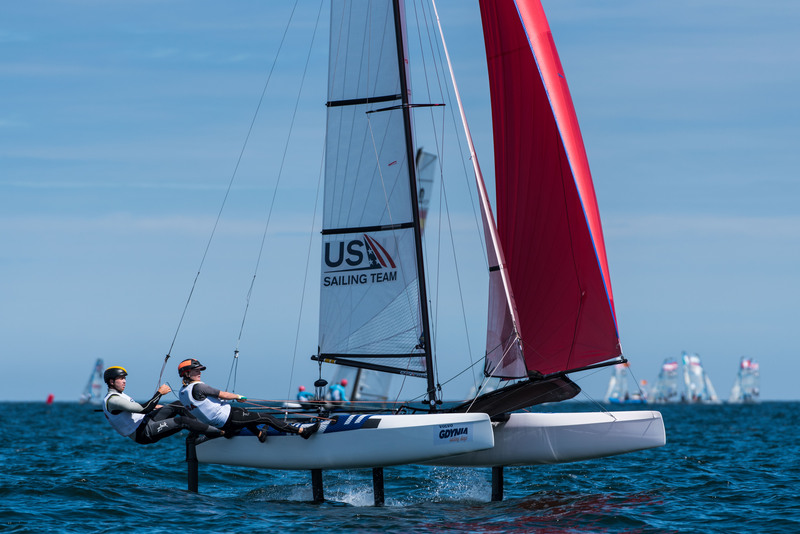 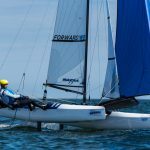 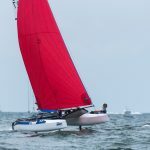 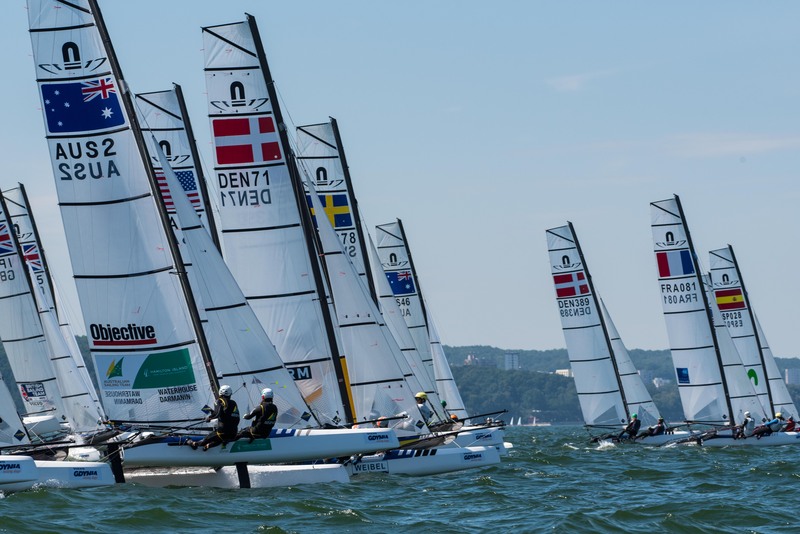 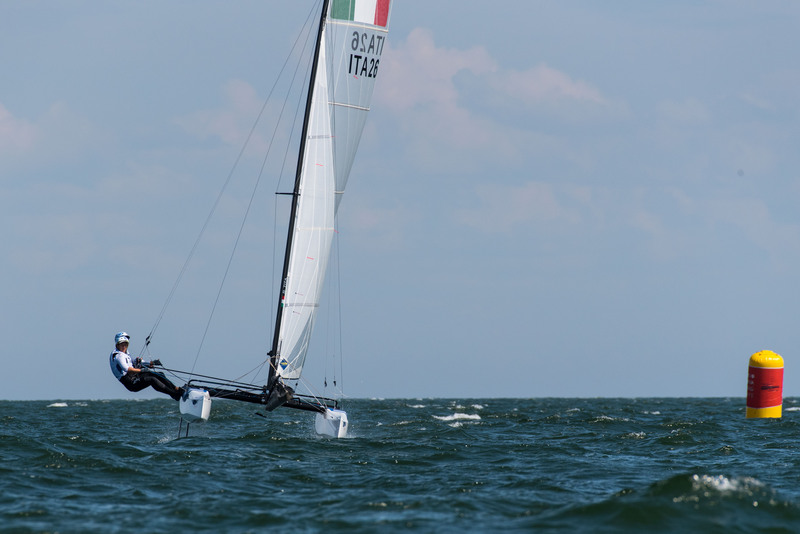 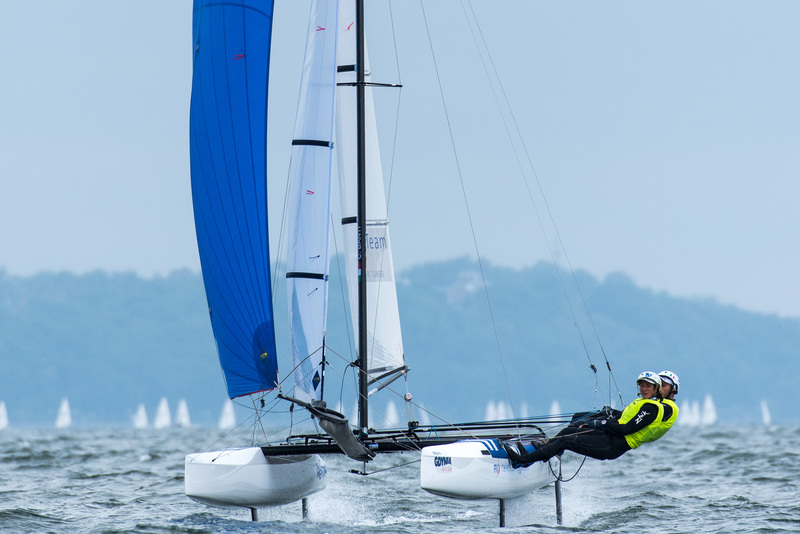 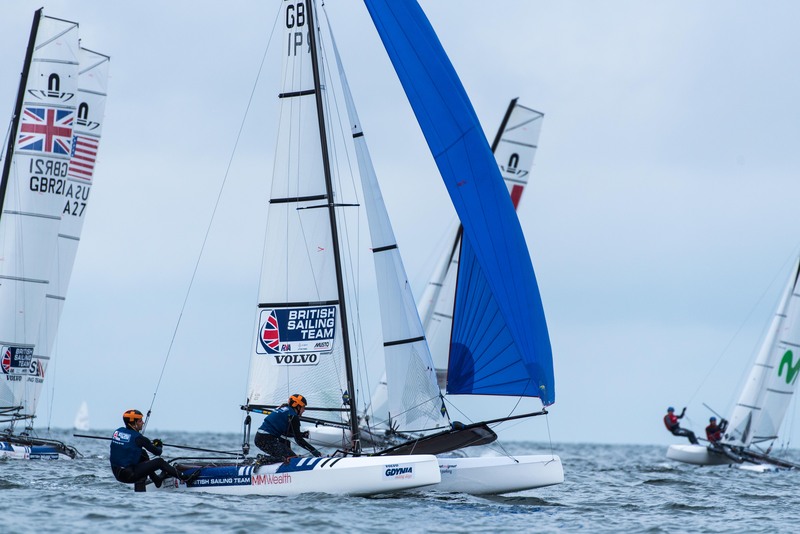 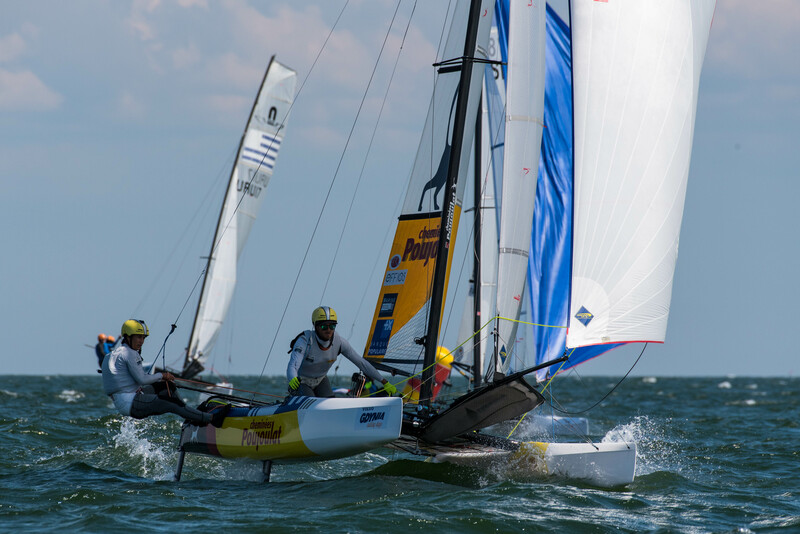 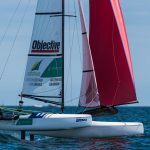 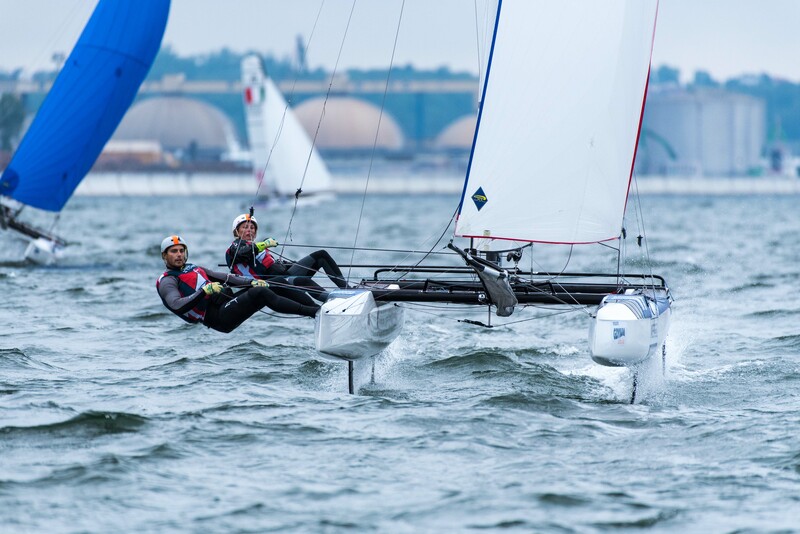 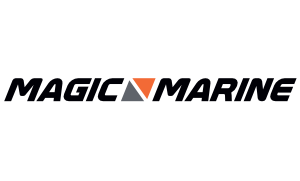 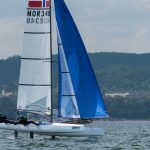 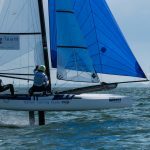 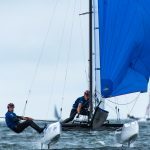 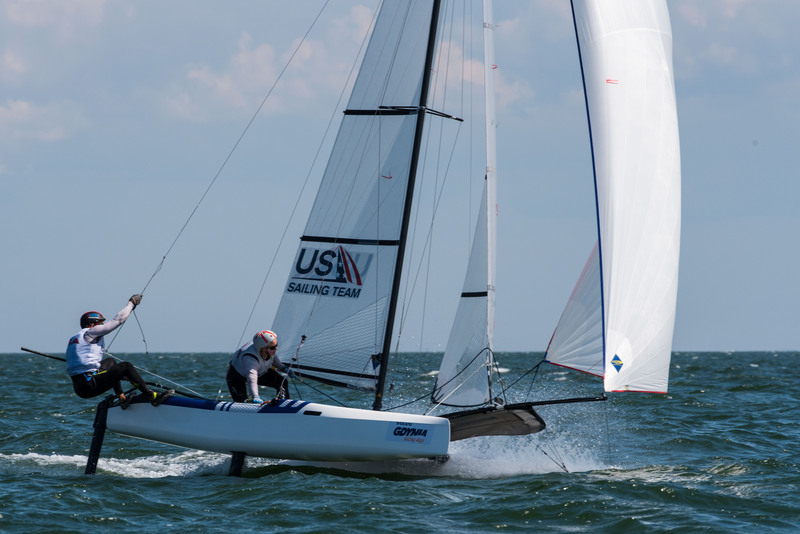 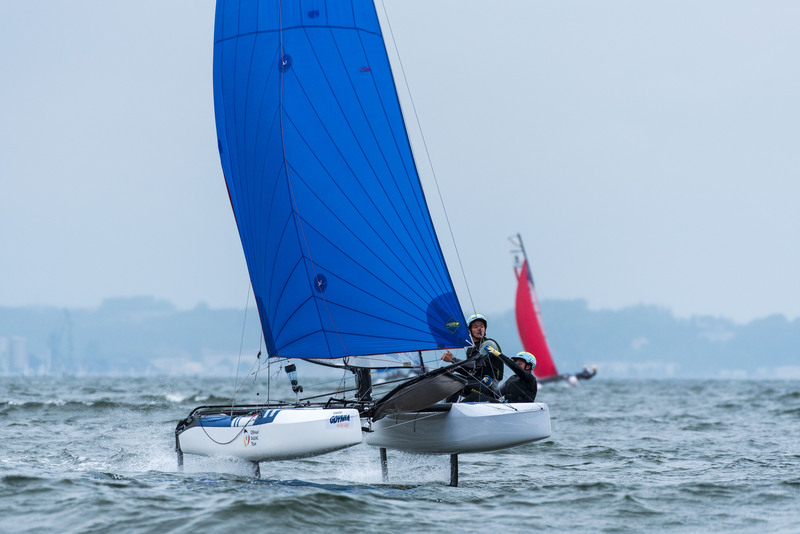 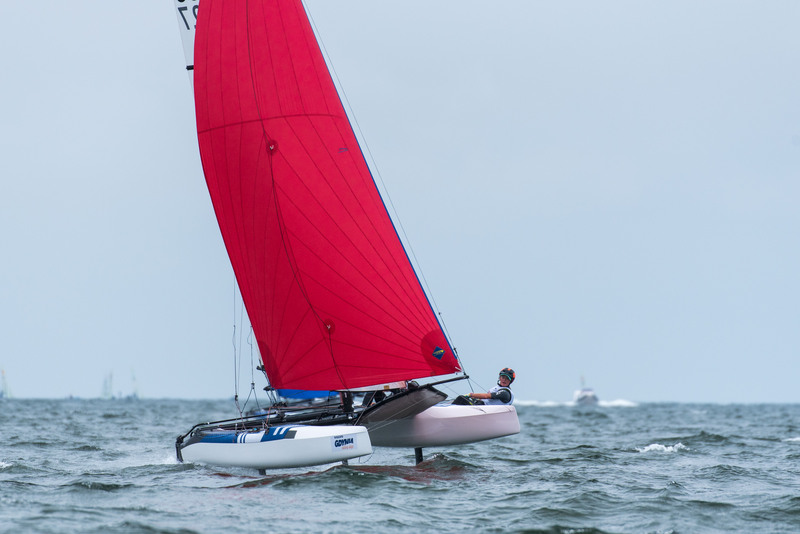 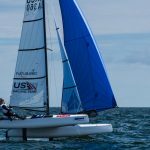 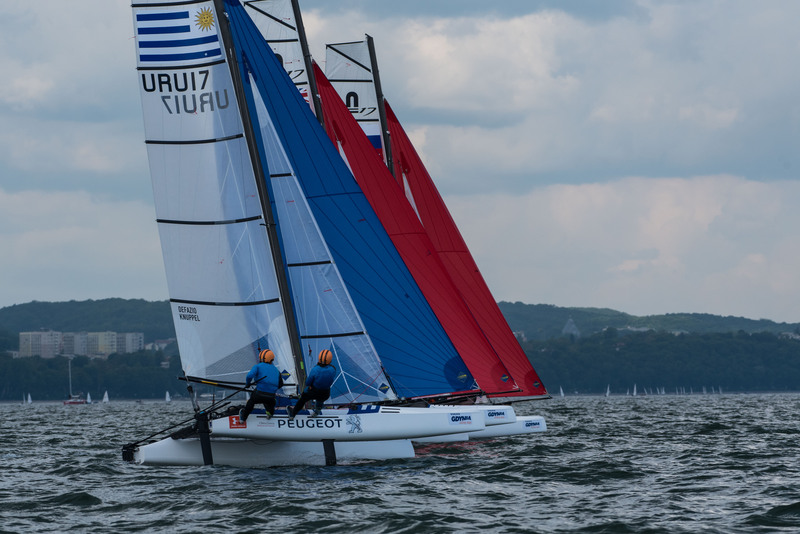 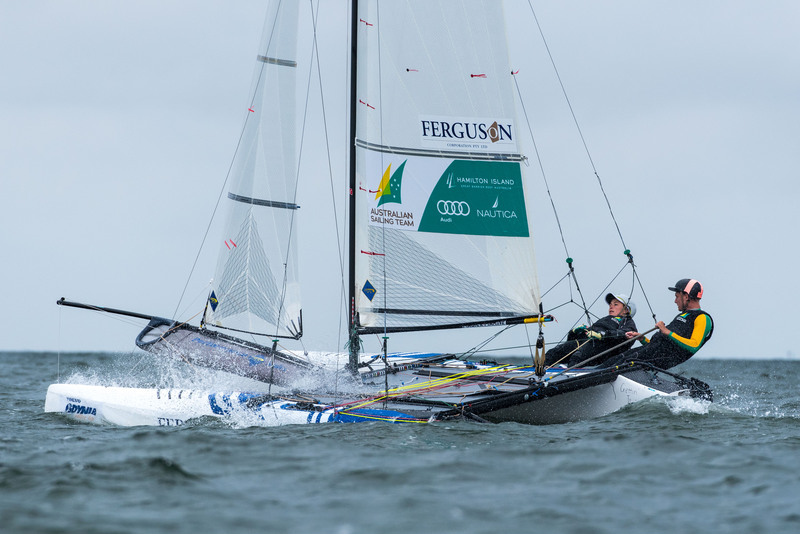 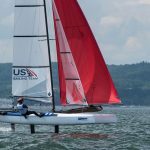 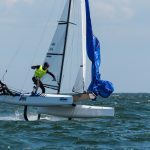 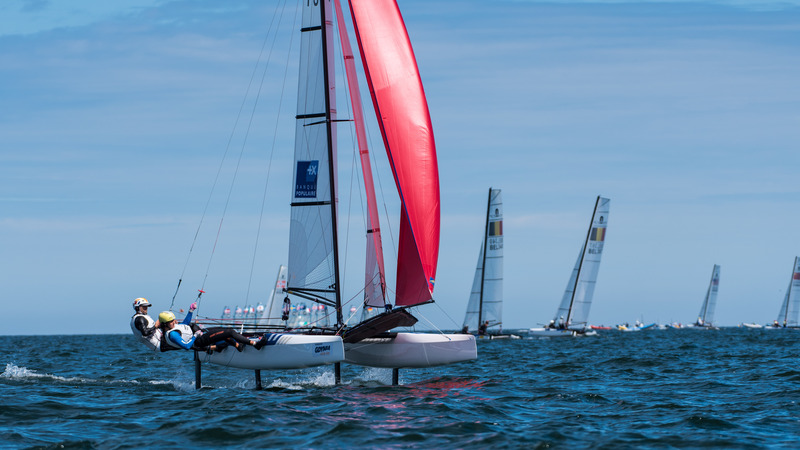 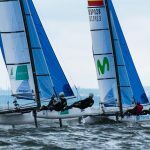 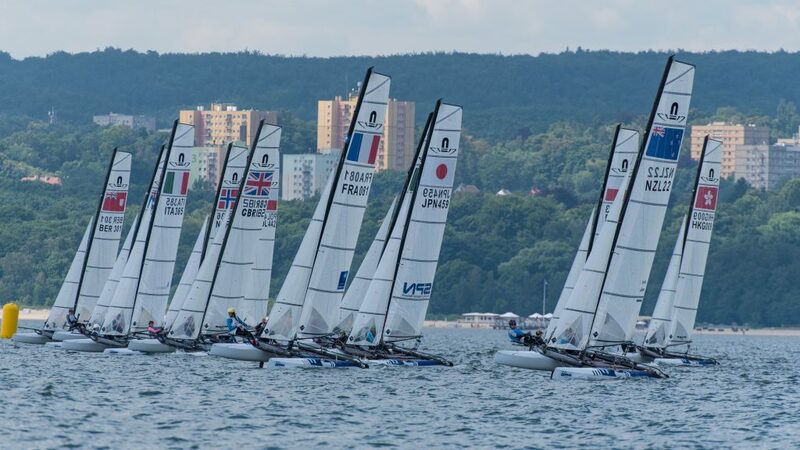 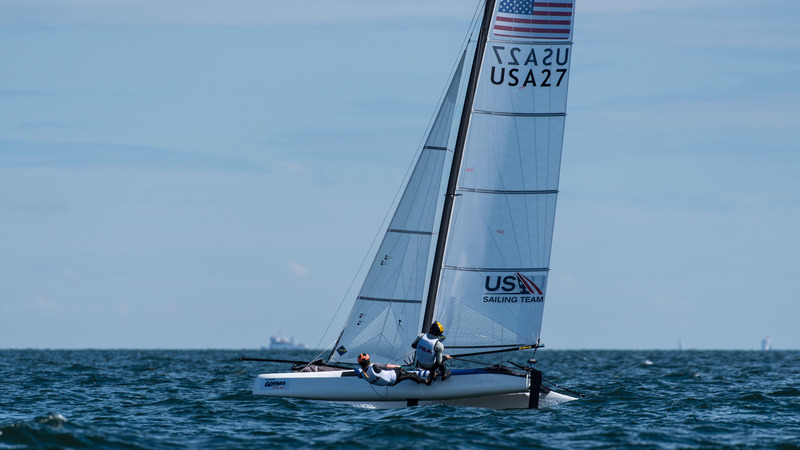 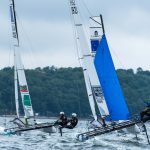 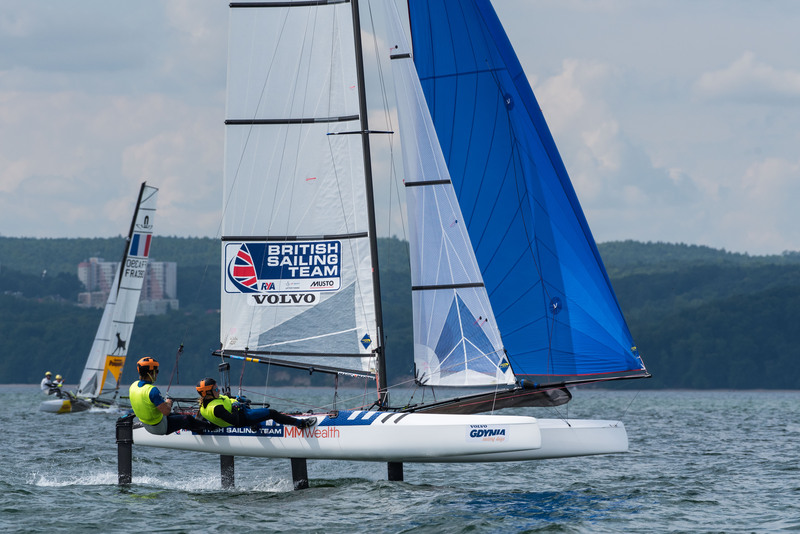 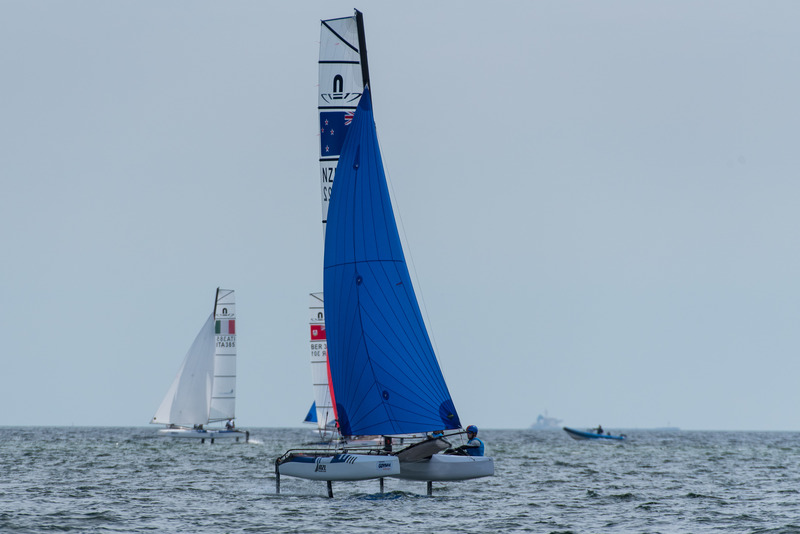 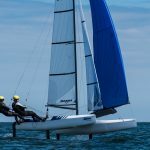 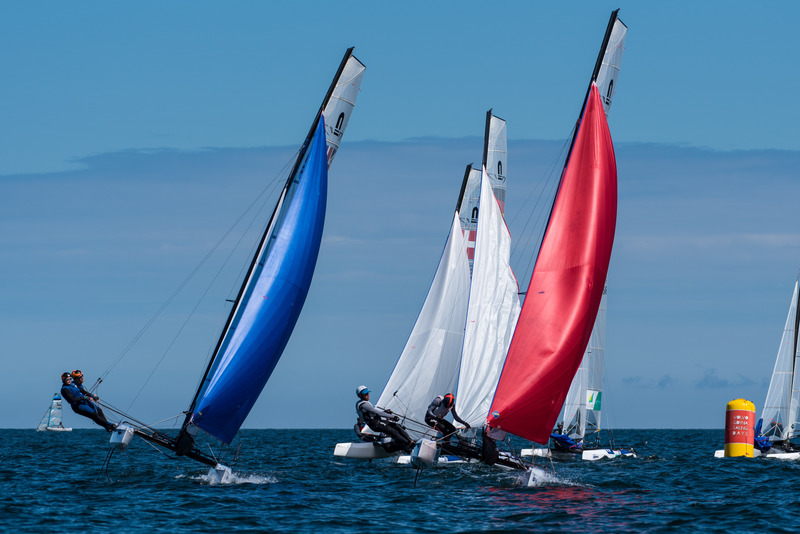 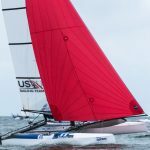 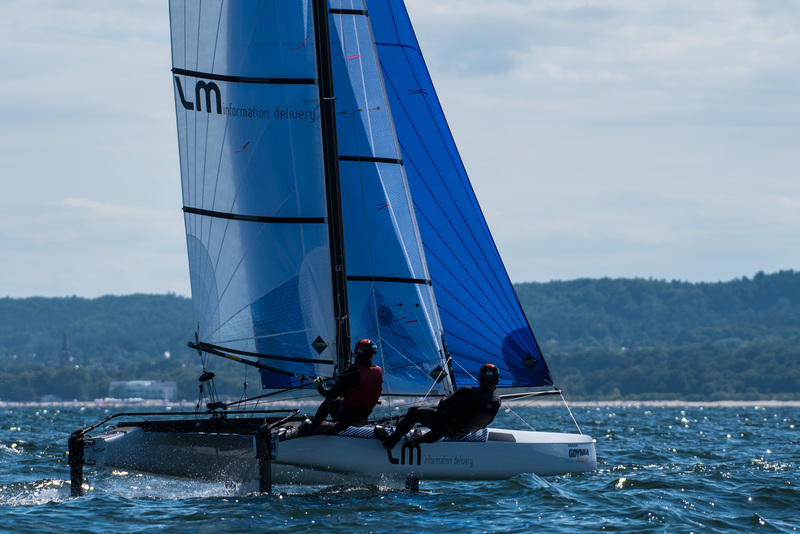 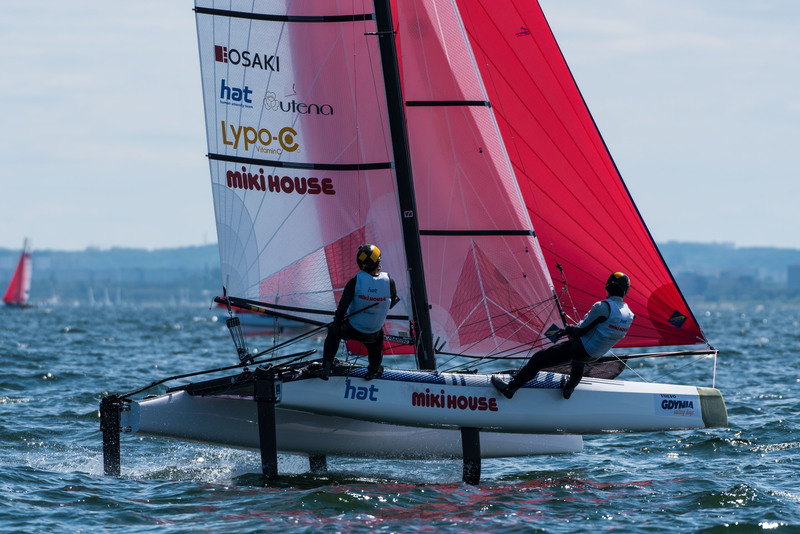 Winning two of their three qualifying races this morning in conditions similar to yesterday’s light breeze, the upstart Vikings said the first two days of the 2018 European Championship played into one of their biggest strengths: Light air sailing with chop. 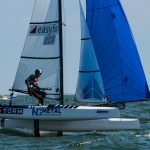 “We feel really confident in the boat in these conditions,” said Naess in a post-race interview. 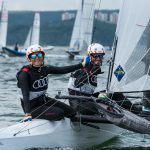 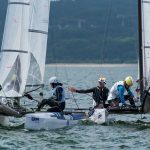 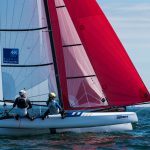 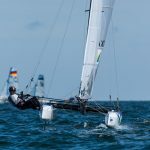 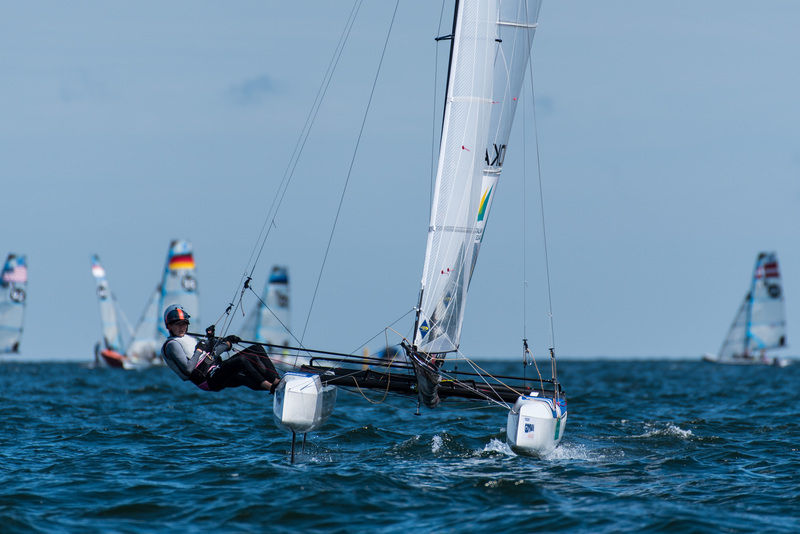 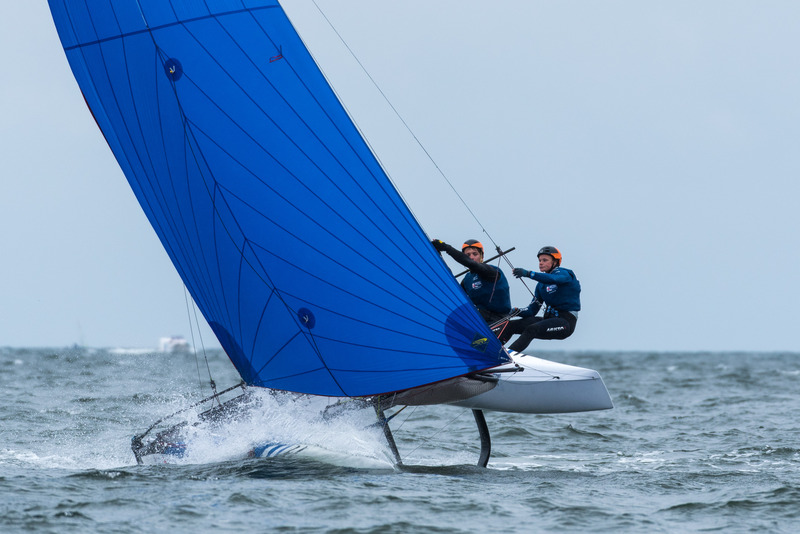 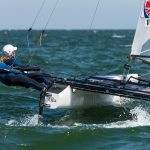 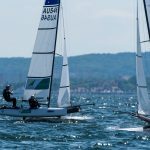 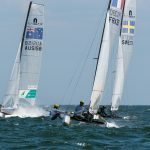 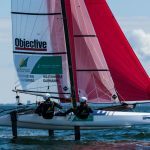 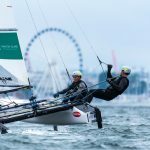 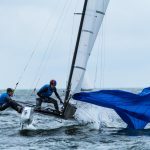 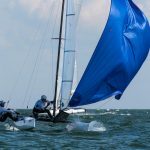 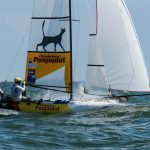 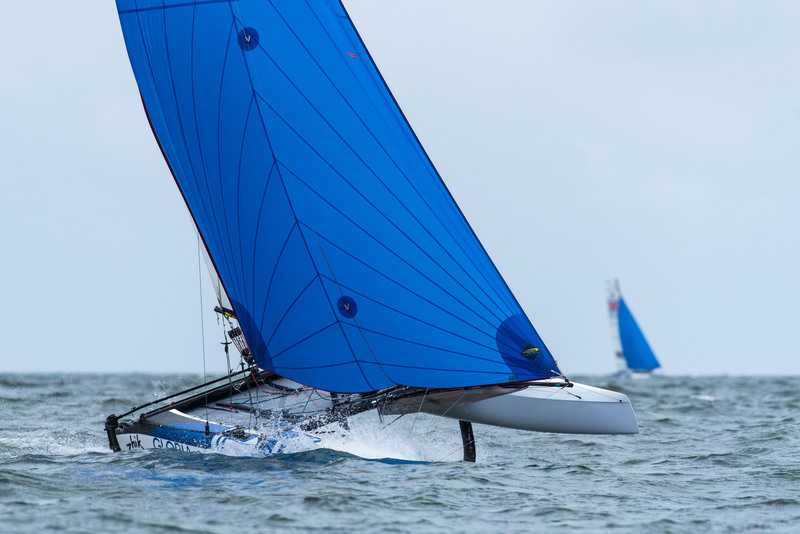 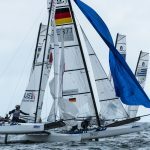 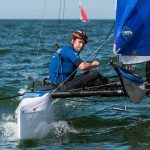 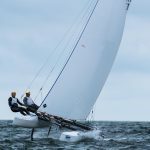 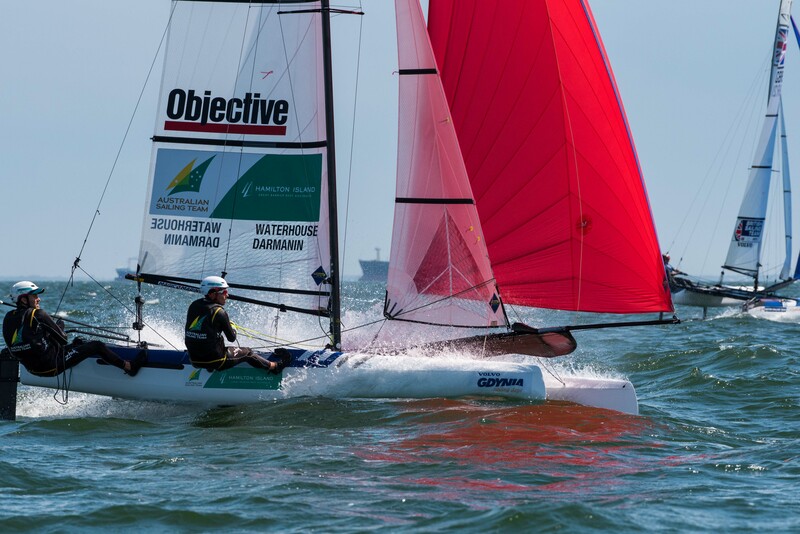 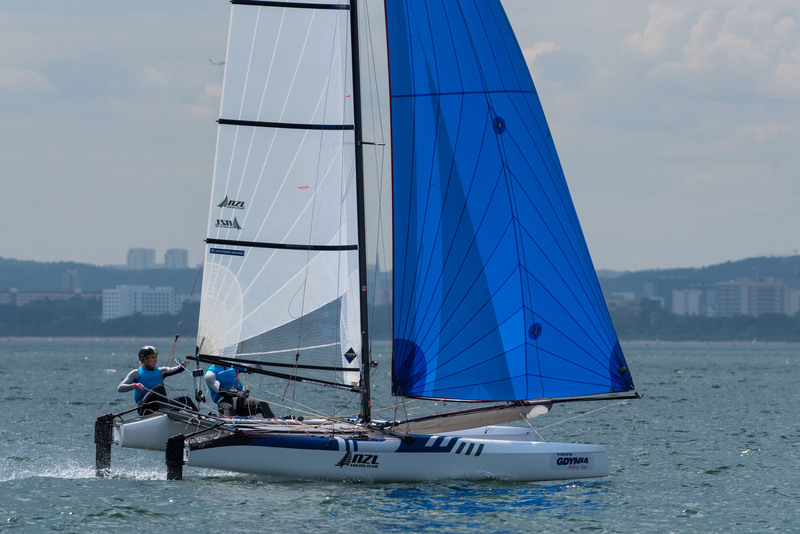 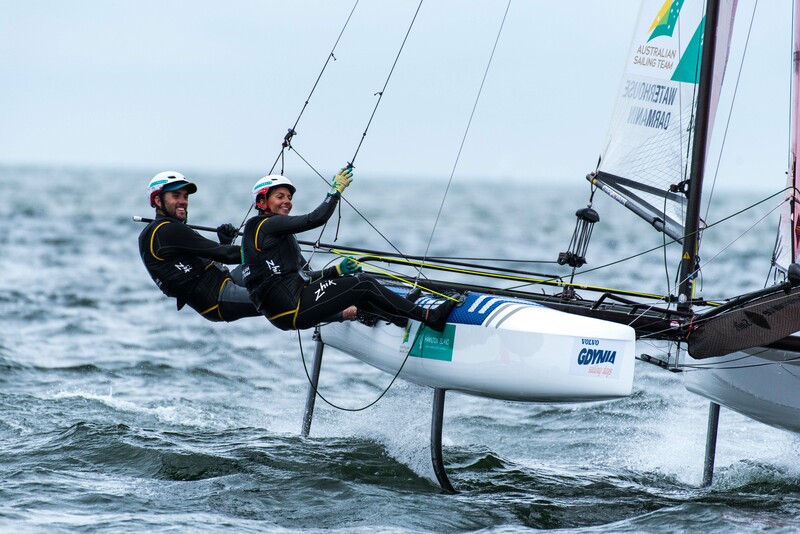 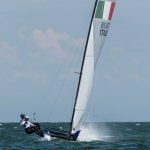 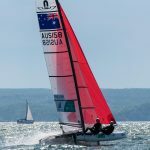 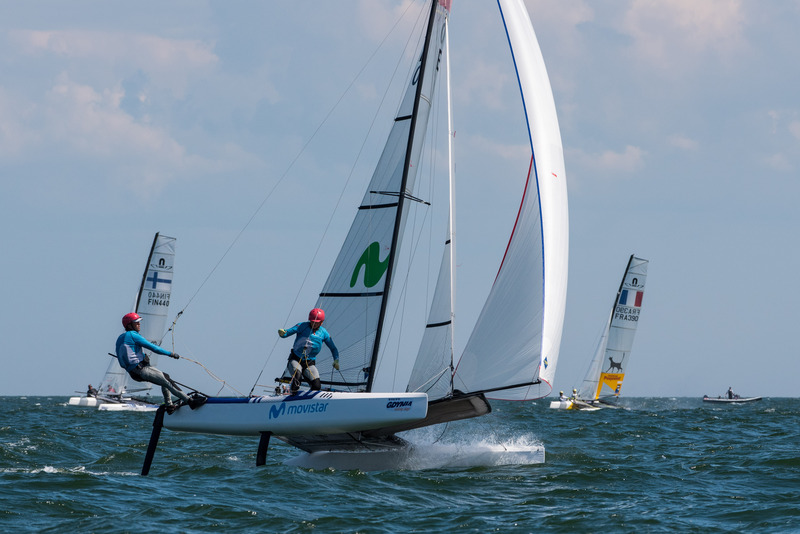 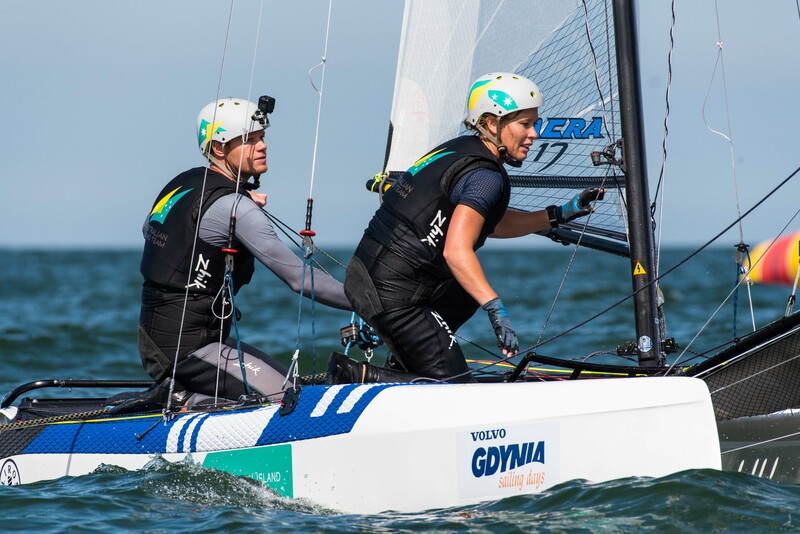 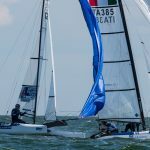 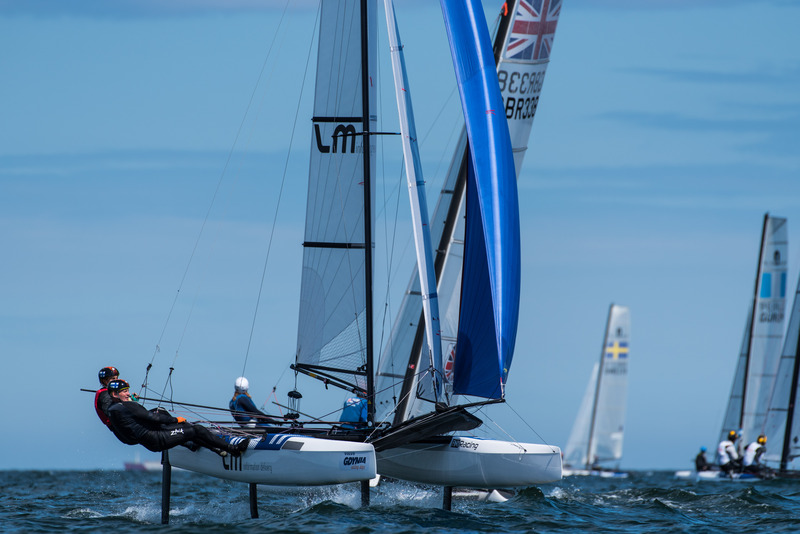 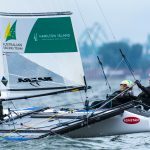 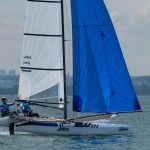 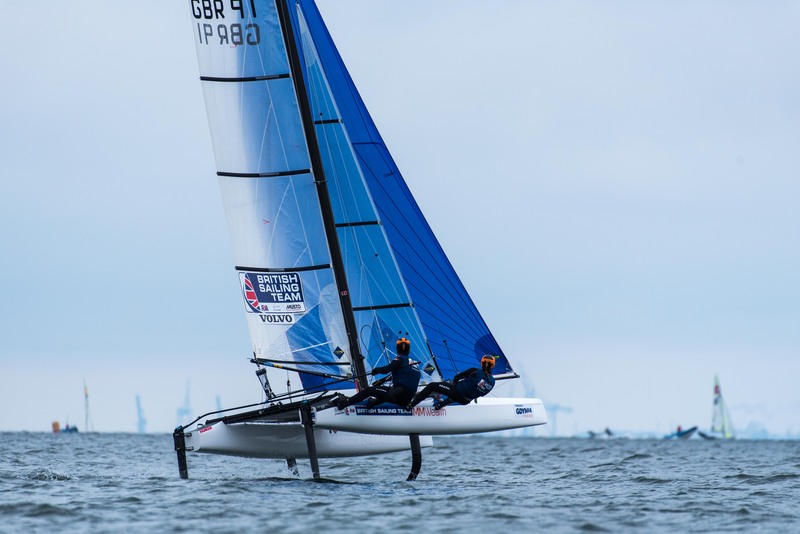 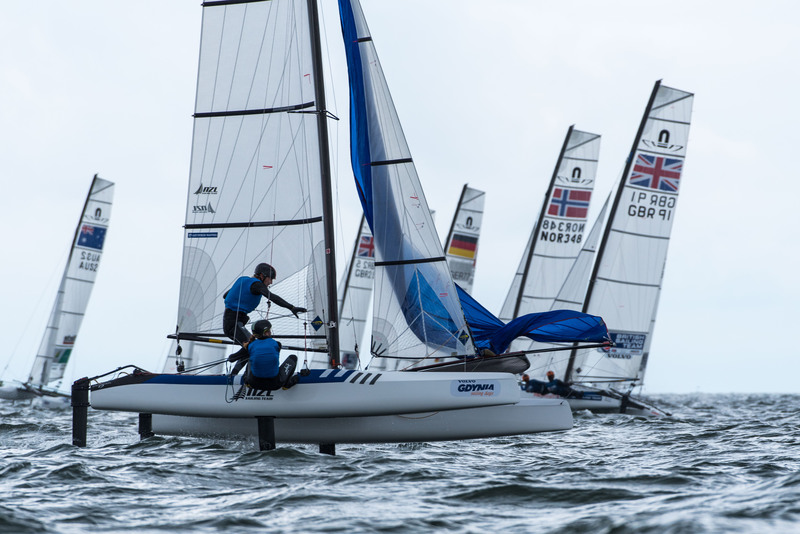 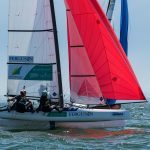 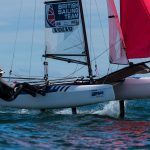 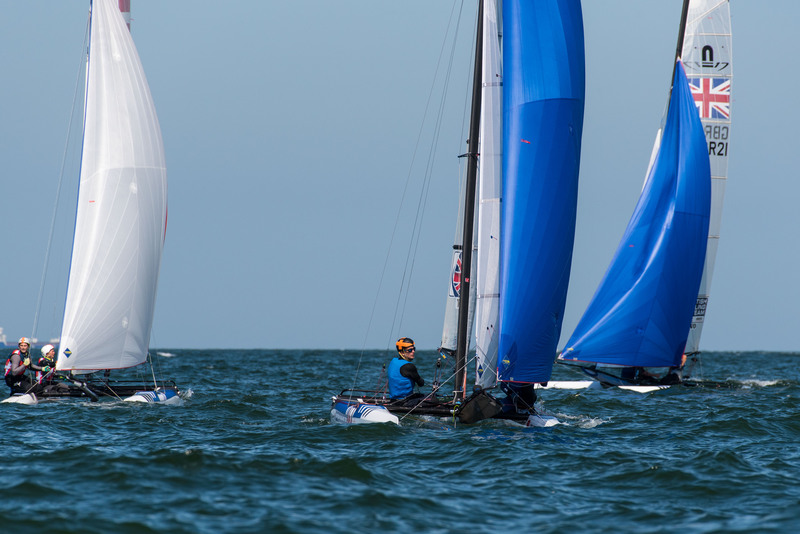 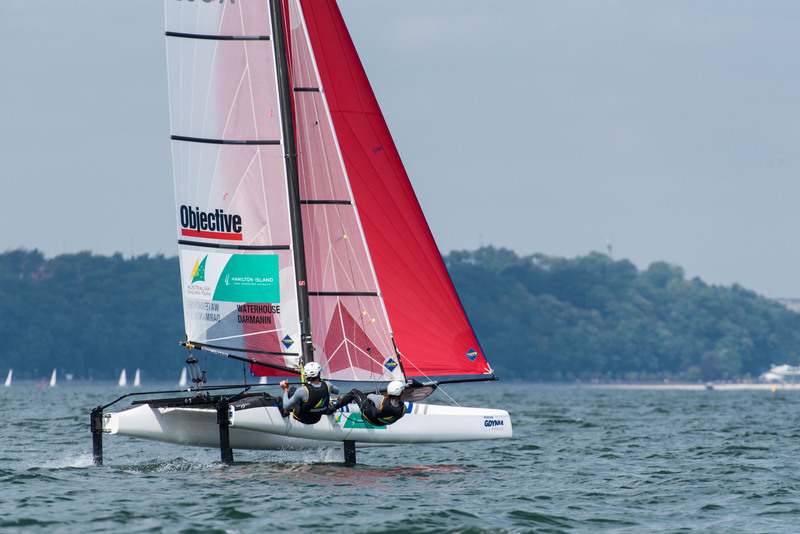 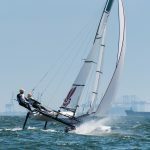 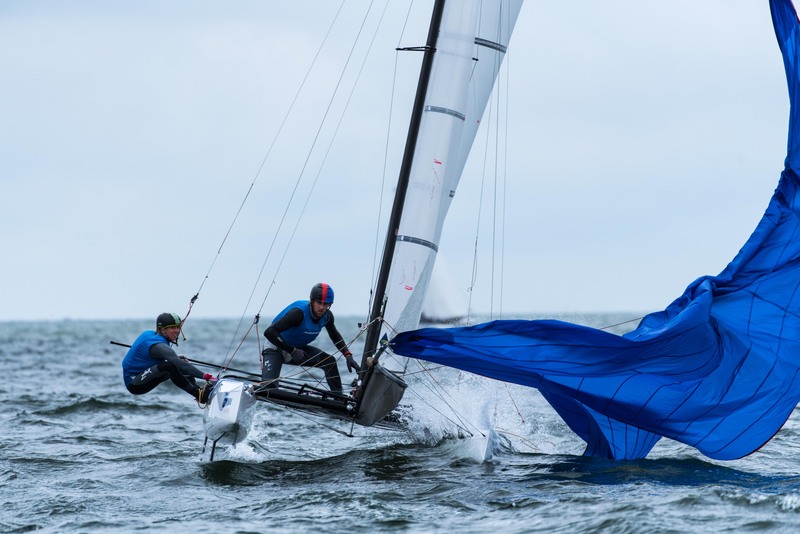 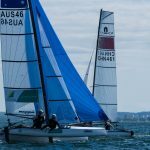 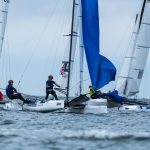 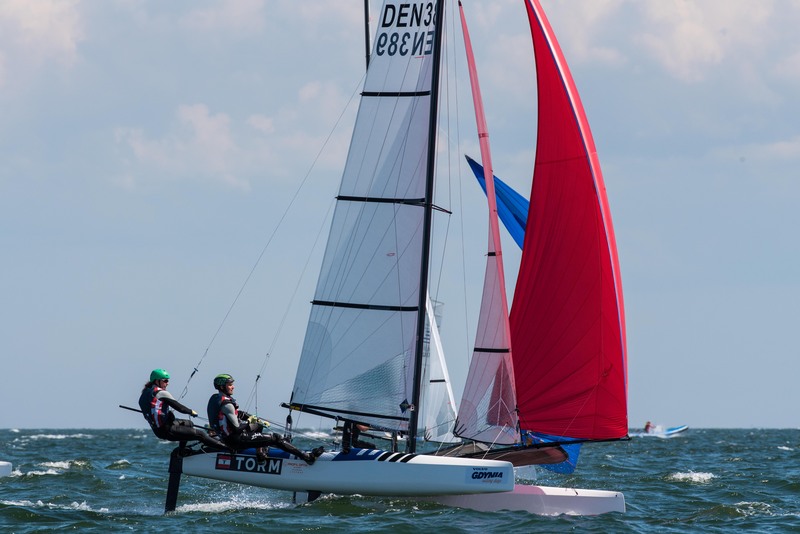 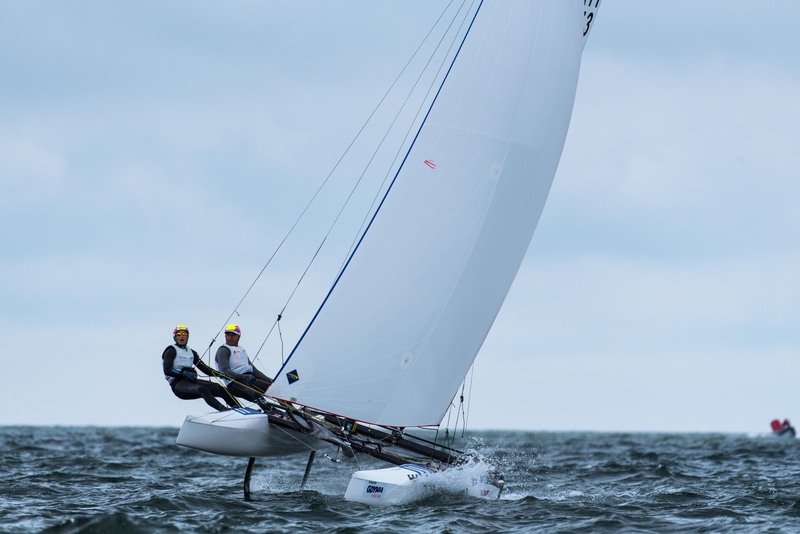 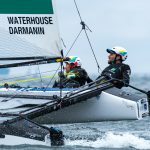 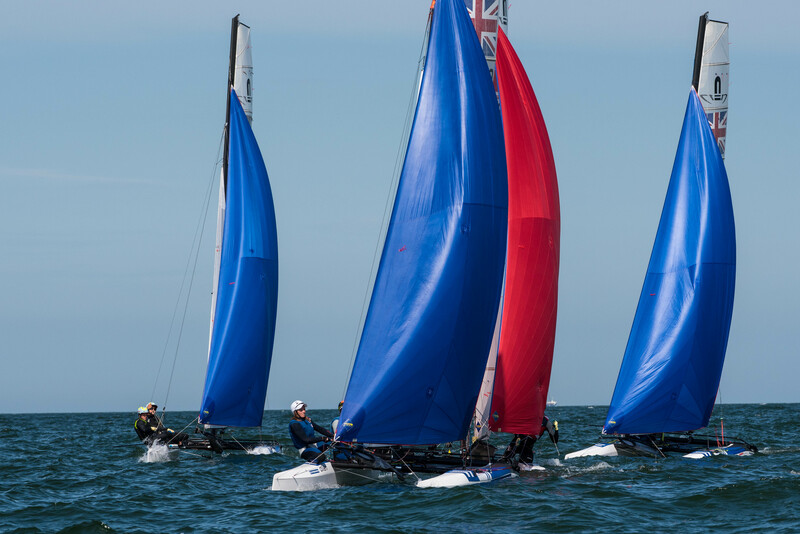 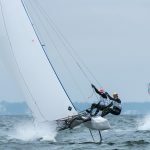 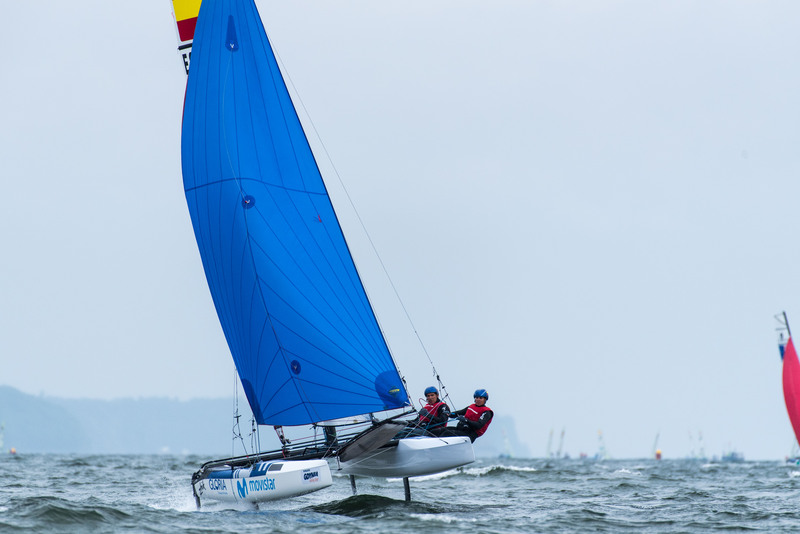 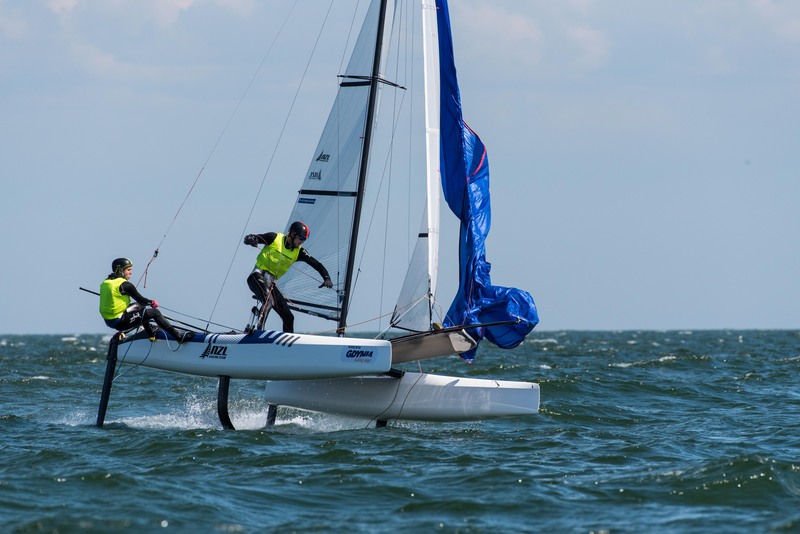 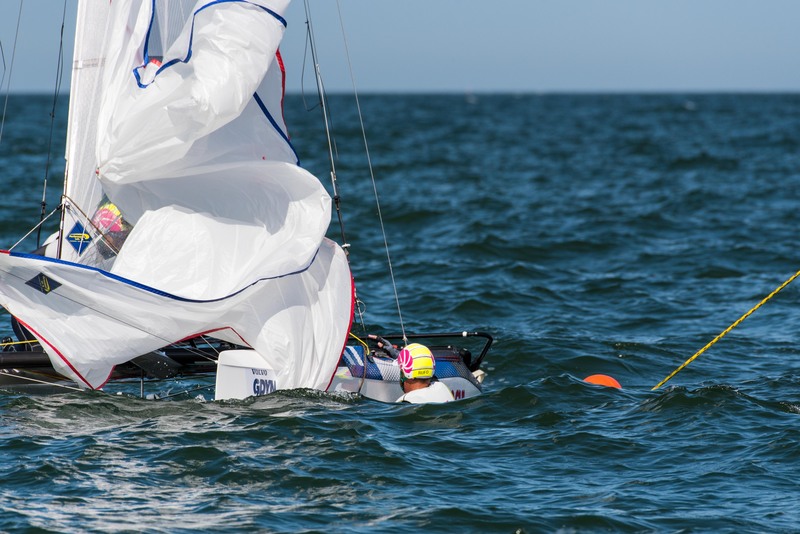 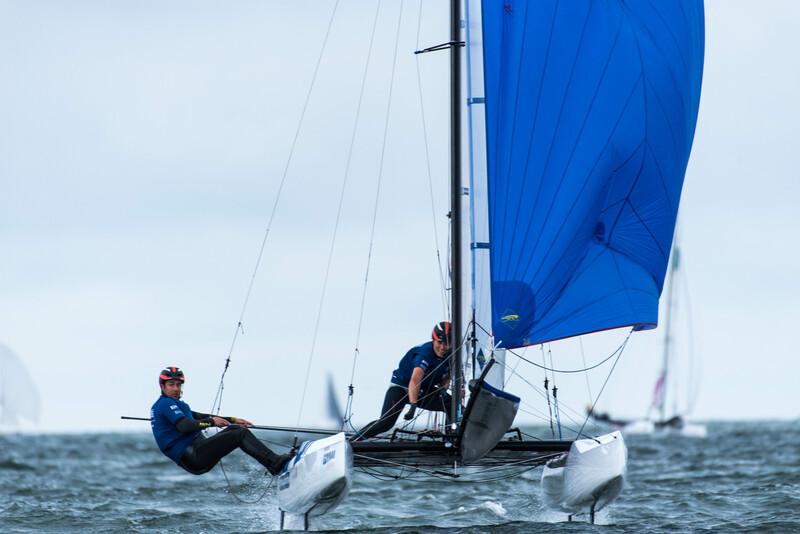 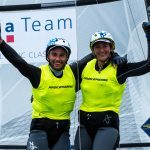 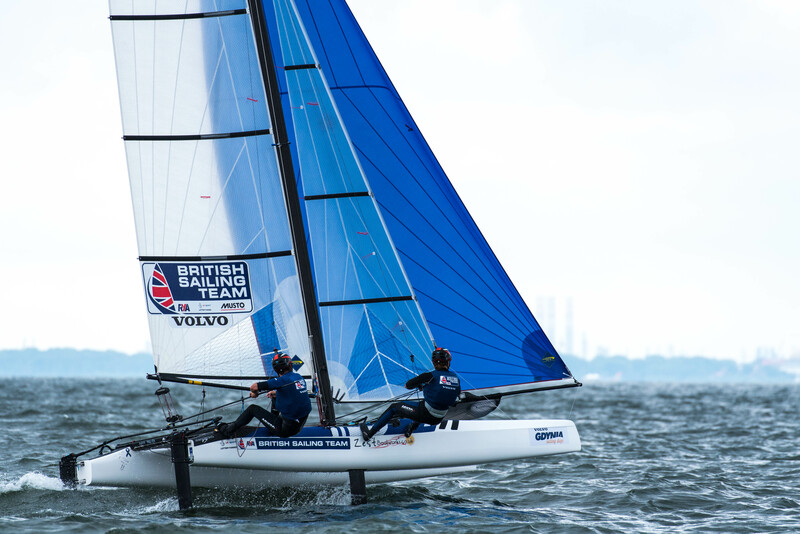 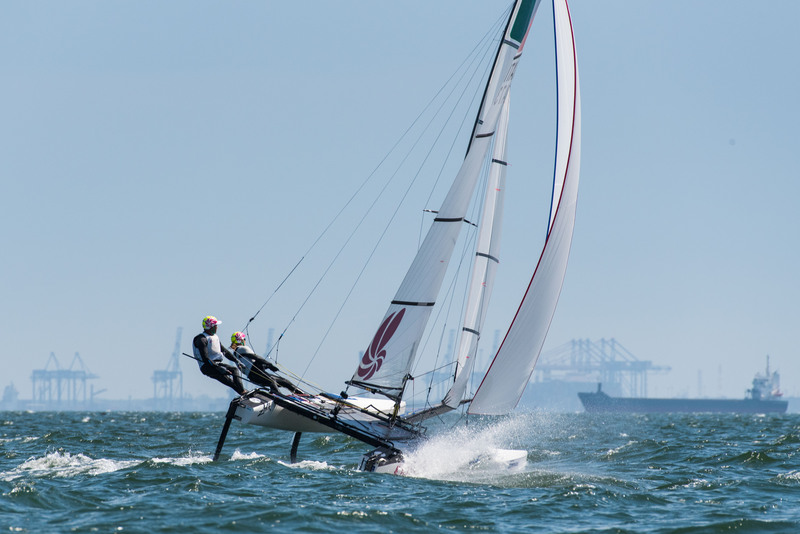 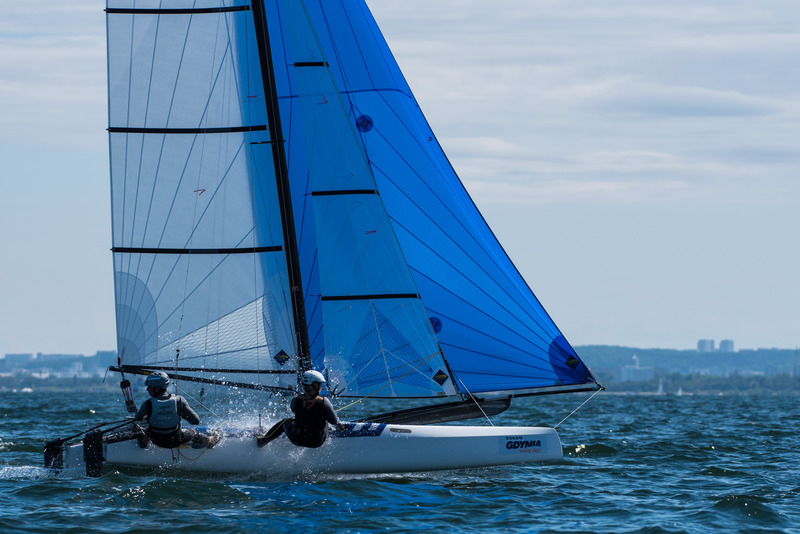 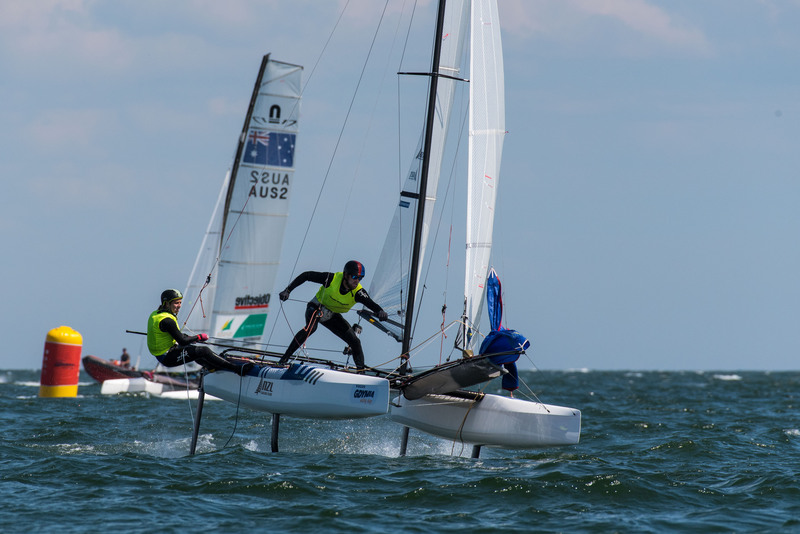 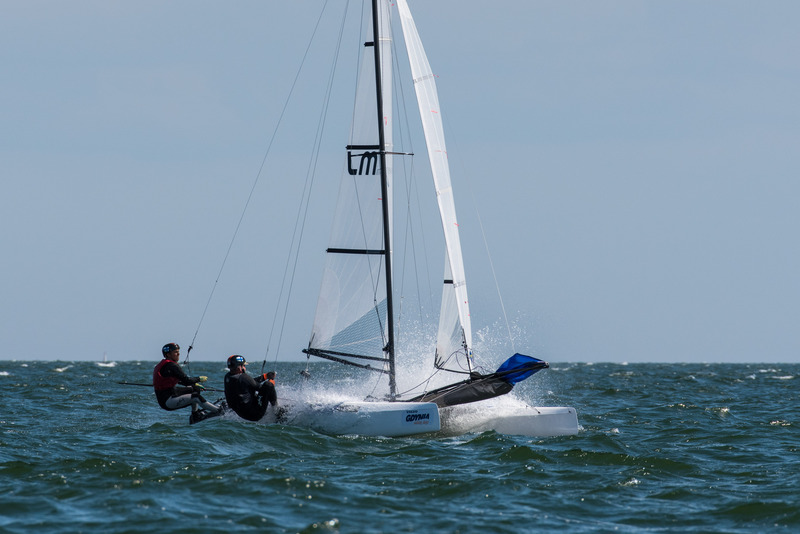 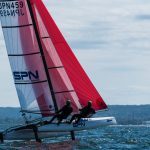 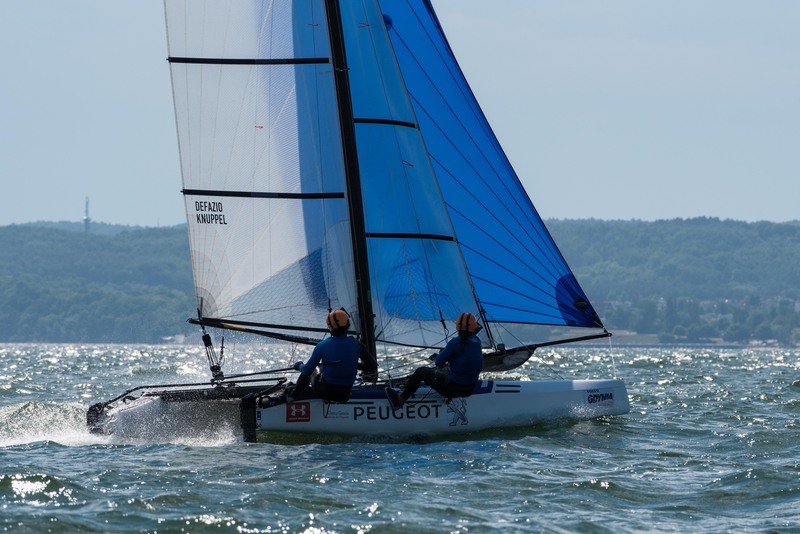 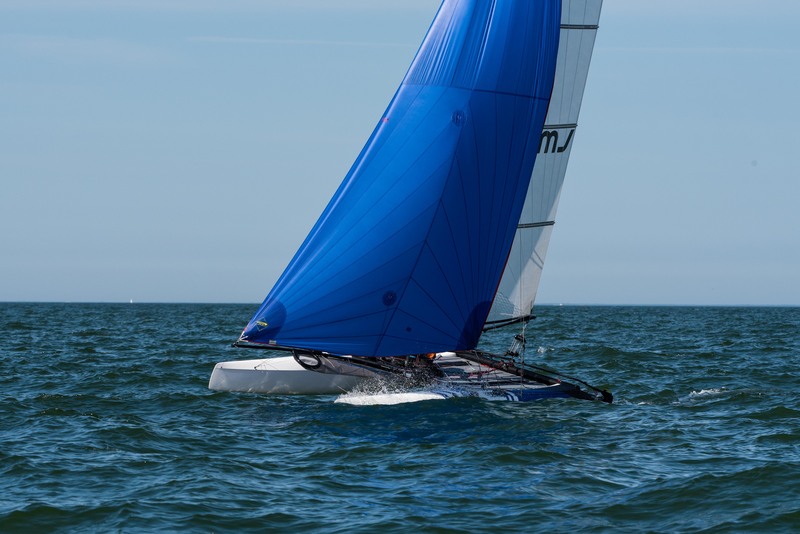 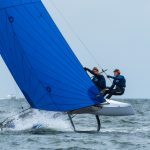 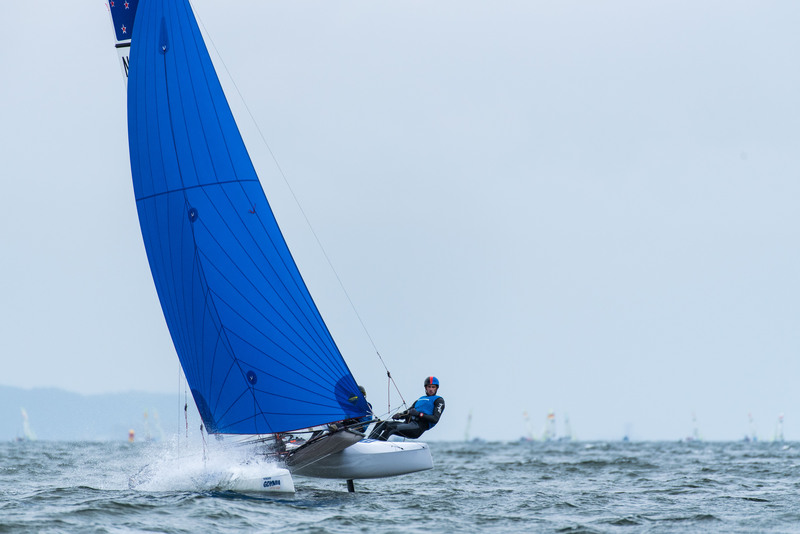 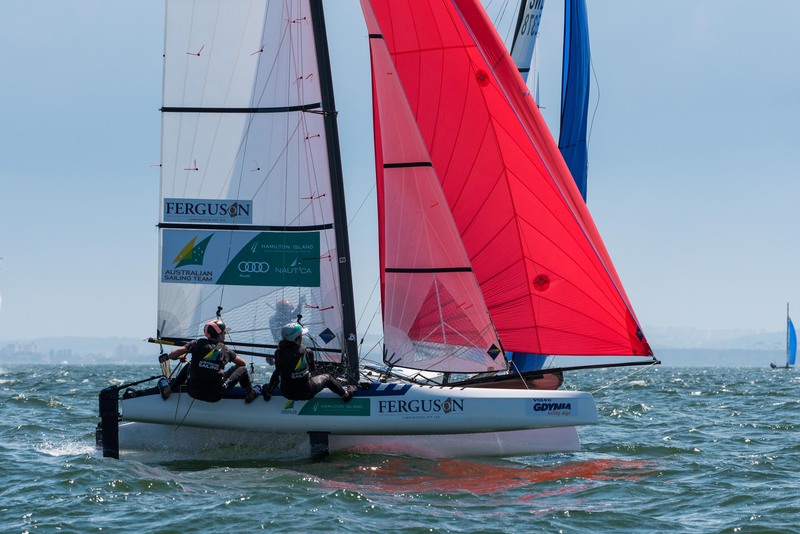 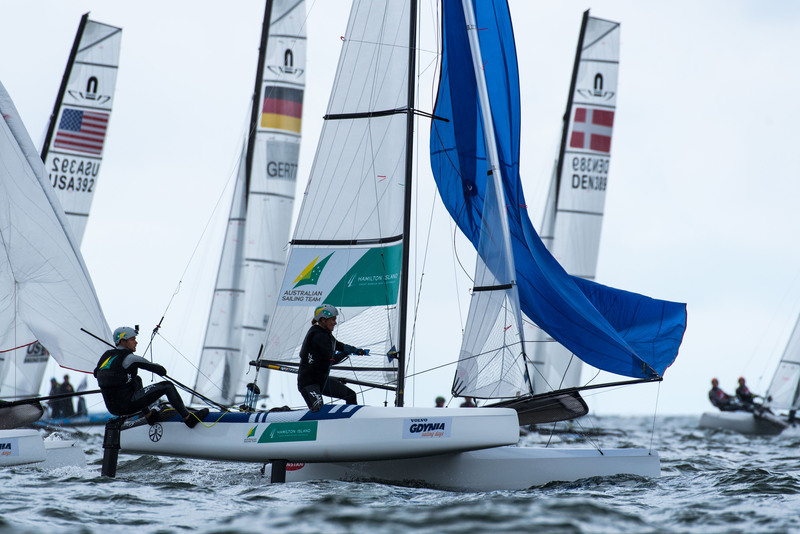 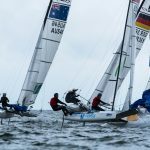 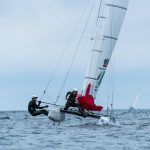 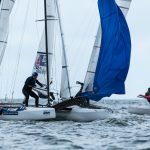 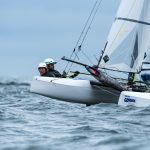 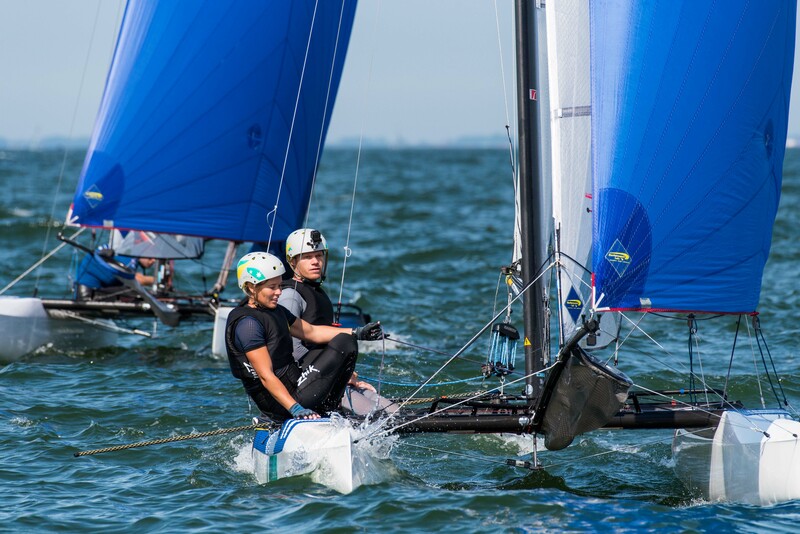 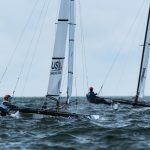 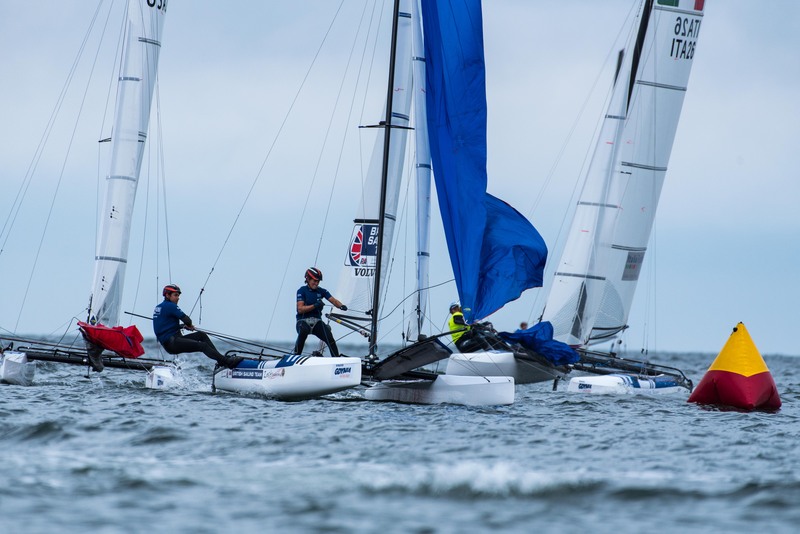 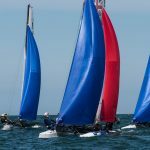 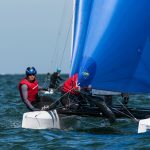 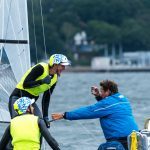 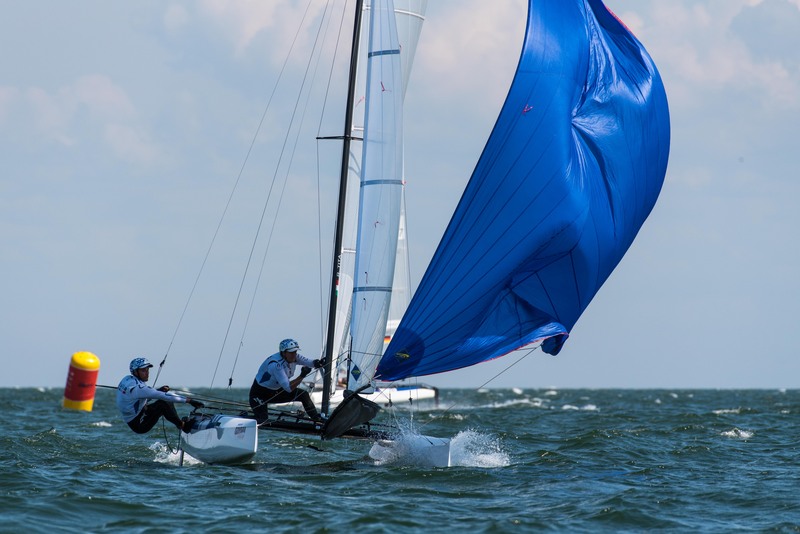 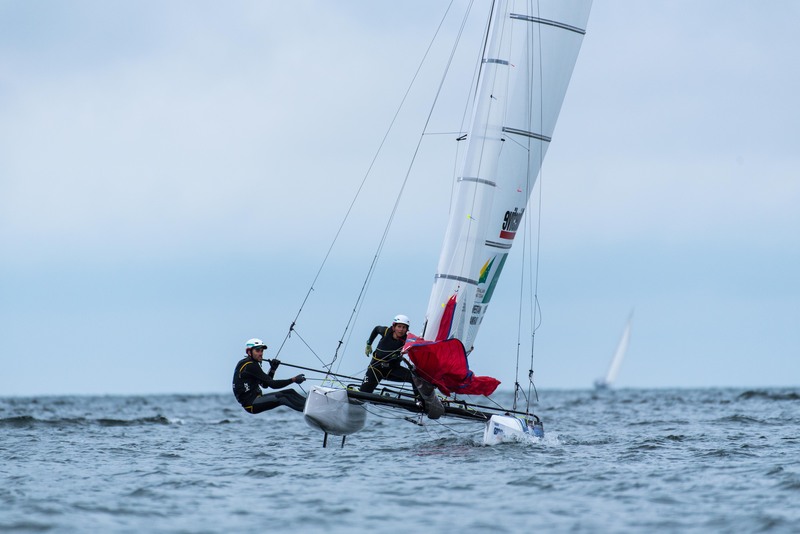 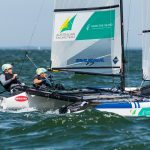 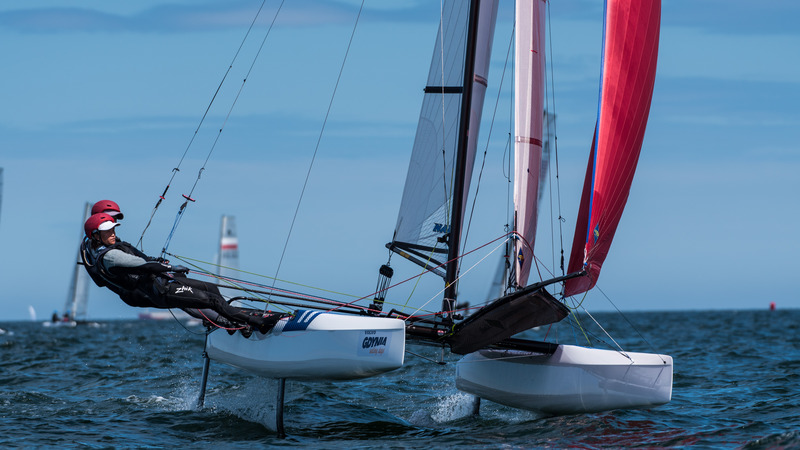 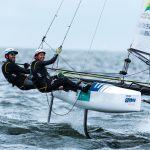 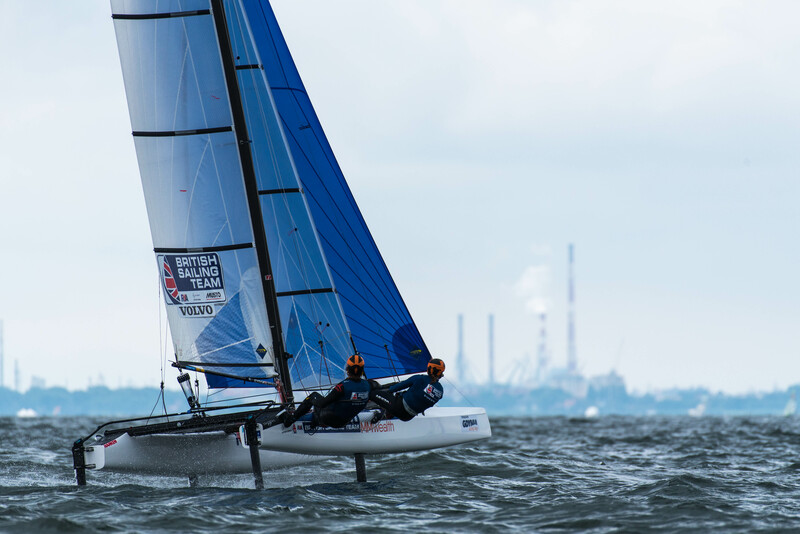 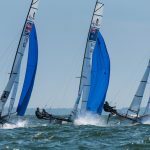 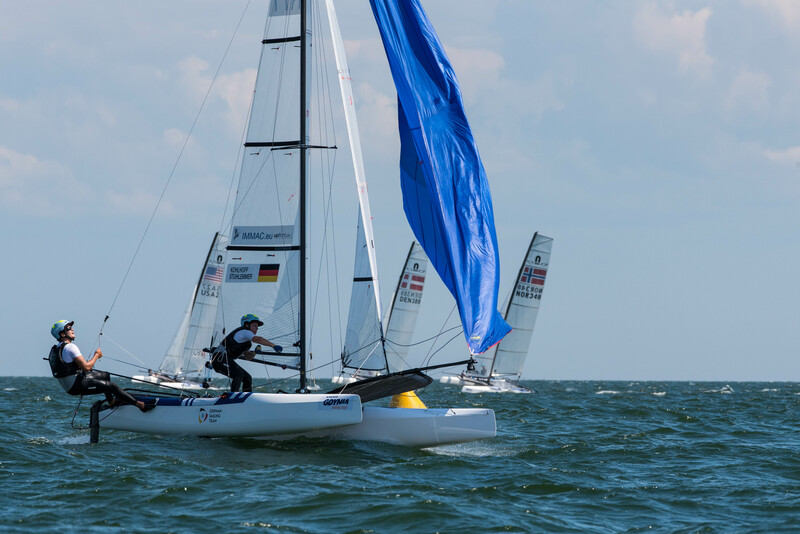 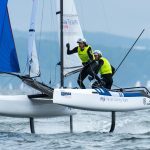 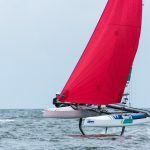 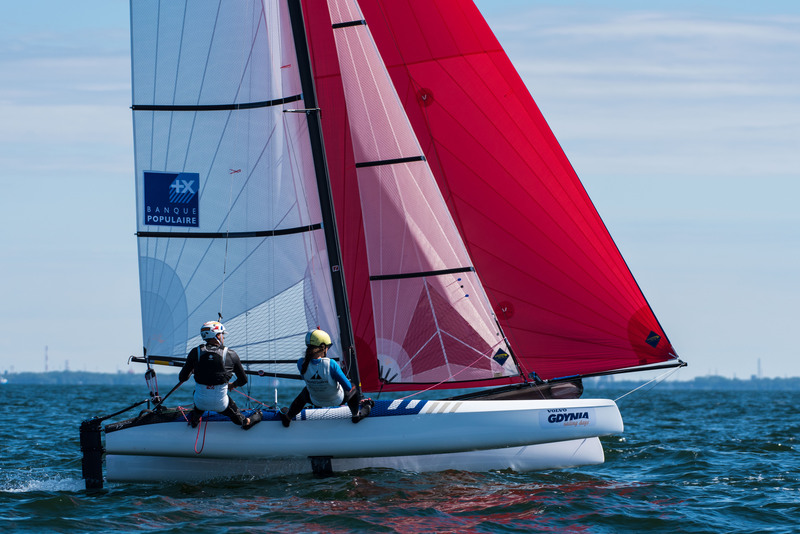 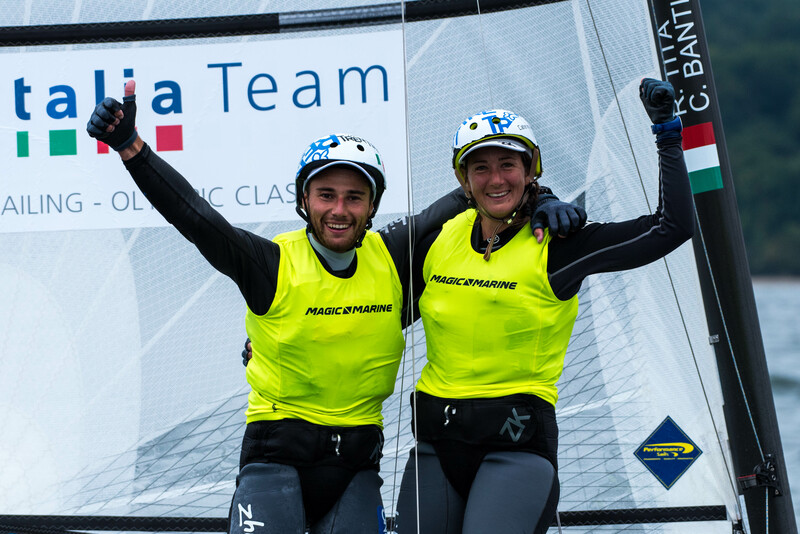 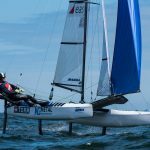 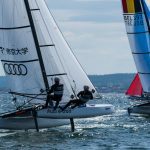 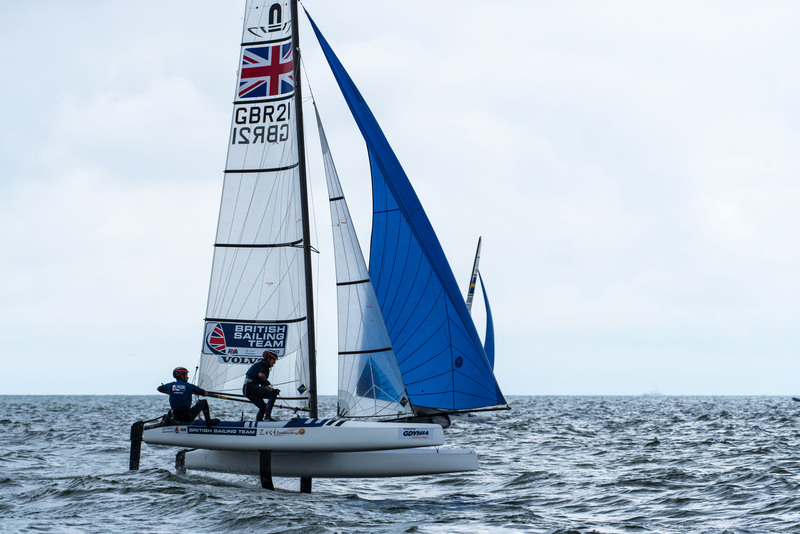 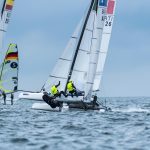 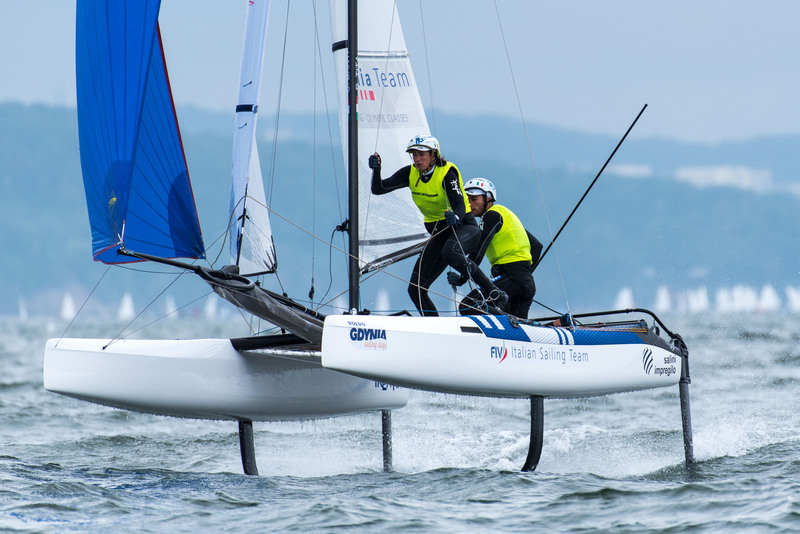 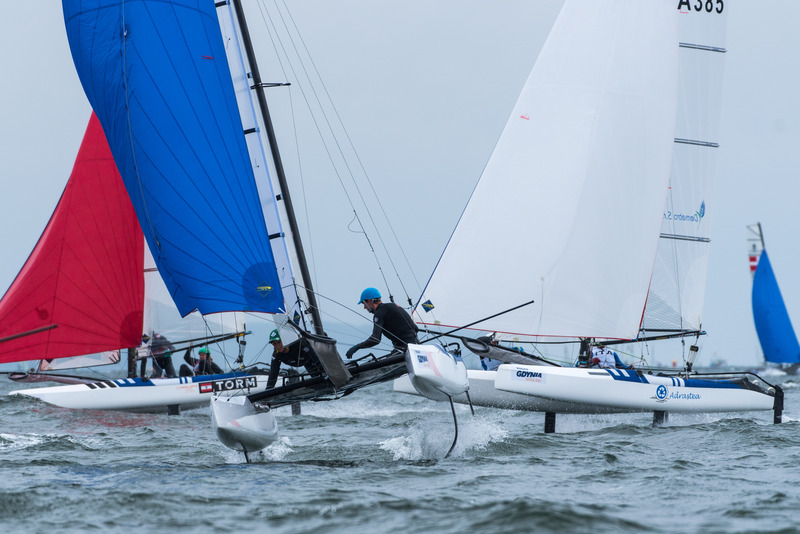 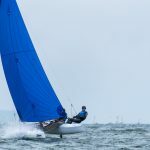 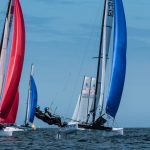 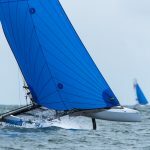 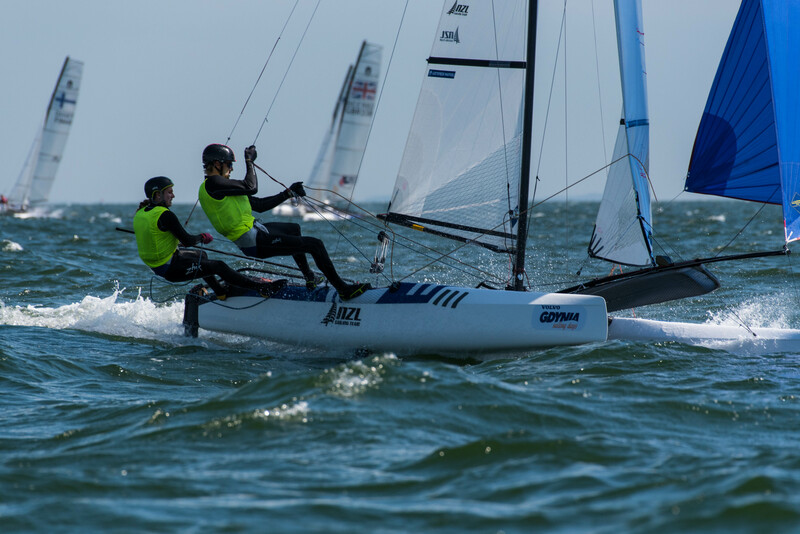 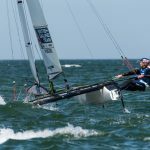 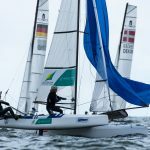 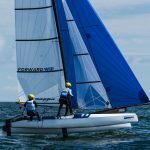 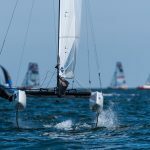 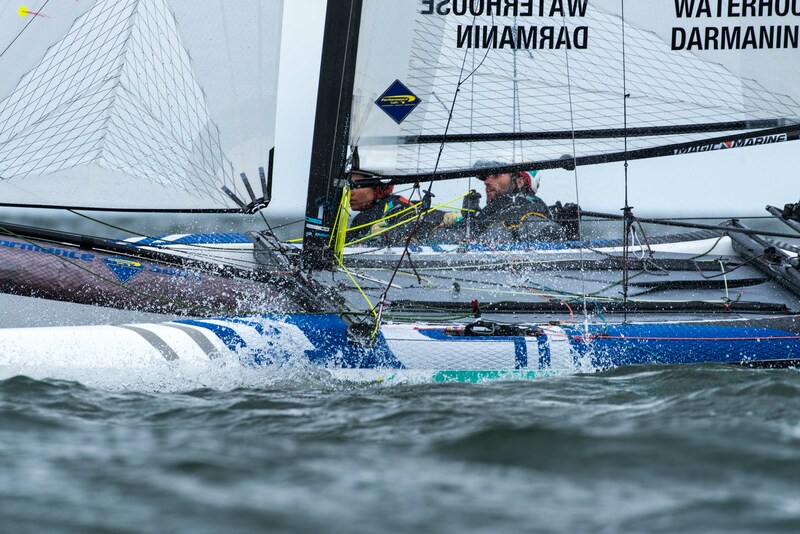 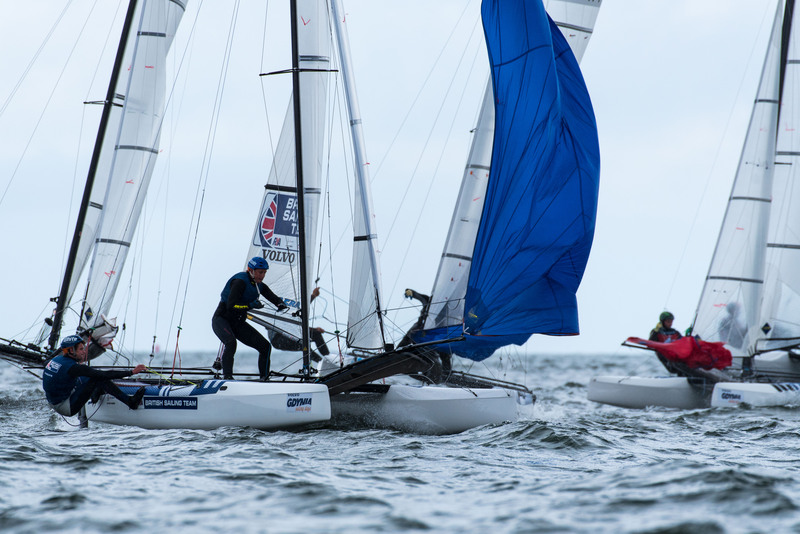 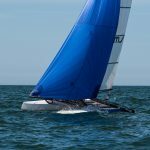 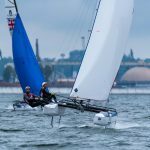 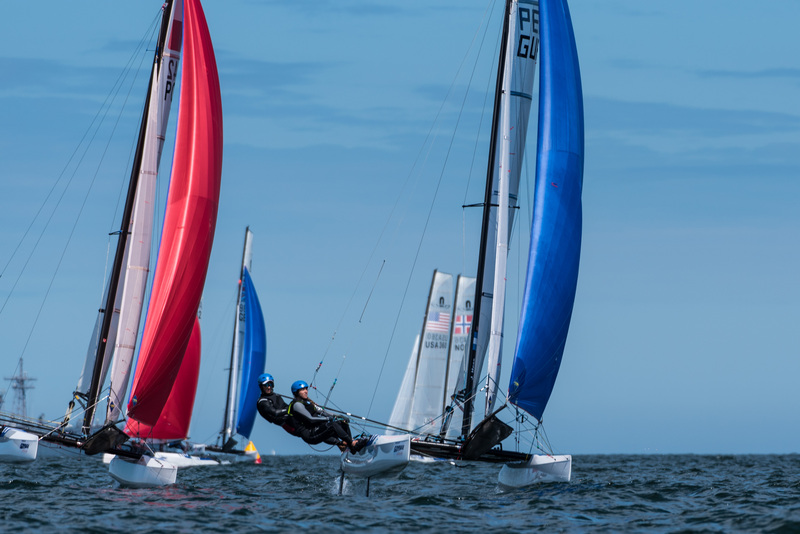 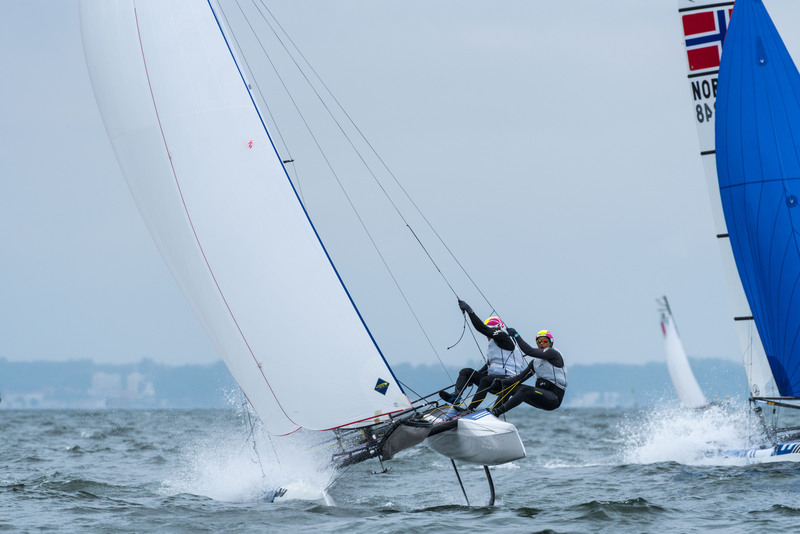 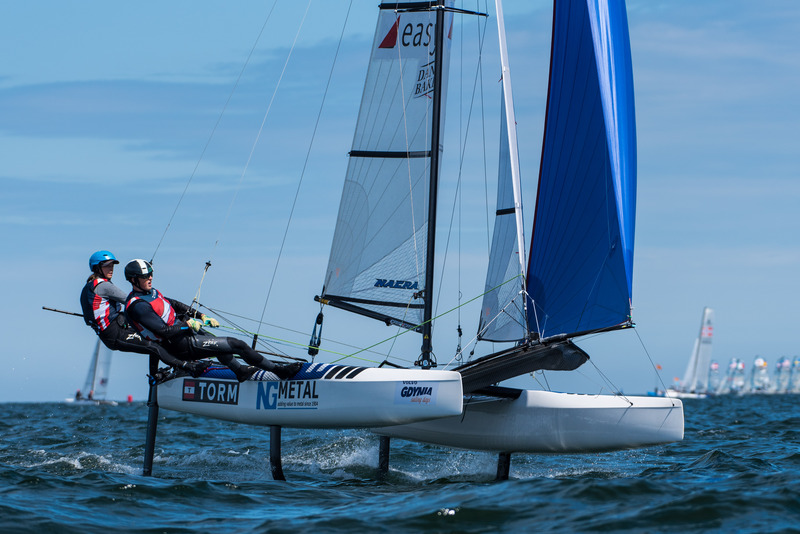 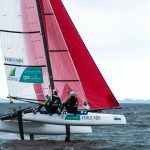 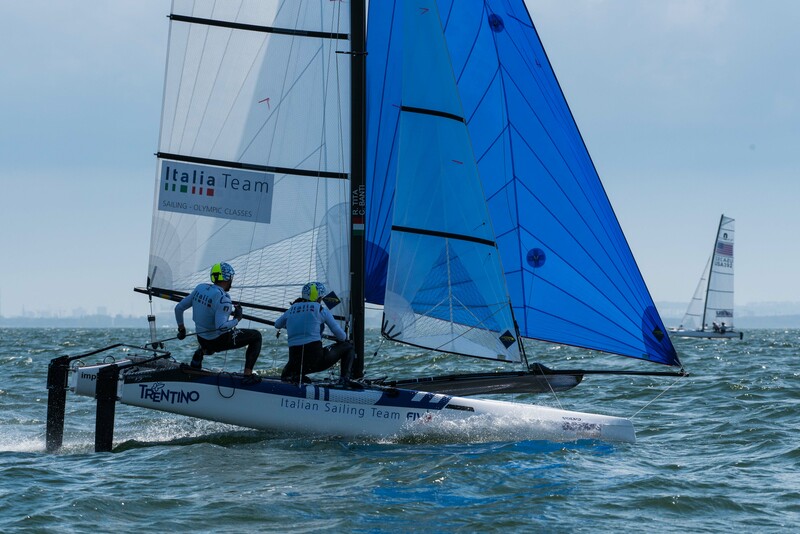 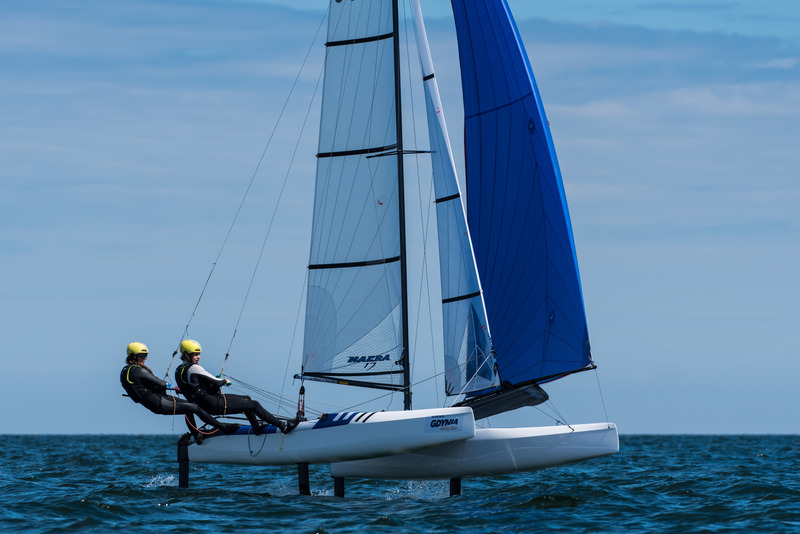 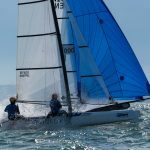 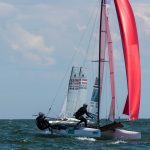 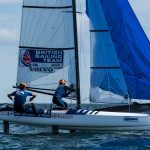 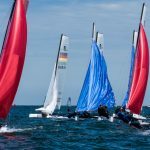 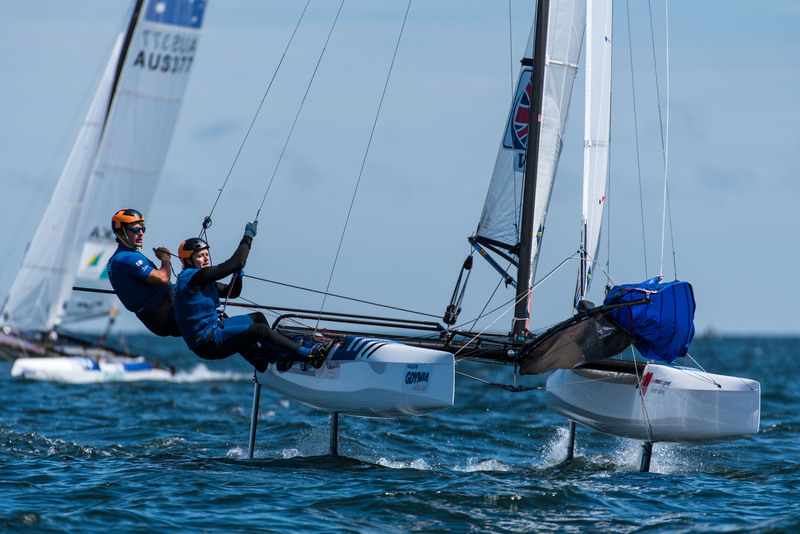 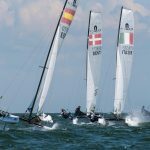 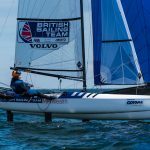 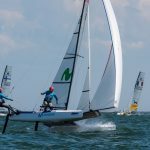 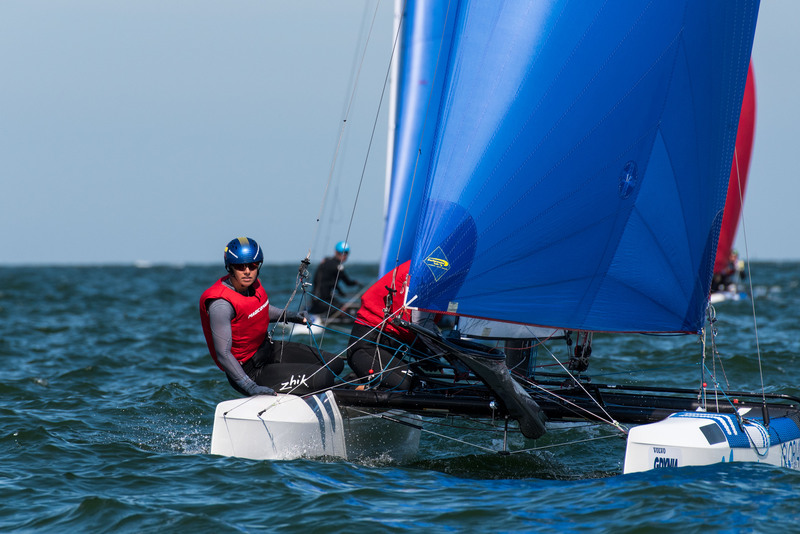 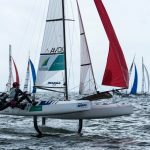 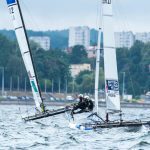 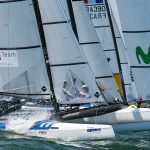 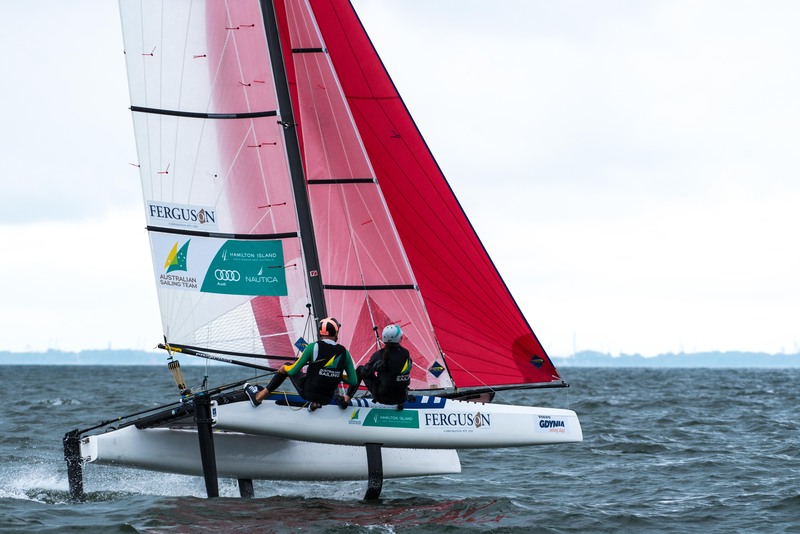 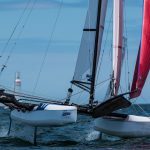 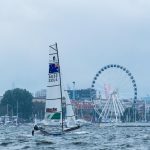 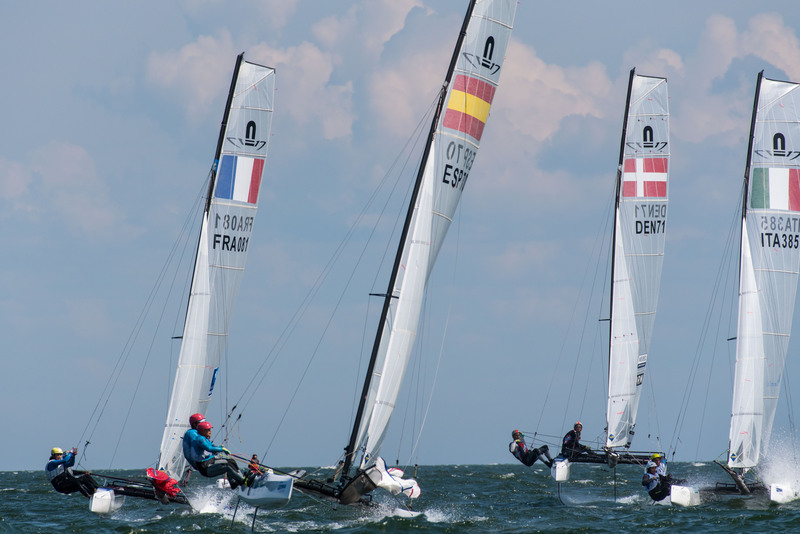 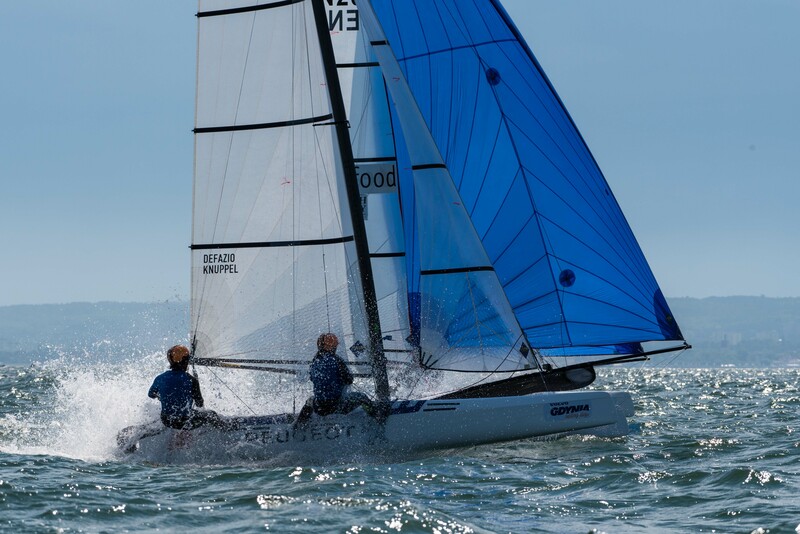 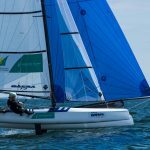 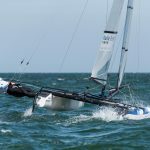 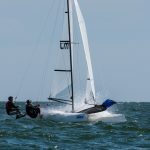 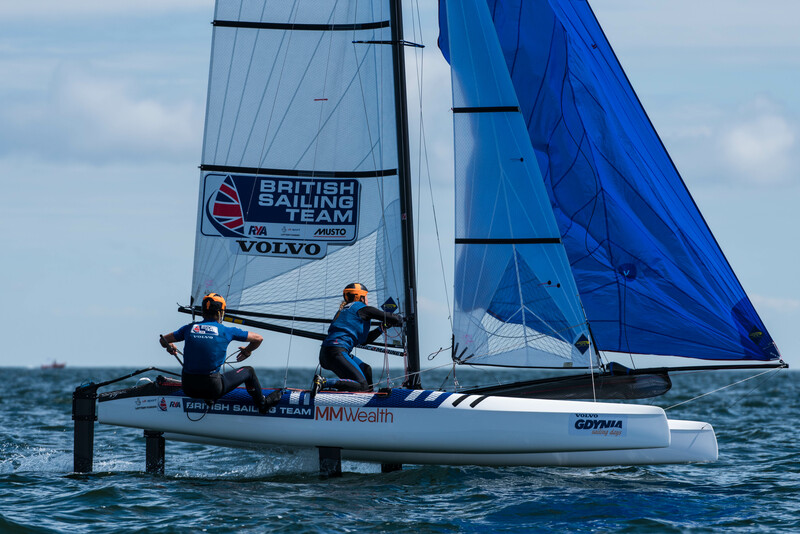 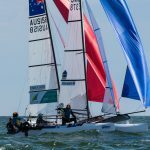 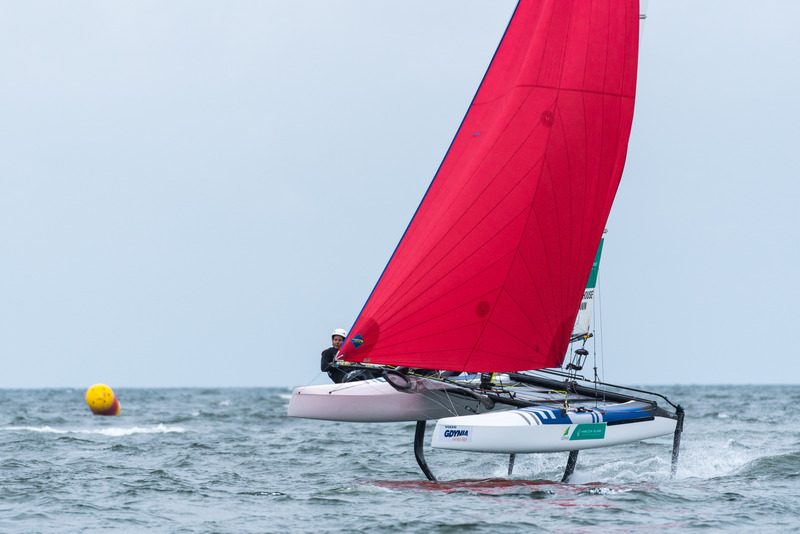 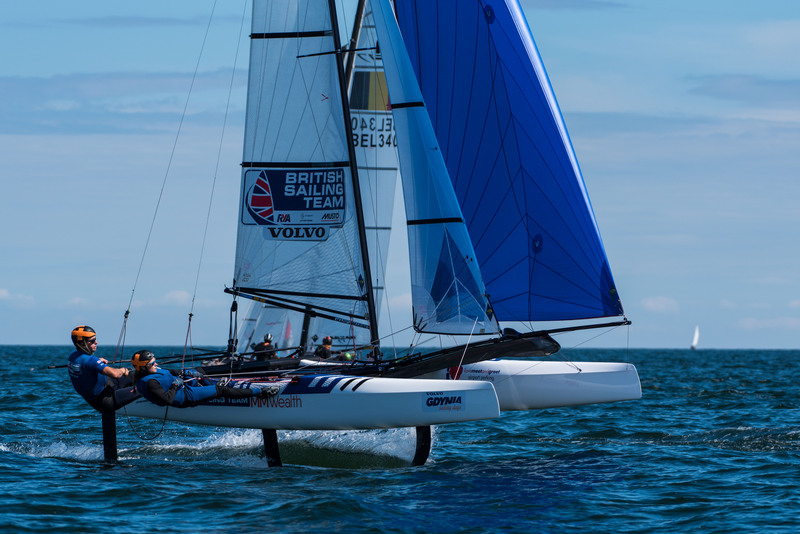 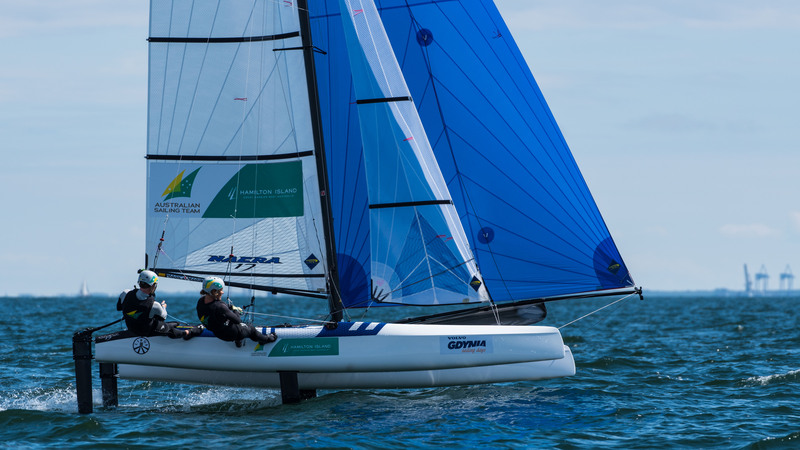 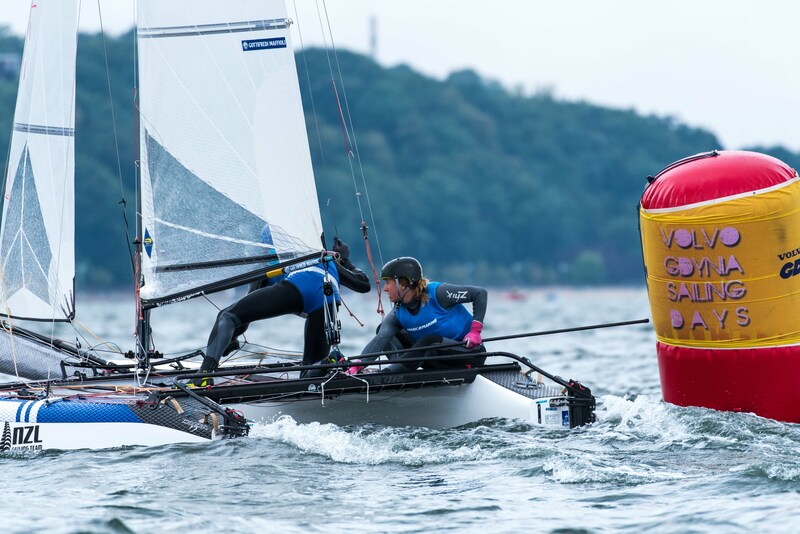 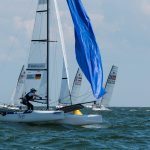 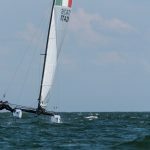 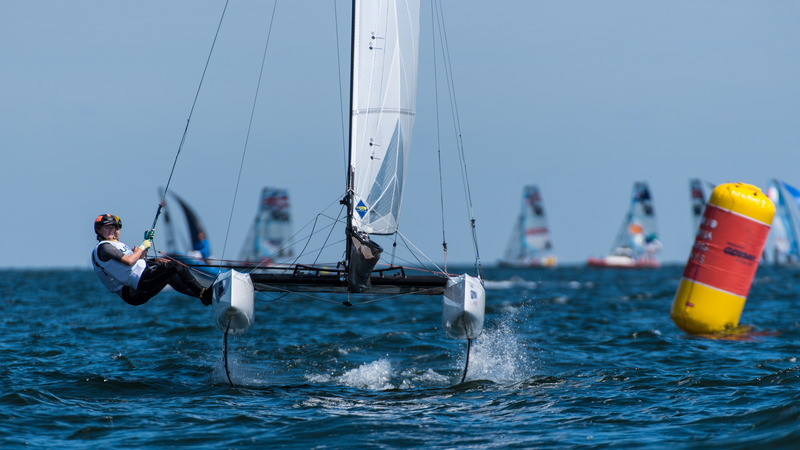 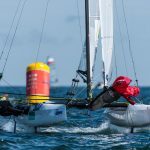 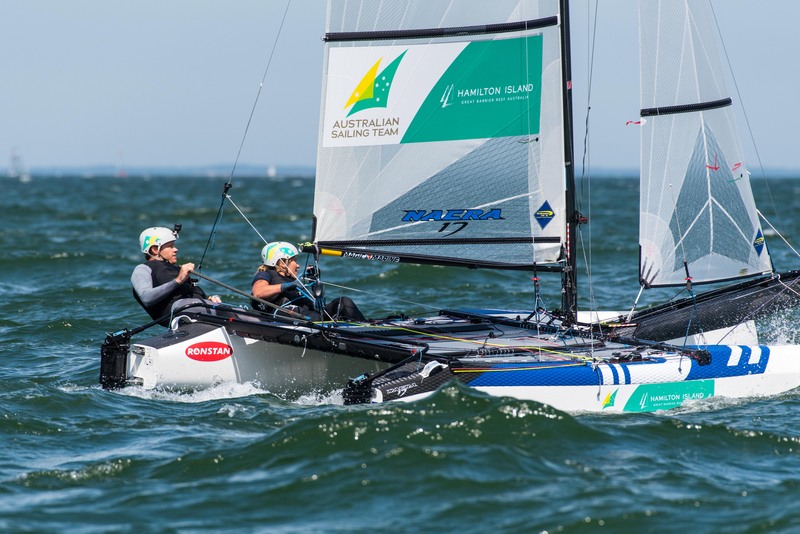 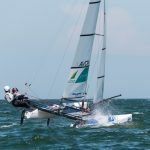 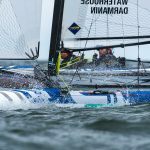 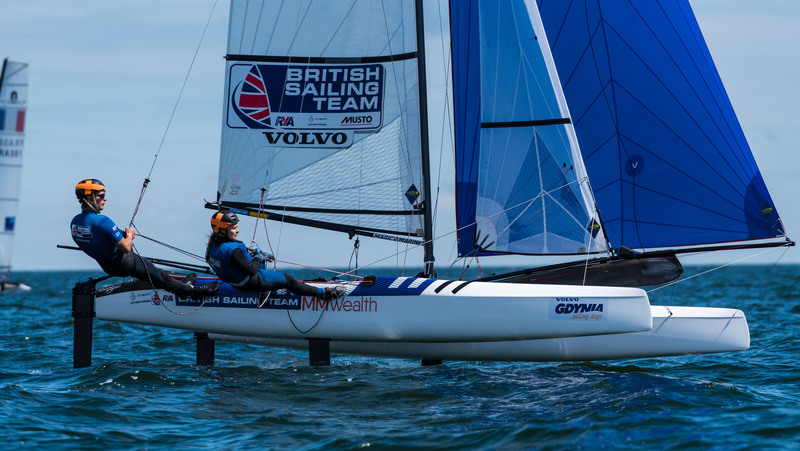 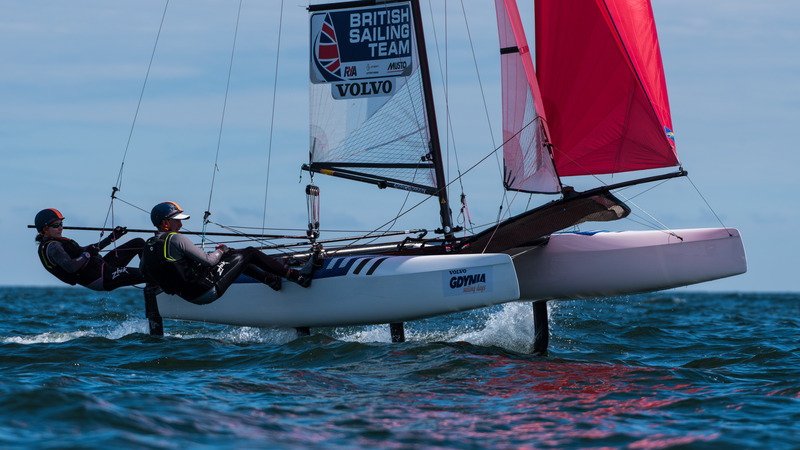 “We really enjoy racing in them.” Naess and Ronningen have stacked up a strong 2018 season, the duo making huge progress since a frustrating finish deep in the 20s just a year ago at the 49erFX European Championship in Kiel. 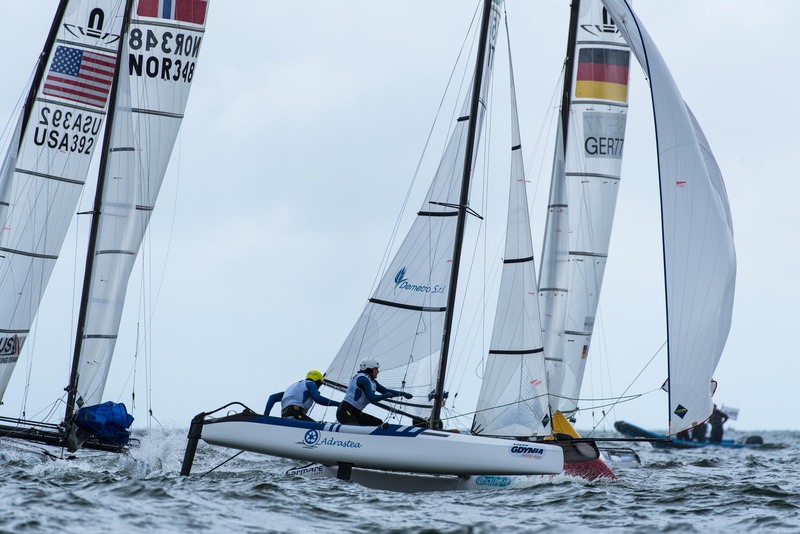 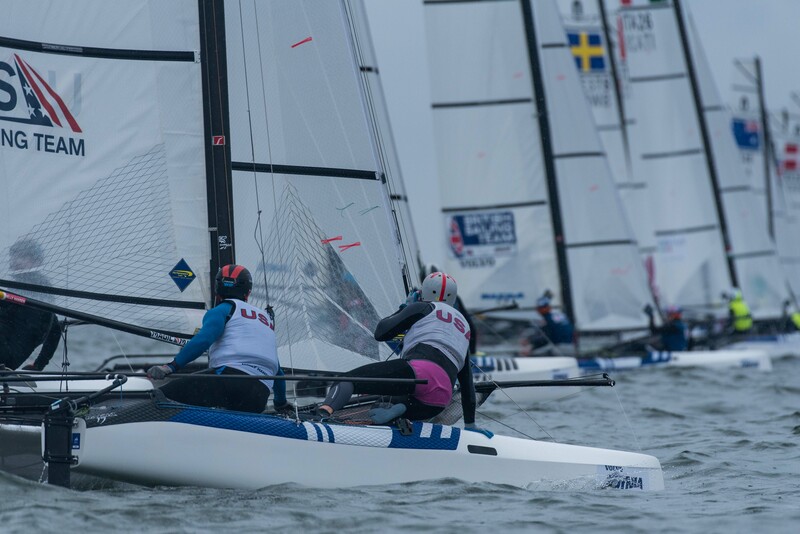 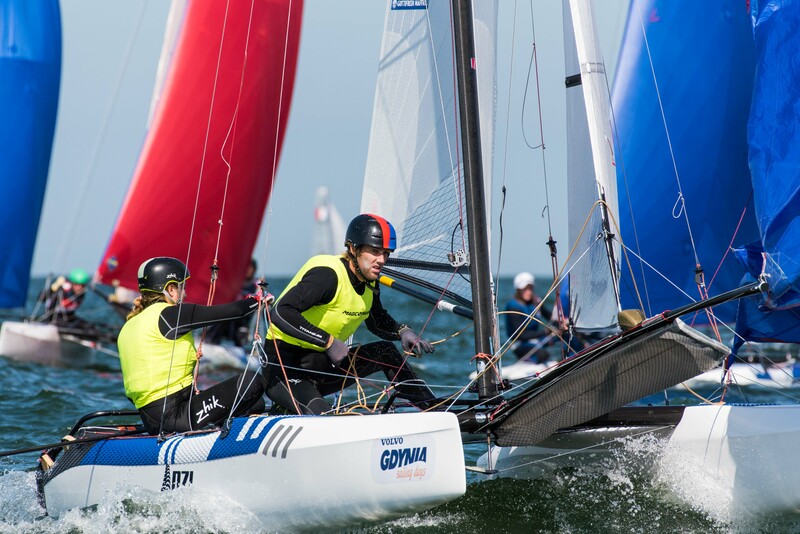 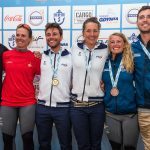 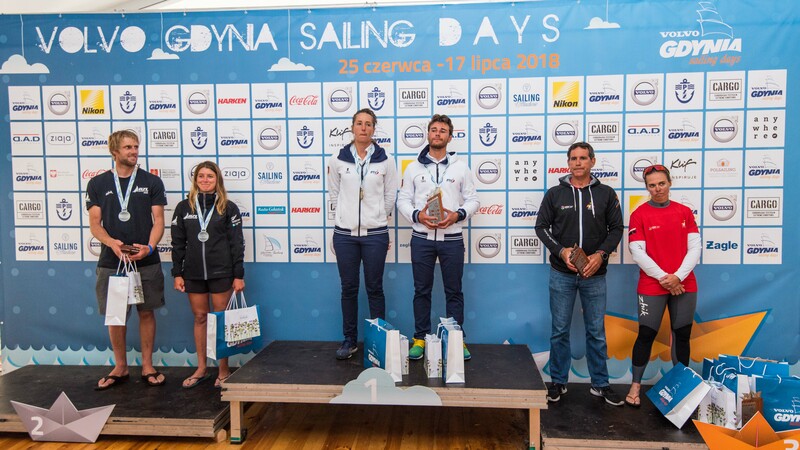 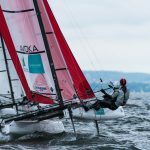 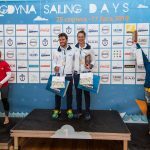 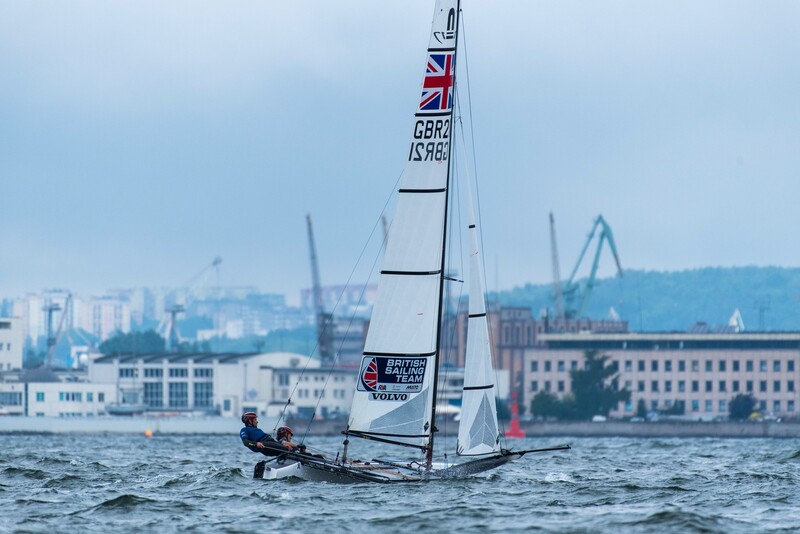 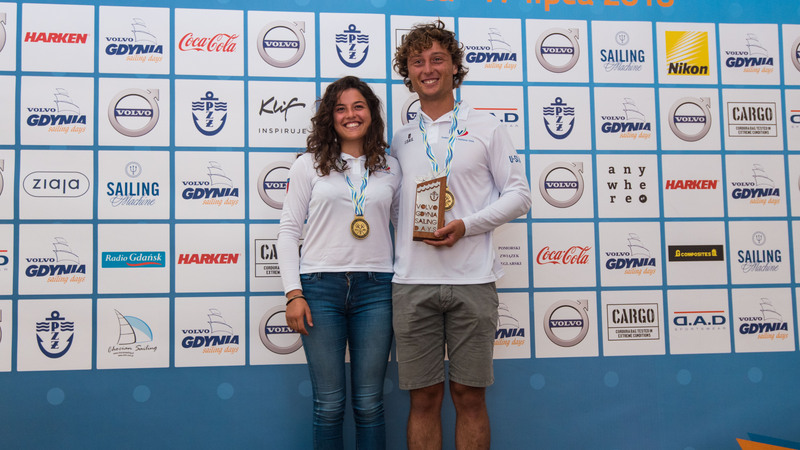 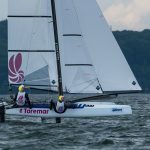 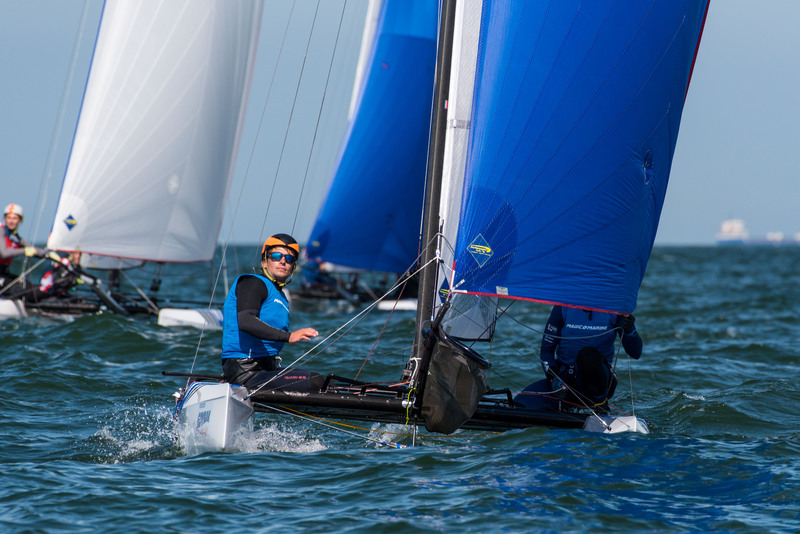 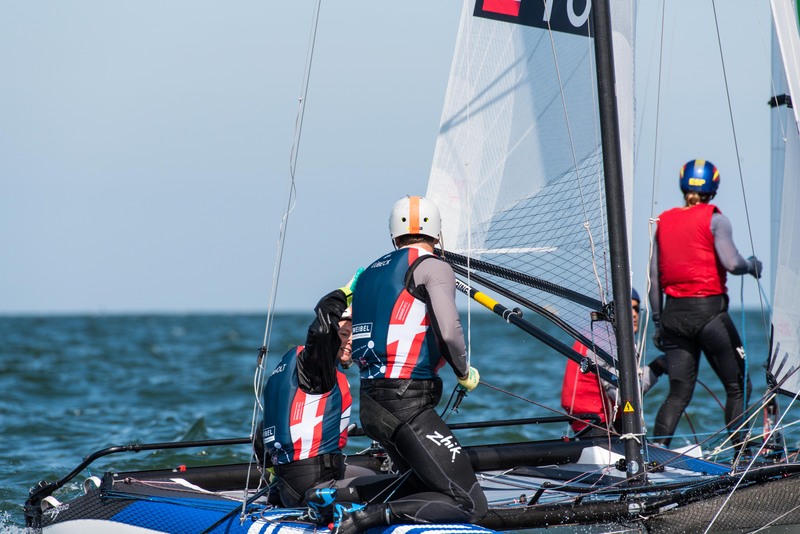 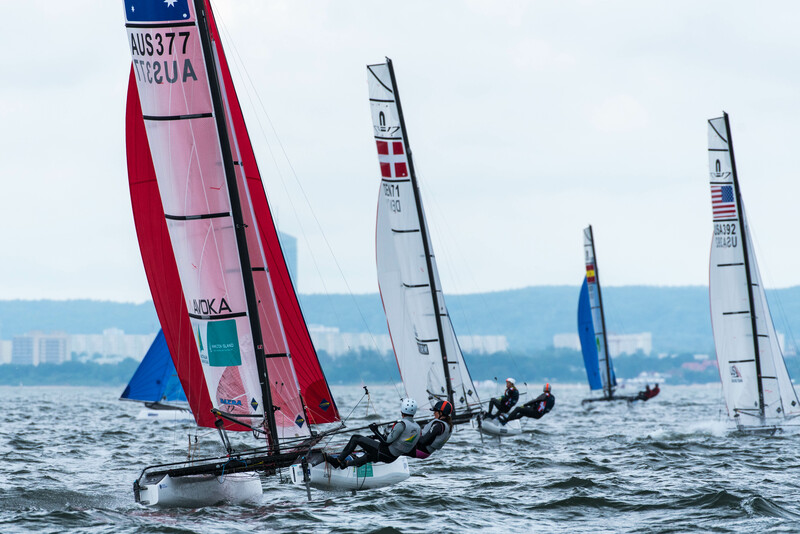 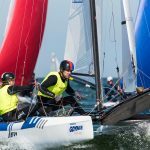 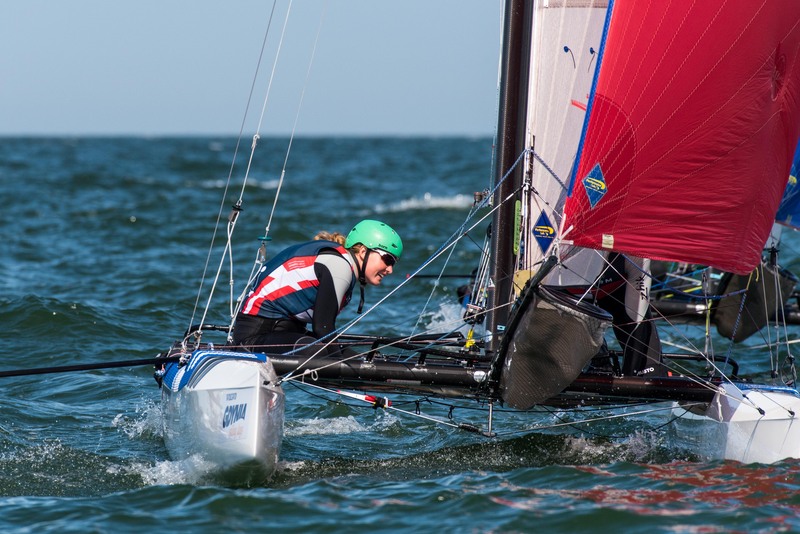 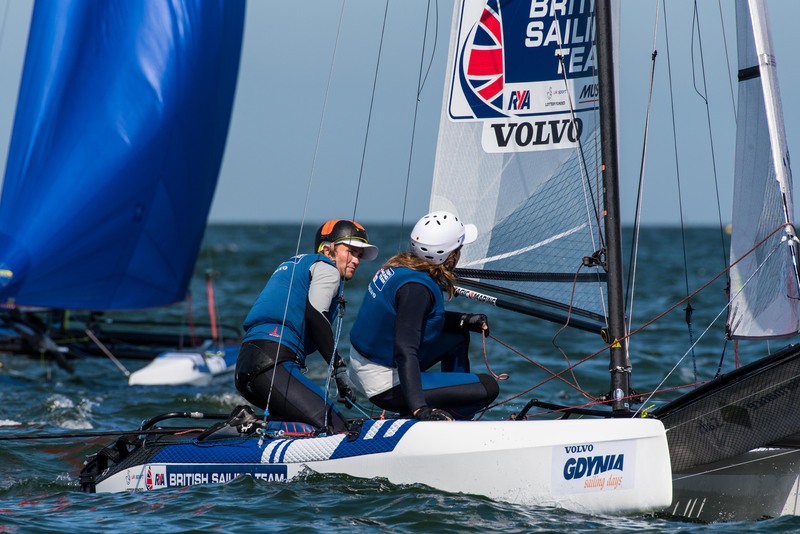 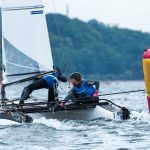 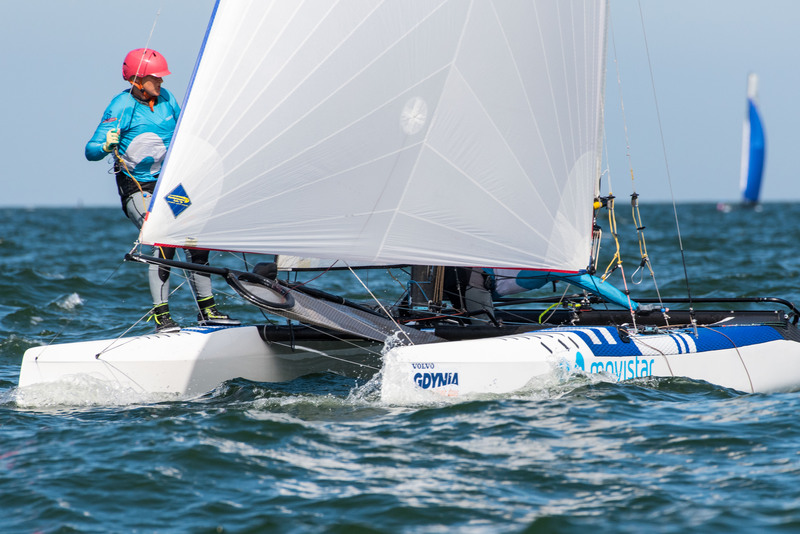 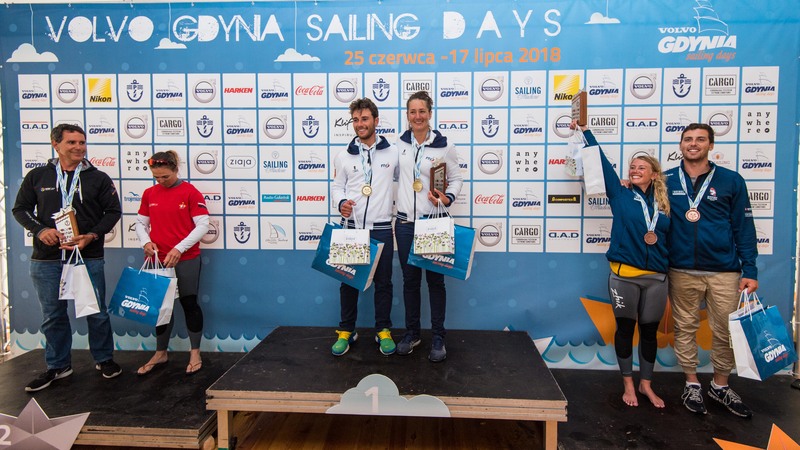 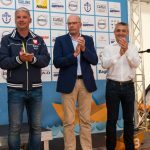 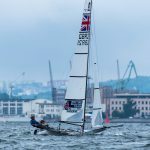 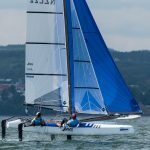 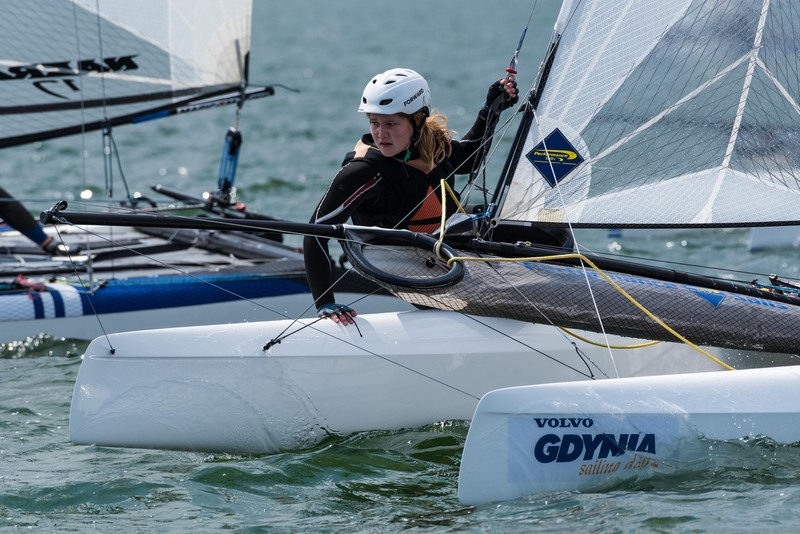 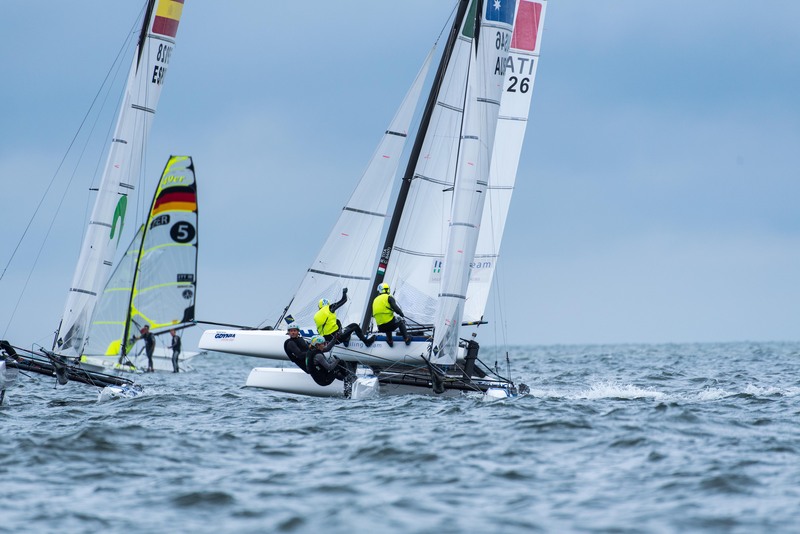 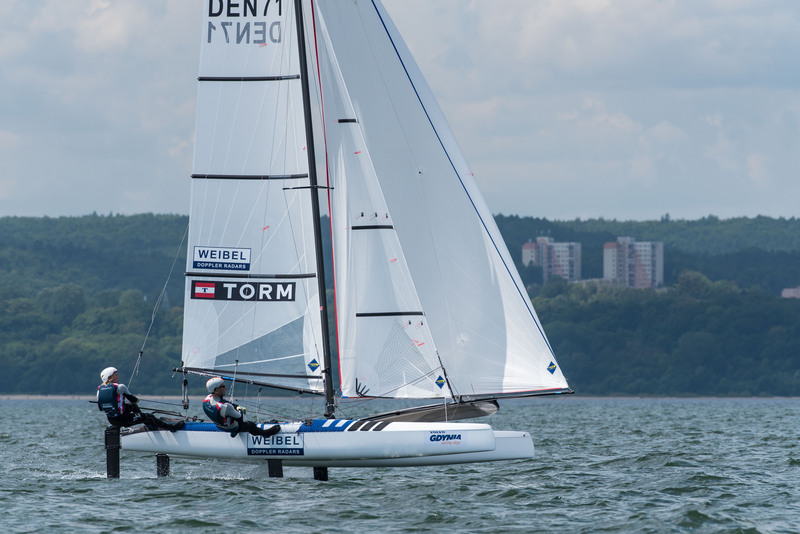 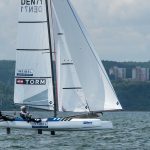 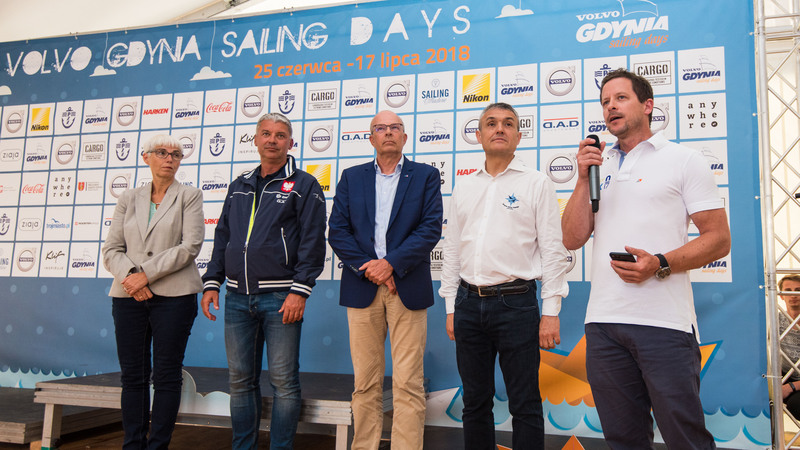 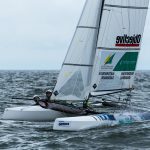 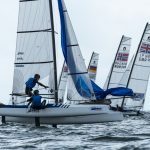 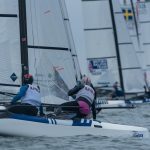 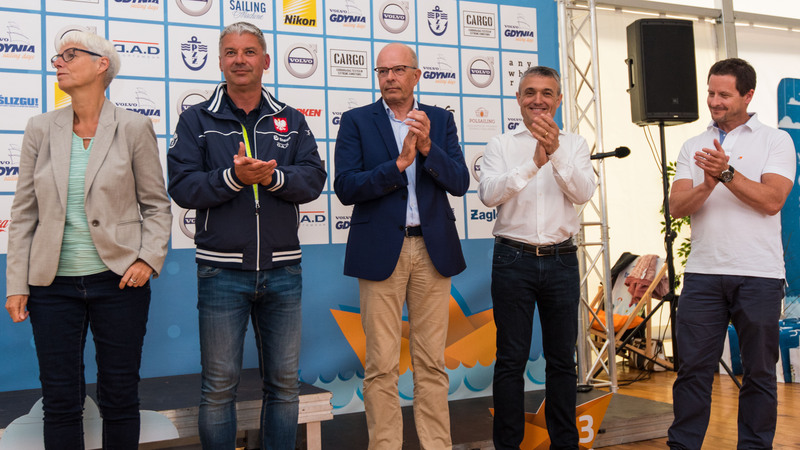 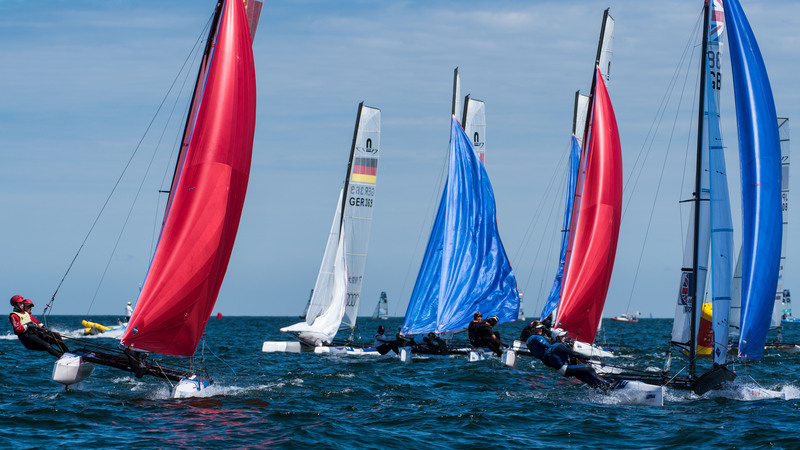 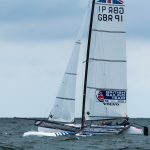 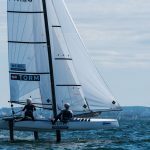 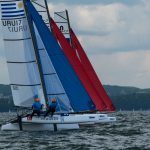 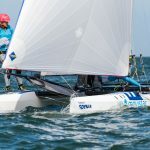 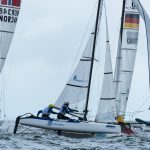 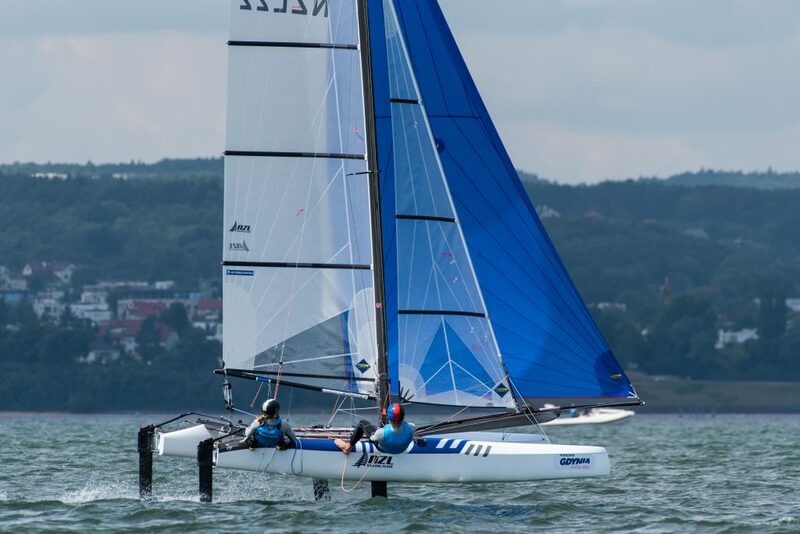 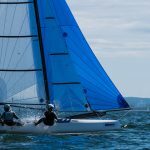 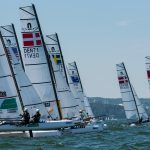 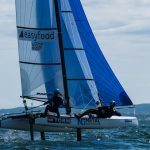 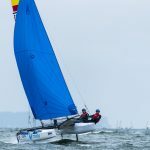 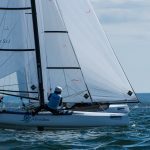 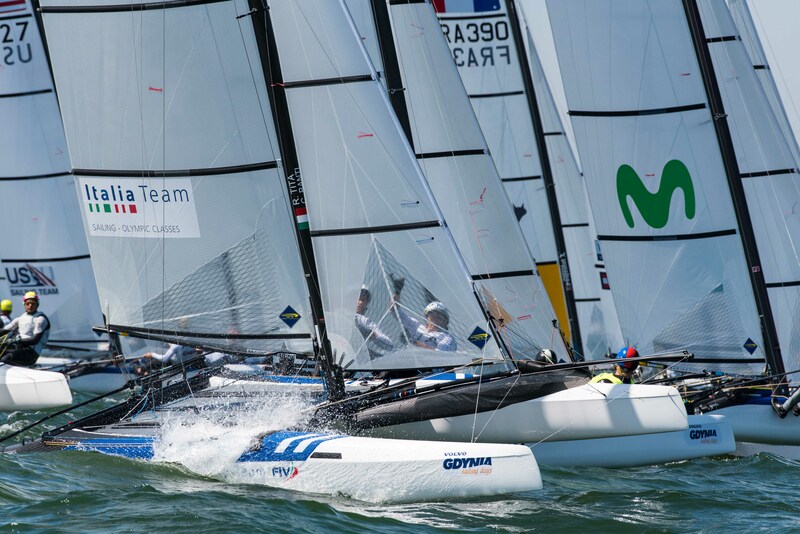 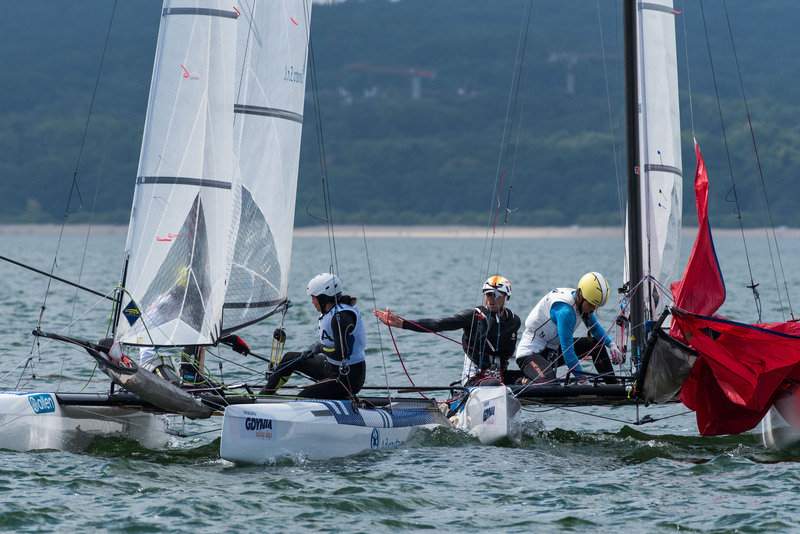 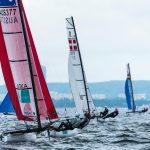 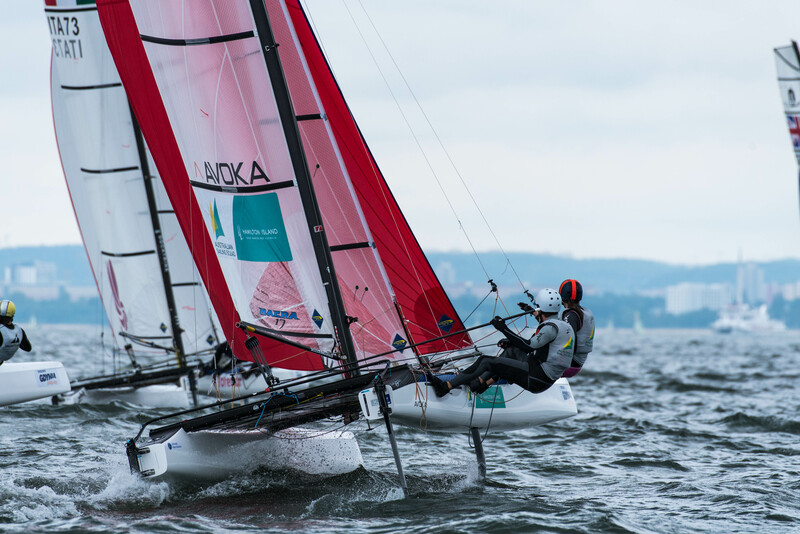 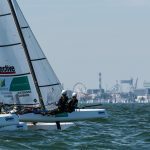 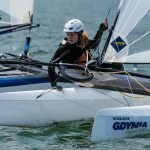 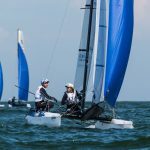 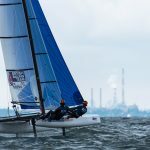 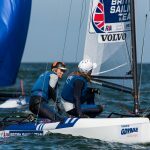 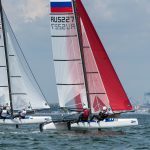 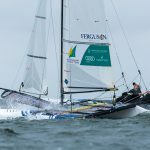 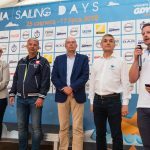 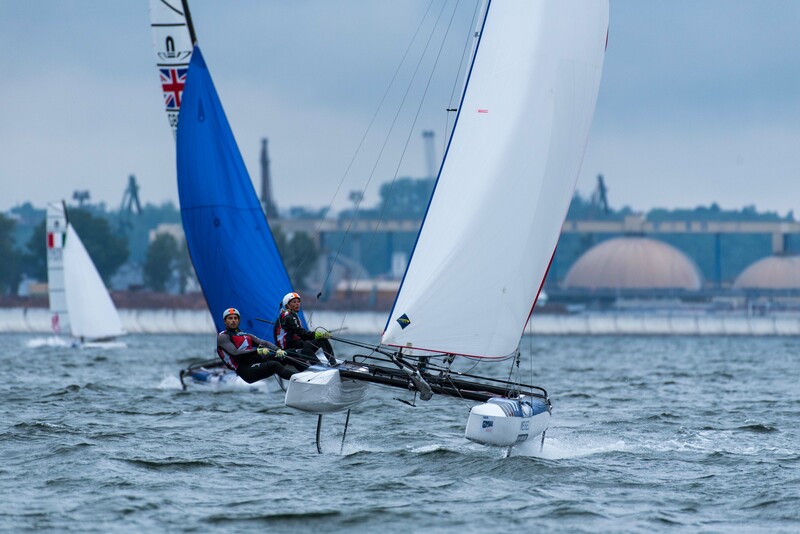 “I have never really had good luck sailing in Kiel and while we have had solid regattas in Hyeres and Palma this year, we weren’t satisfied with either our 2017 or 2018 performances in Germany,” said Naess, who thinks her and Ronningen’s results here in Gdynia are showing the true impact of their extensive winter training program. 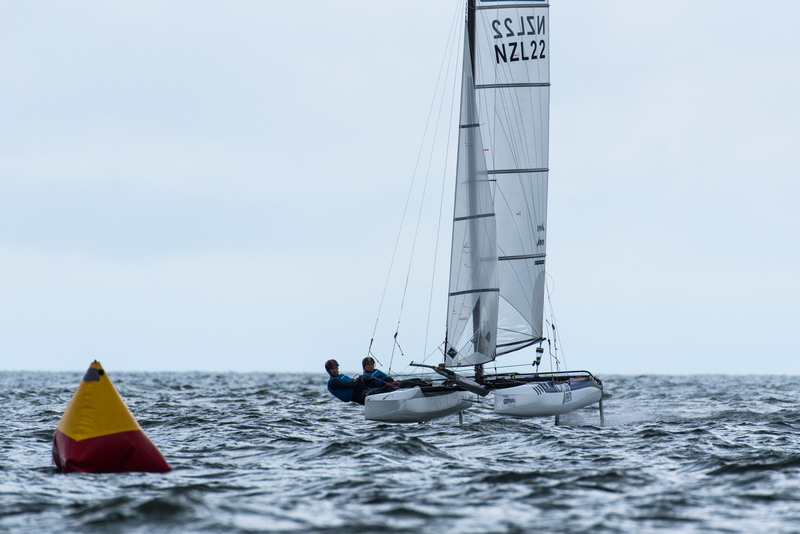 “We had the fortune to head down to Auckland, NZ for 7 weeks of training this winter, and we really put in the hours in on the water and in the gym to prepare us for a great 2018.” She added. 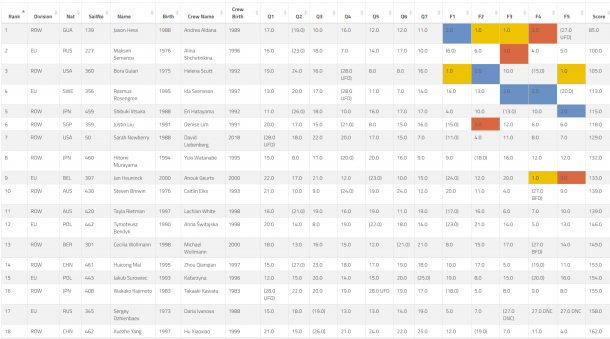 Clearly, it’s working. 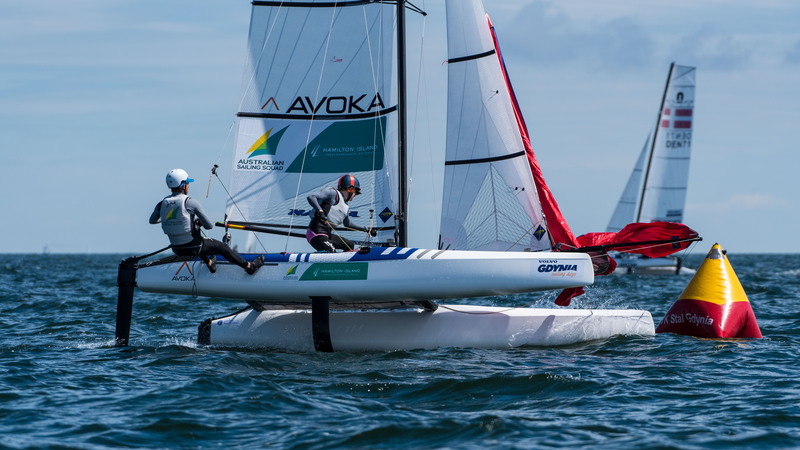 Overnight leaders Sophie Weguelin and Sophie Ainsworth dropped off the podium today after picking up an 11 in the first race of the day, while class fans may have been surprised to see the 18 and 20 year old Munté sisters holding tight to 2nd position after 7 qualifying races. 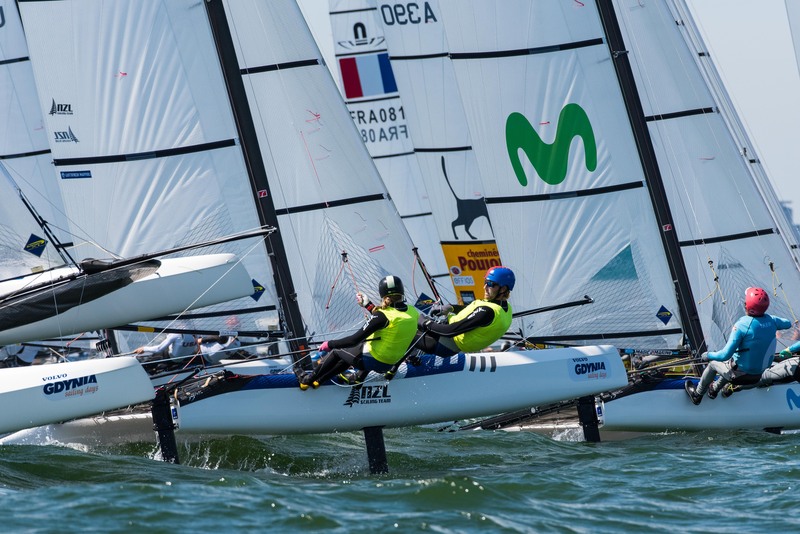 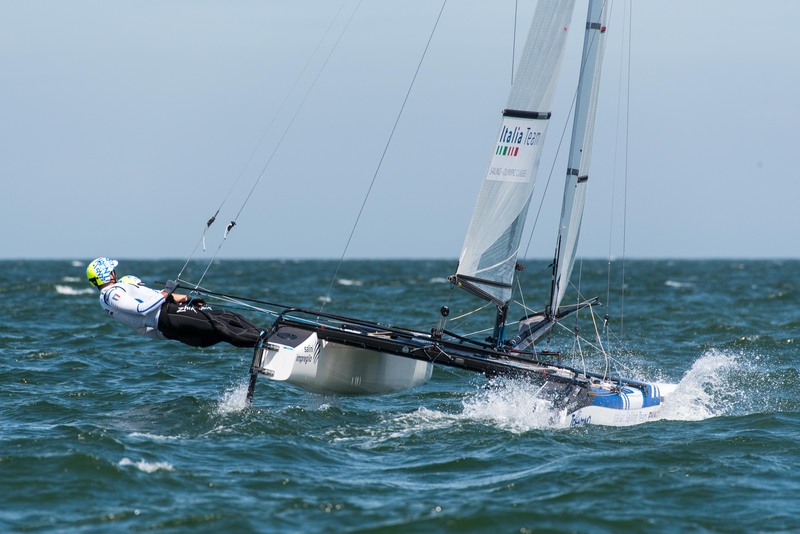 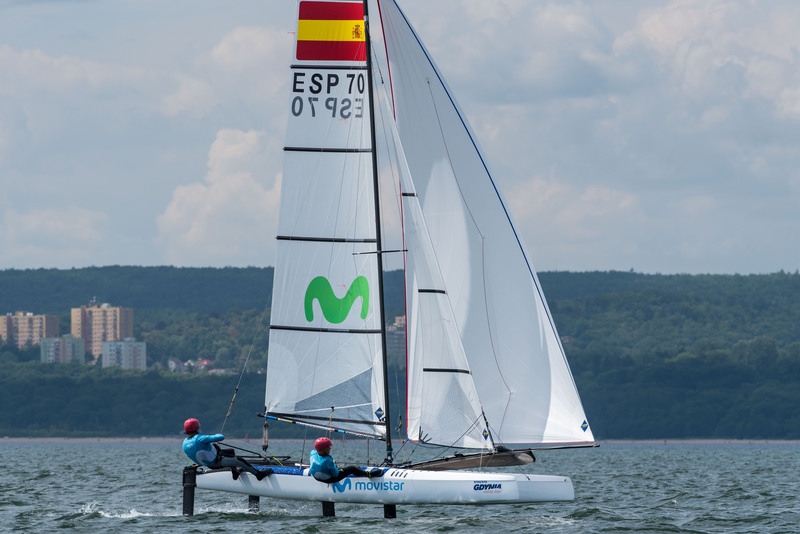 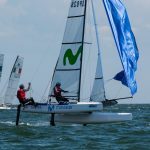 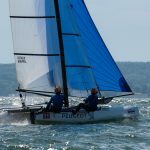 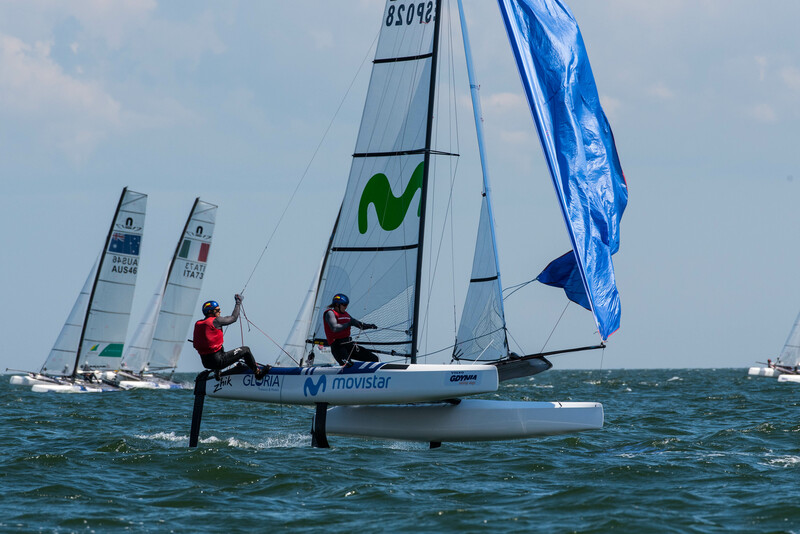 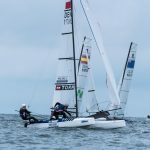 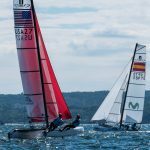 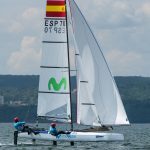 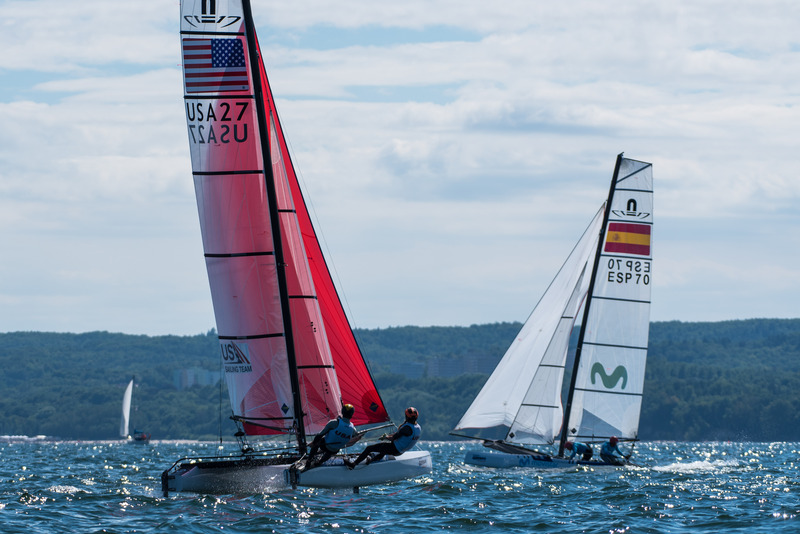 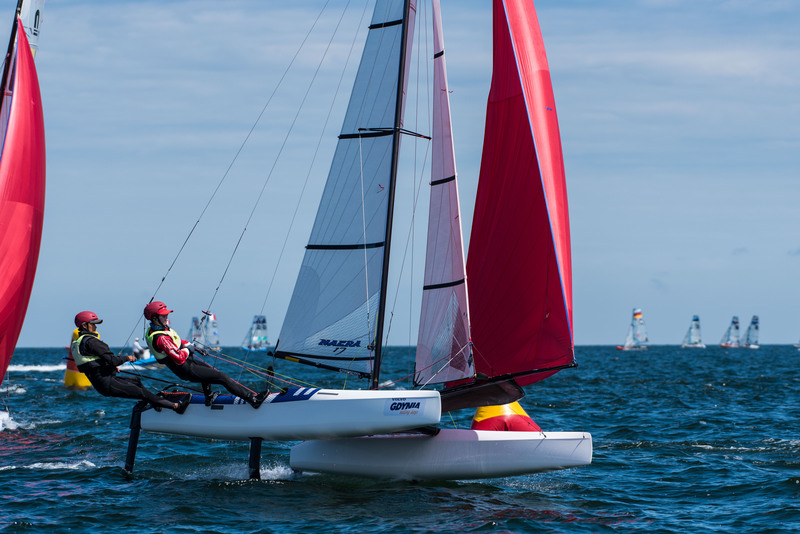 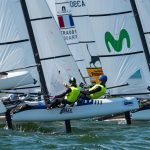 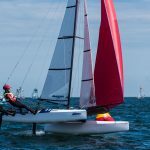 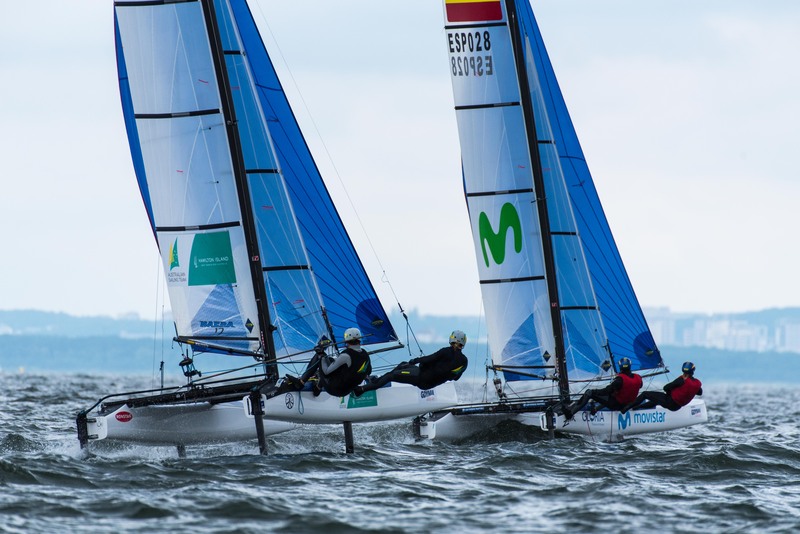 Anyone who’s watched some of their light air performances in the 29er and FX won’t be, though: The young Spanish siblings show speed, smarts, and a great attitude in conditions under 10 knots while their light weight is a natural advantage in such conditions. 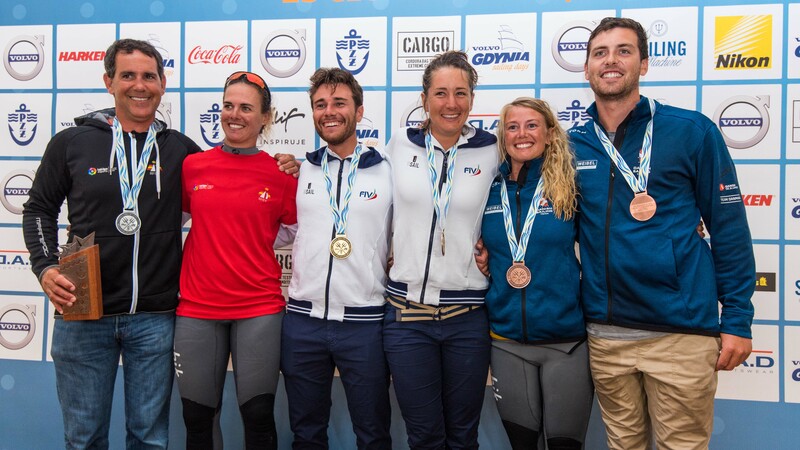 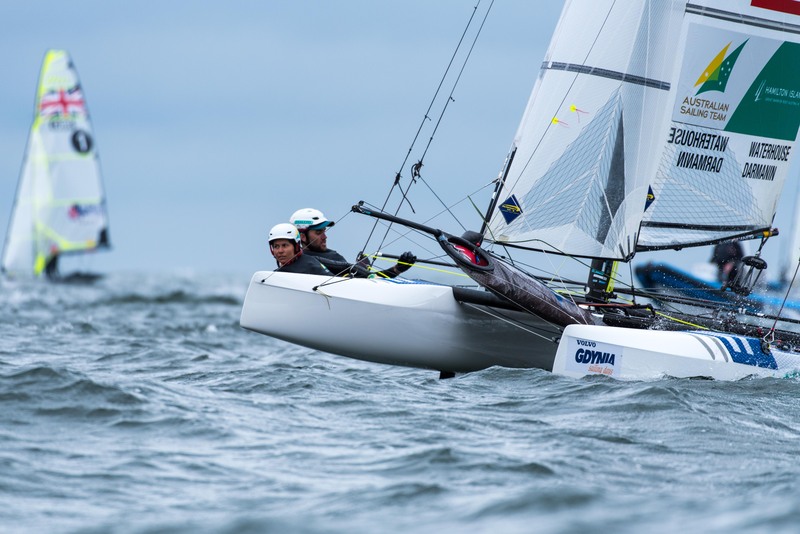 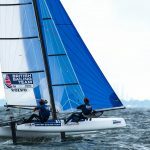 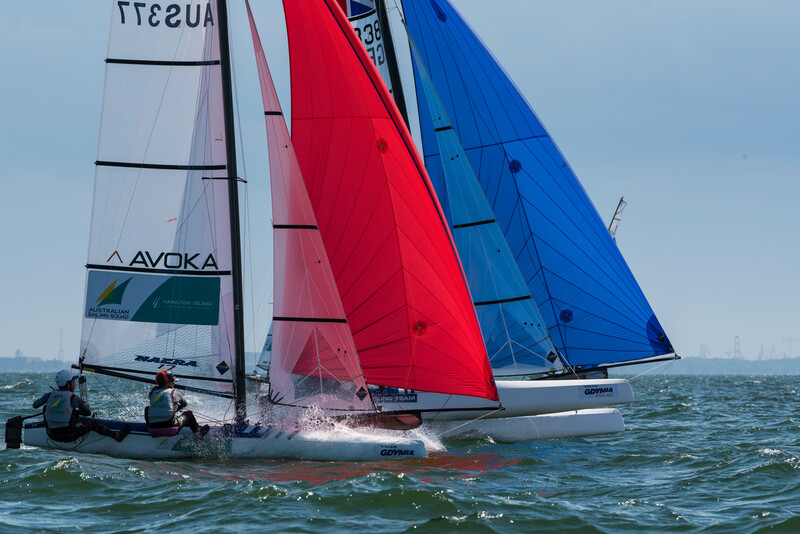 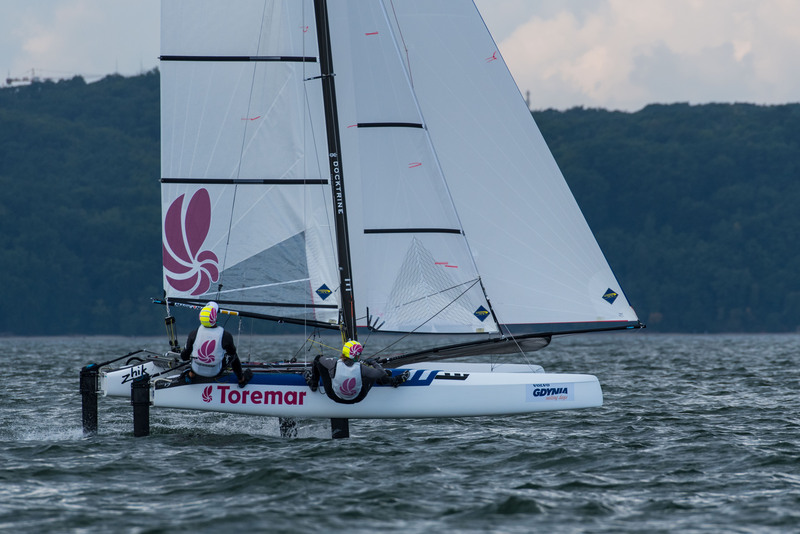 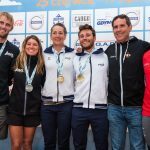 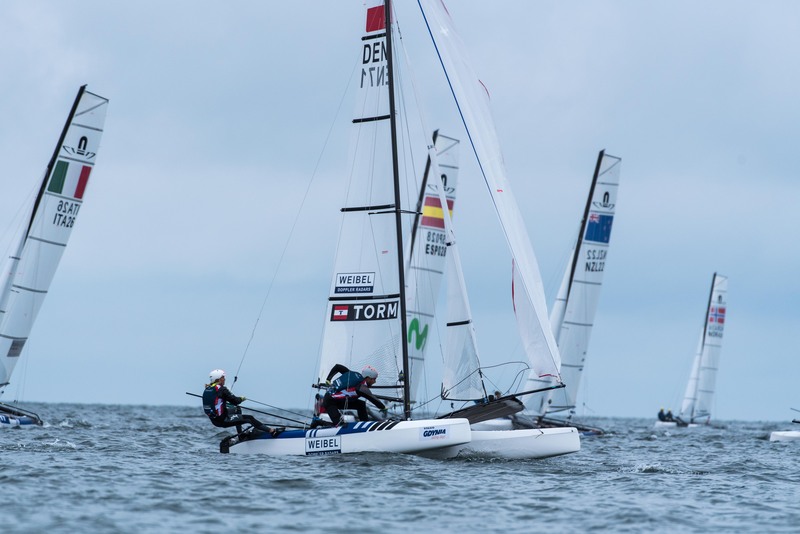 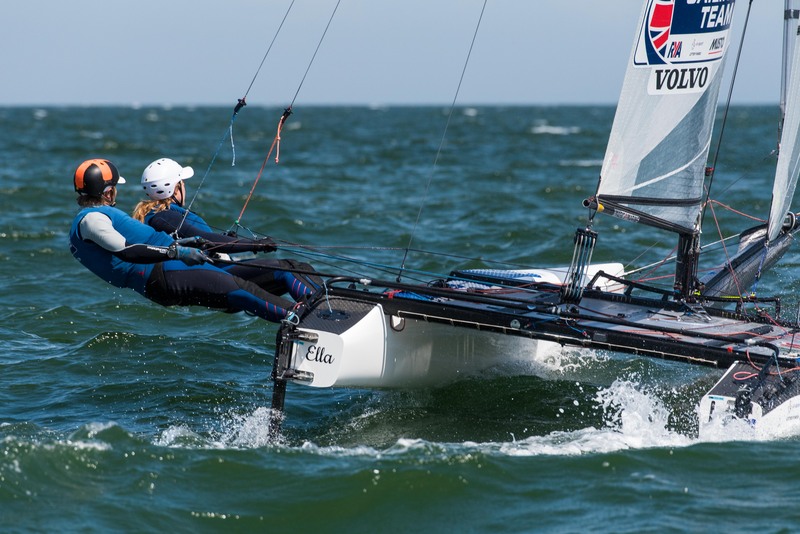 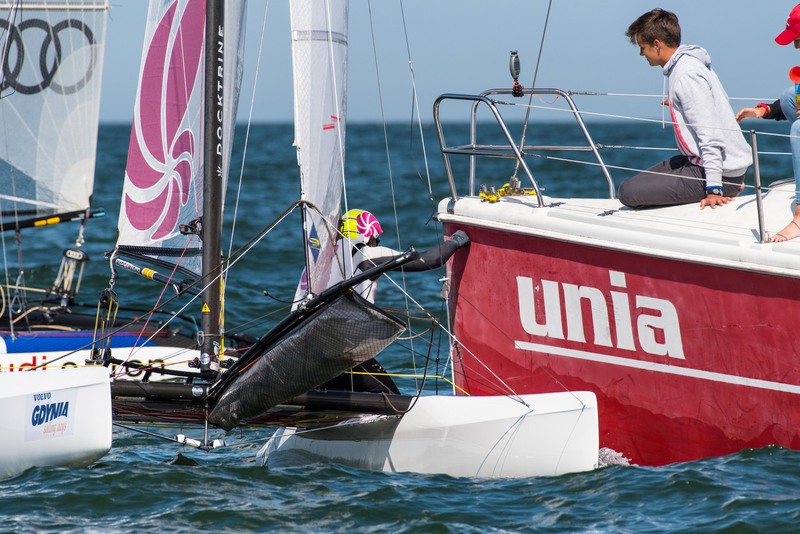 Roble said it’s far too early to worry about challengers for Tokyo berths coming from her own country, even though the USA’s last gold medalist in sailing – Anna (Tunnicliffe) Tobias (Beijing 2008, Radial) looks to be making a run at Japan. 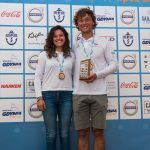 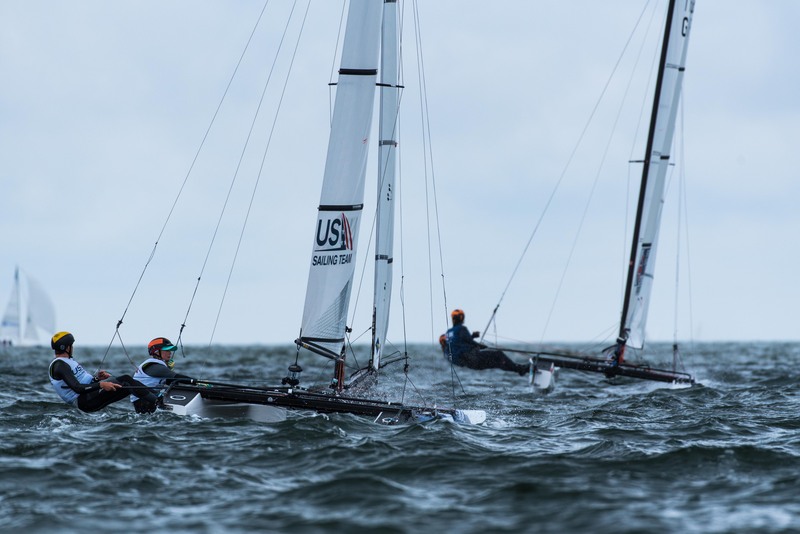 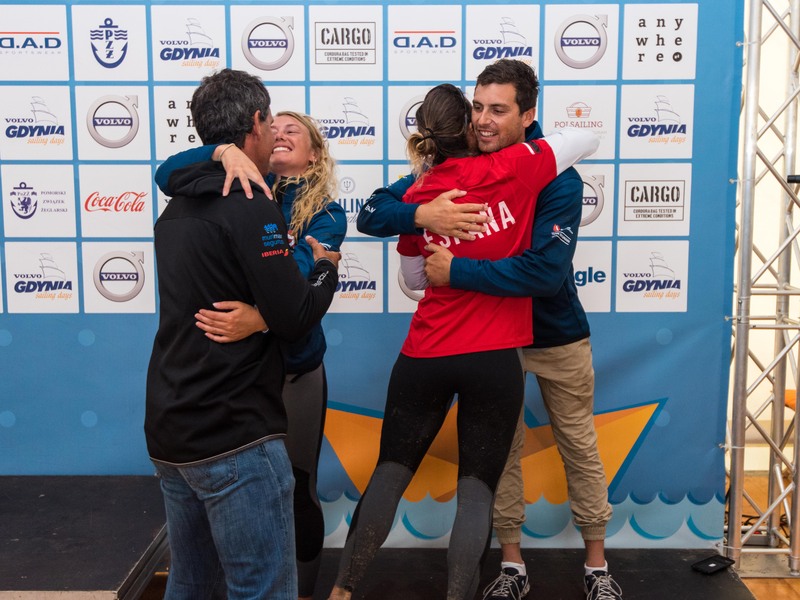 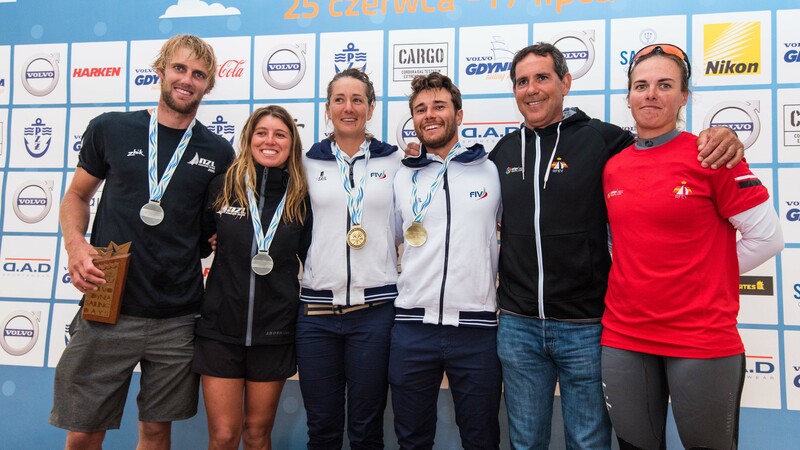 “We’re actually really stoked to see Anna and Paris (Hencken) sailing here in Poland – we believe that having strong training partners is the key to winning, and if the US is going to move forward in Olympic Sailing, we have to keep pushing hard to bring medals home! 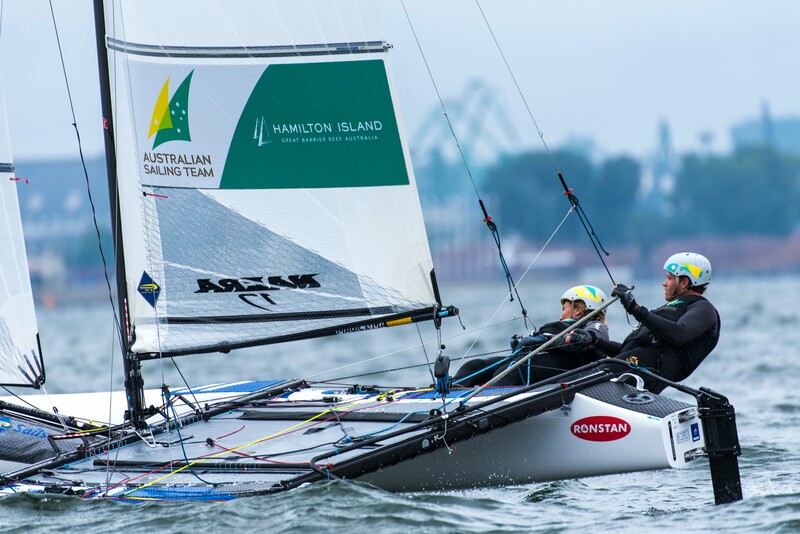 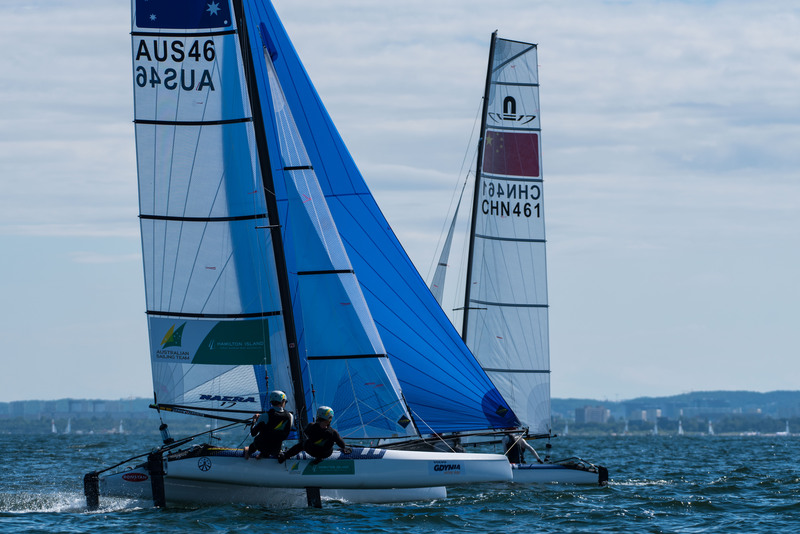 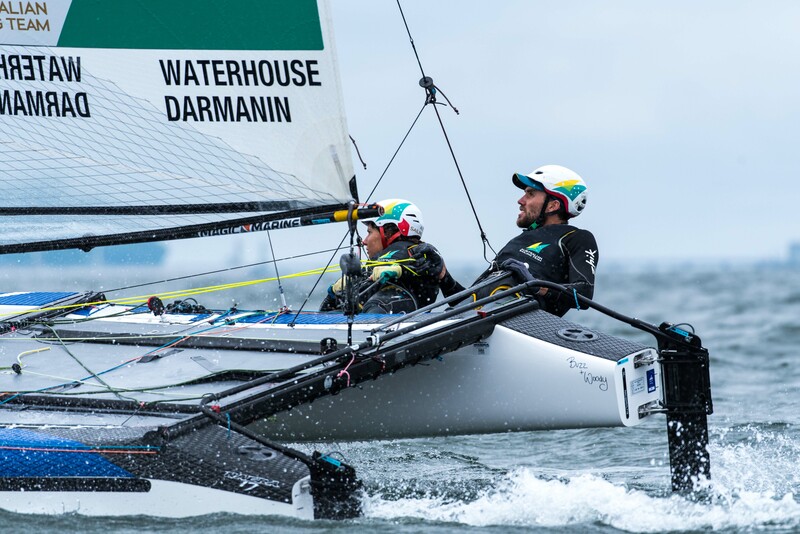 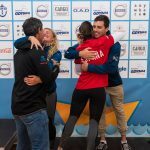 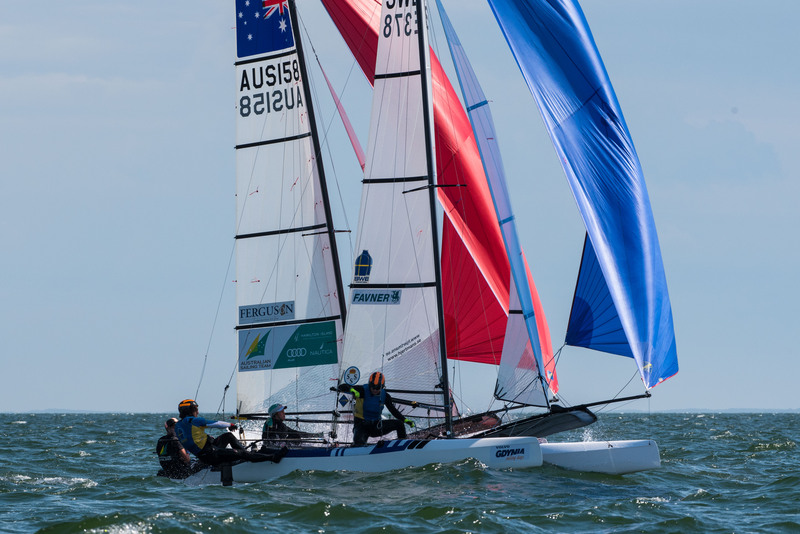 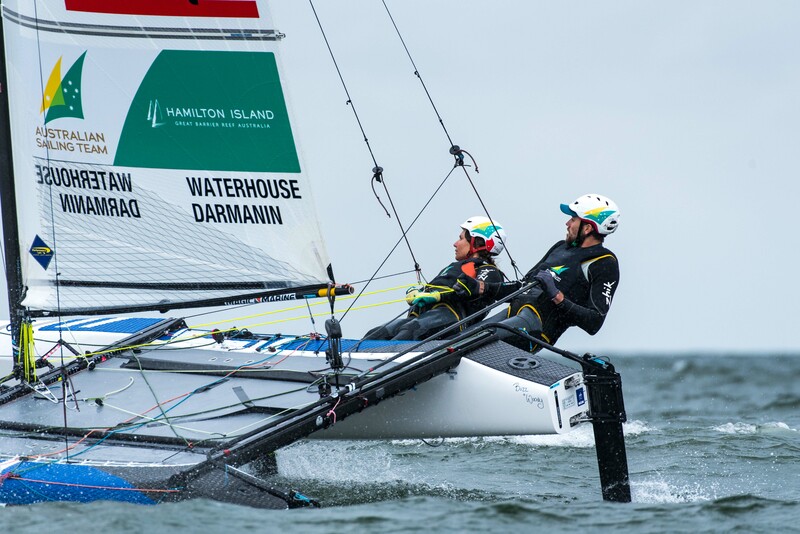 Nathan and Haylee Outteridge (AUS) remain in contention with their new brother-sister team, the pair sitting 8th after 7 races despite a big scare today in the final race. 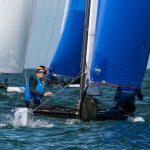 Haylee fell into the water while setting up for a gybe and was struck on the back of her leg by a rudder. 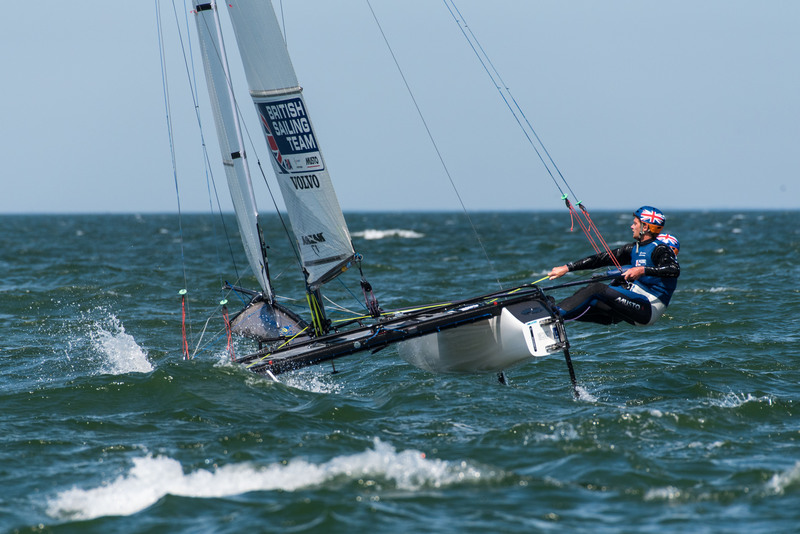 The wetsuit wasn’t torn, but there remains a definitive mark on the backside of her knee where the blade made its mark. 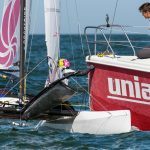 “I wish we could find some sailing gear with padding back there,” she said. 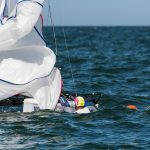 “That’s where most of the cuts seem to happen when you lose your footing.” Half-joking with skipper/brother Nathan, she said her real fear is being dragged under the water and pinned by her racing harness. 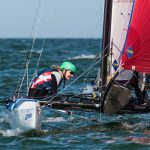 She said Nath is allowed to keep racing as long as most of her body is above water. 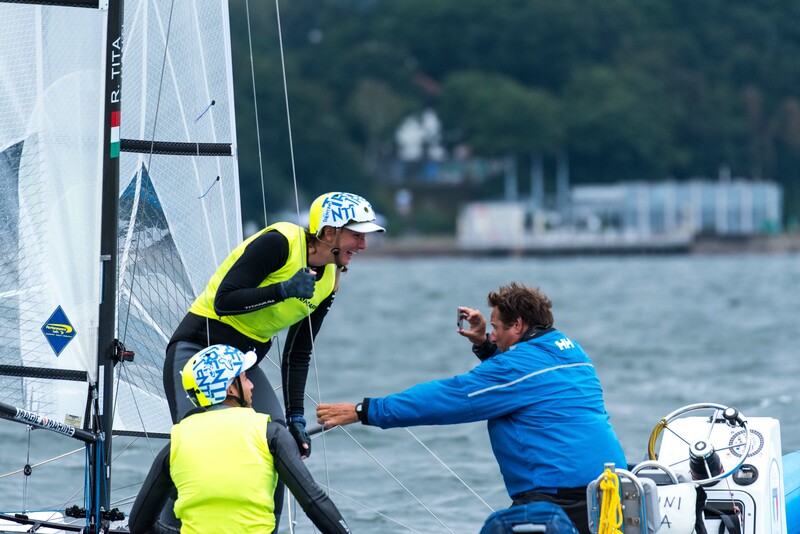 “When he can’t see most of me, he has to stop!,” she laughed. 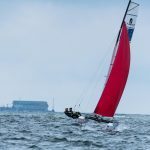 The 3 men’s 49er qualifying fleets saw an entirely different seascape to the morning racers when they arrived on course this afternoon: Instead of sun and mellow conditions, dark clouds, spitting rain, and lumpy, choppy seas greeted the racers – along with an entirely new wind of 18 knots from the opposite direction. 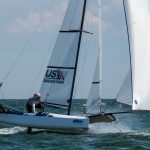 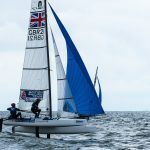 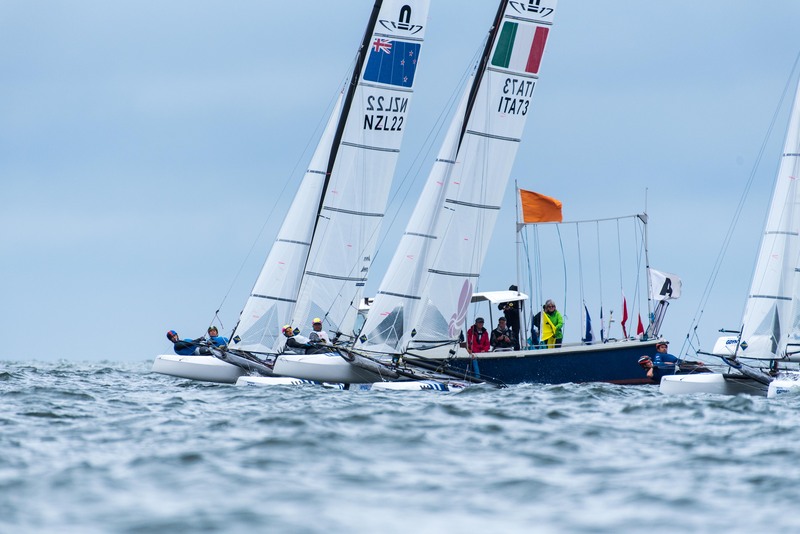 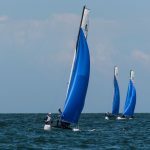 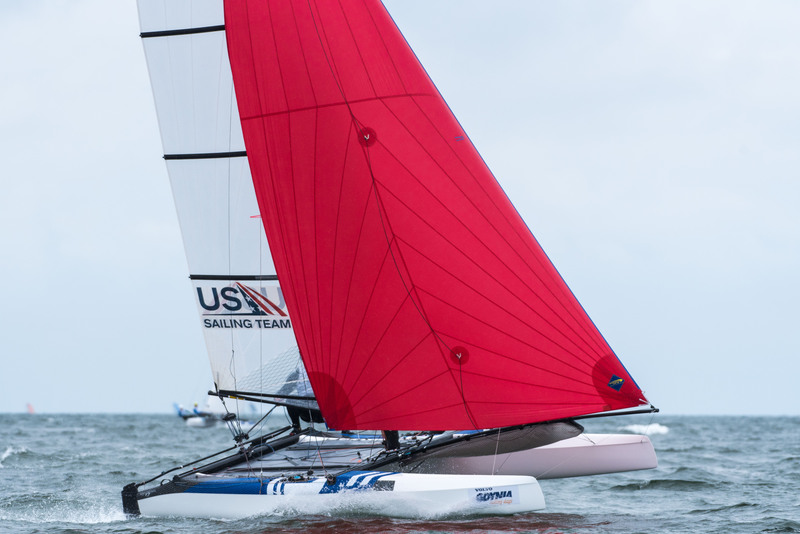 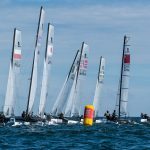 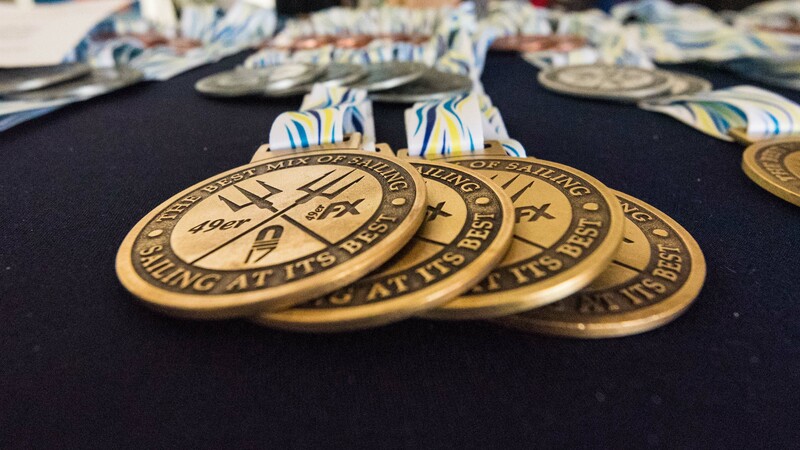 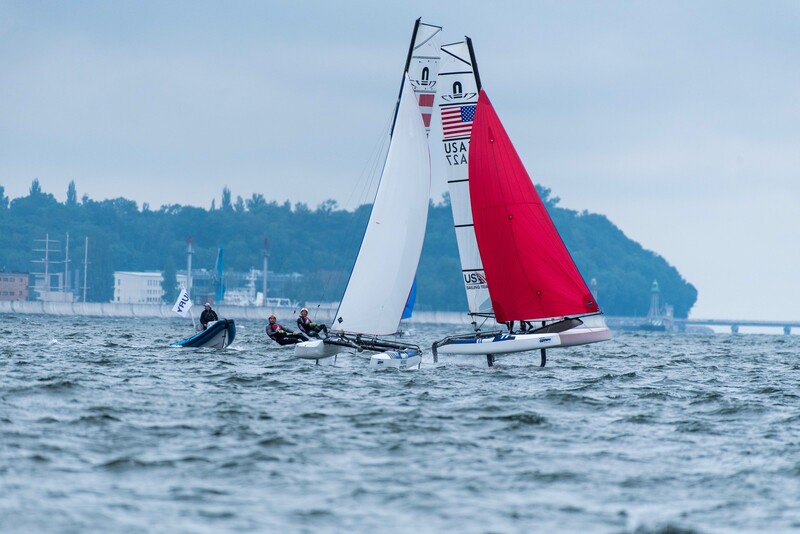 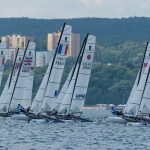 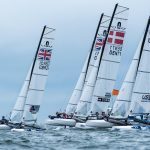 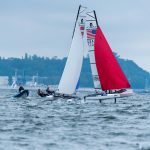 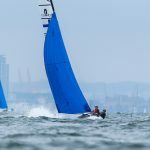 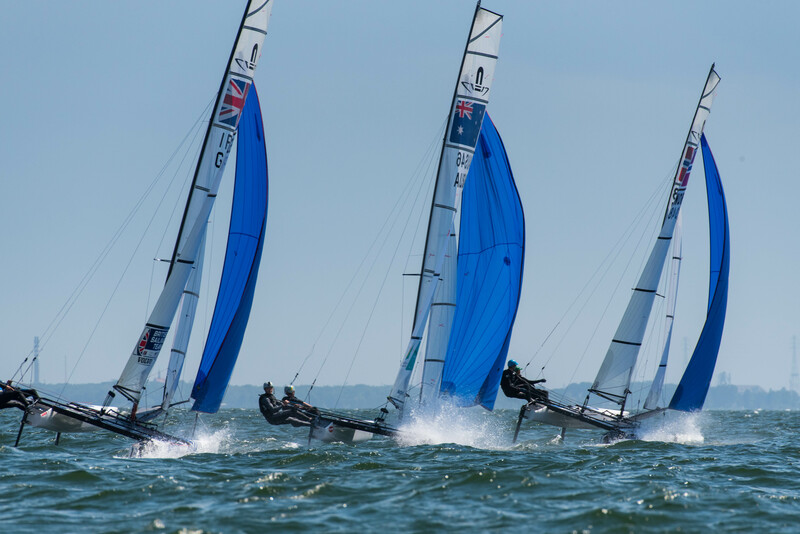 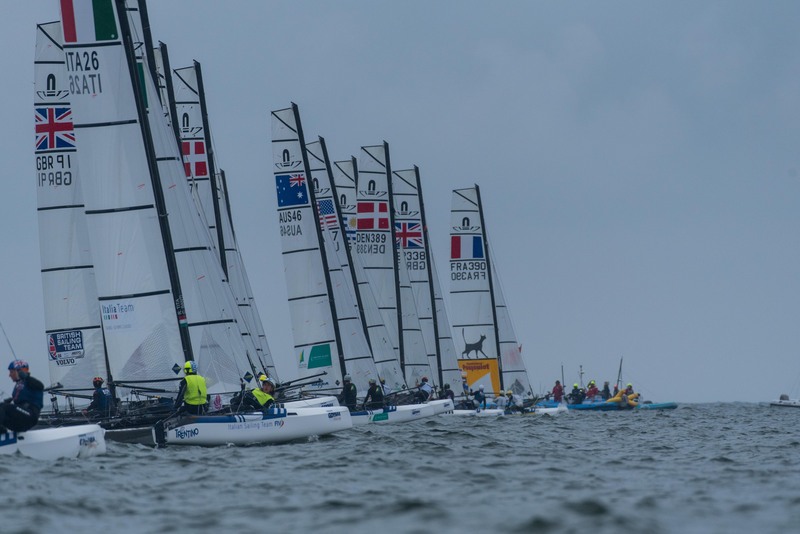 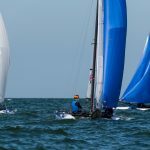 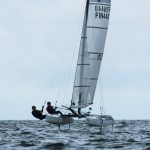 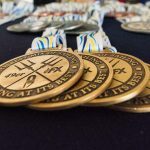 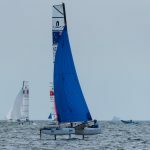 The wind would ease off slightly through the course of four qualifying races, allowing some of the heavier teams and those with more boathandling practice to power through and pick up positions. 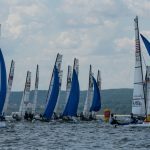 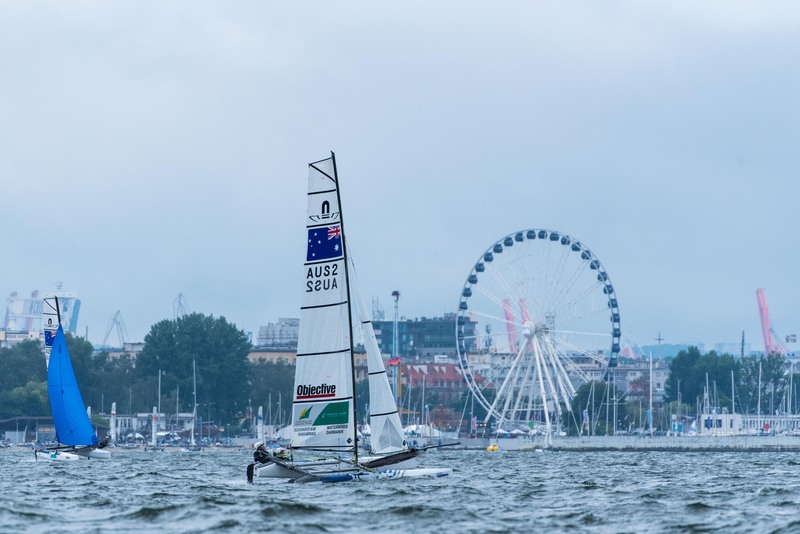 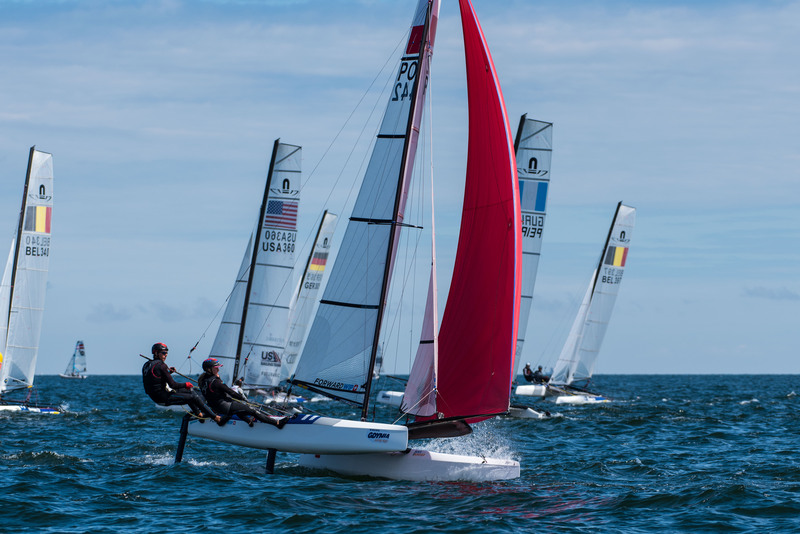 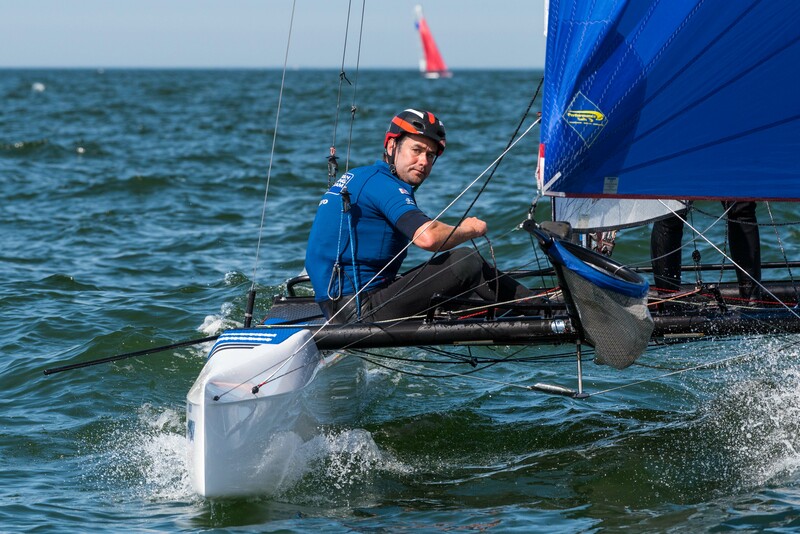 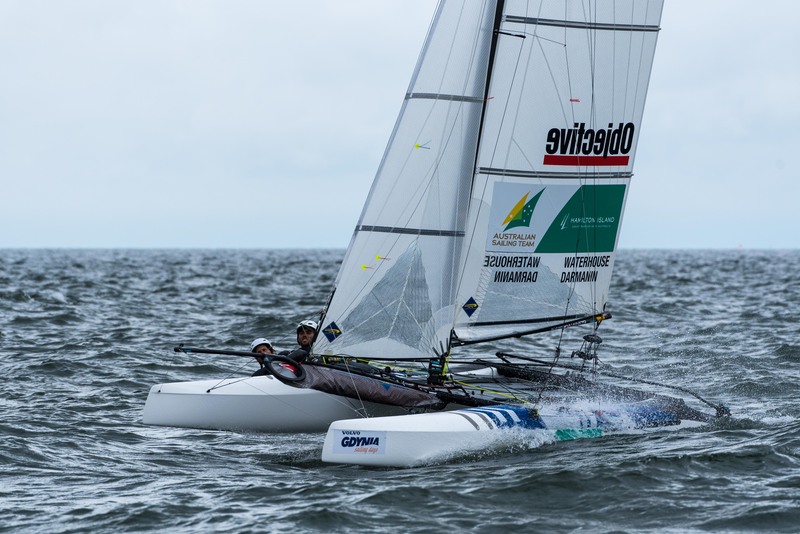 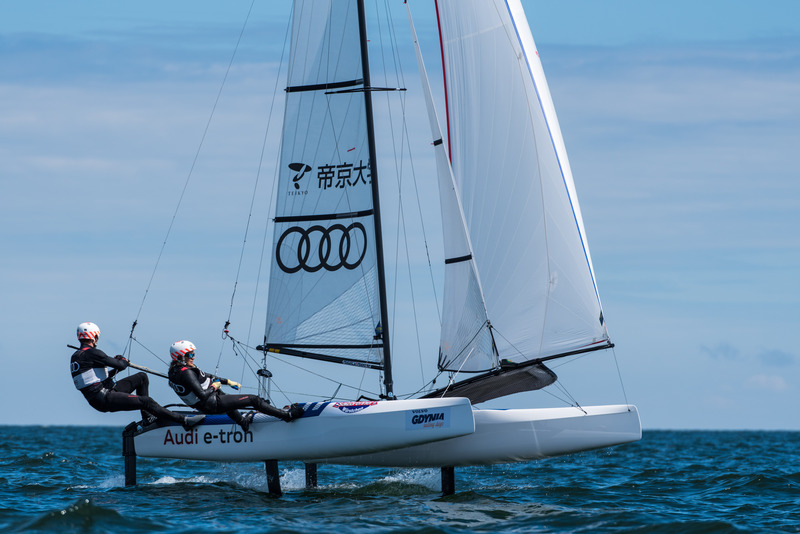 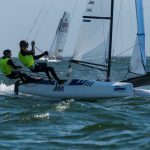 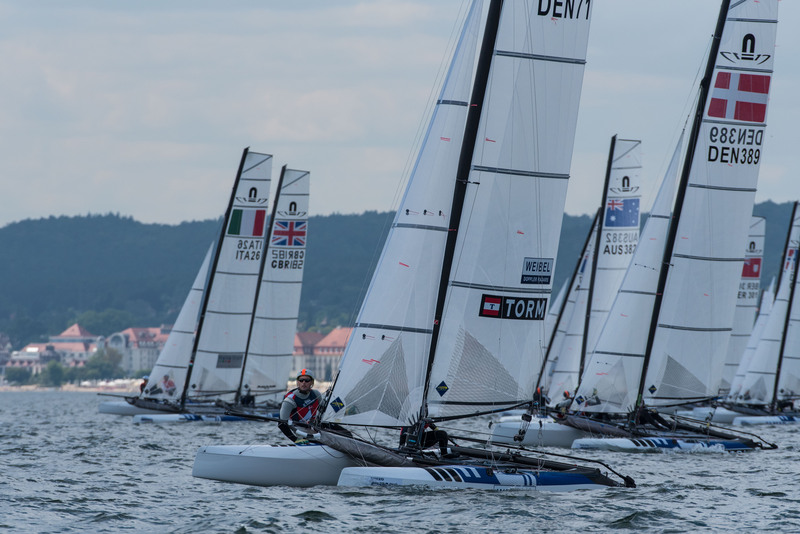 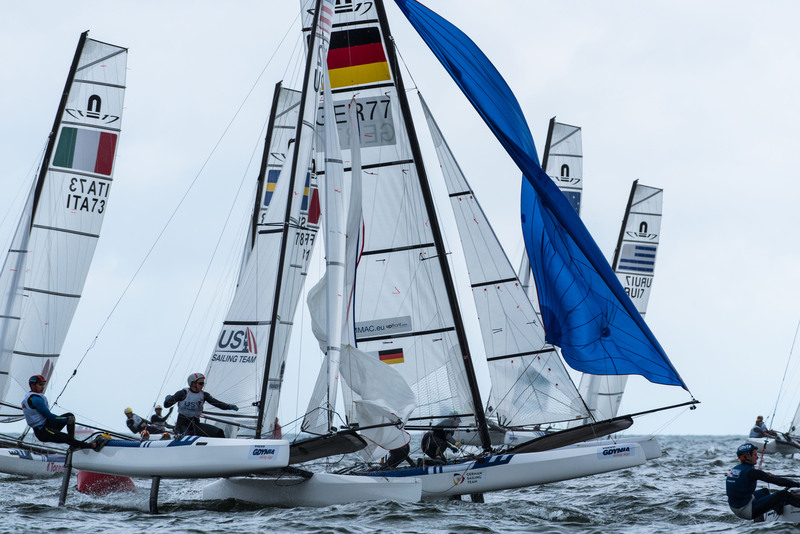 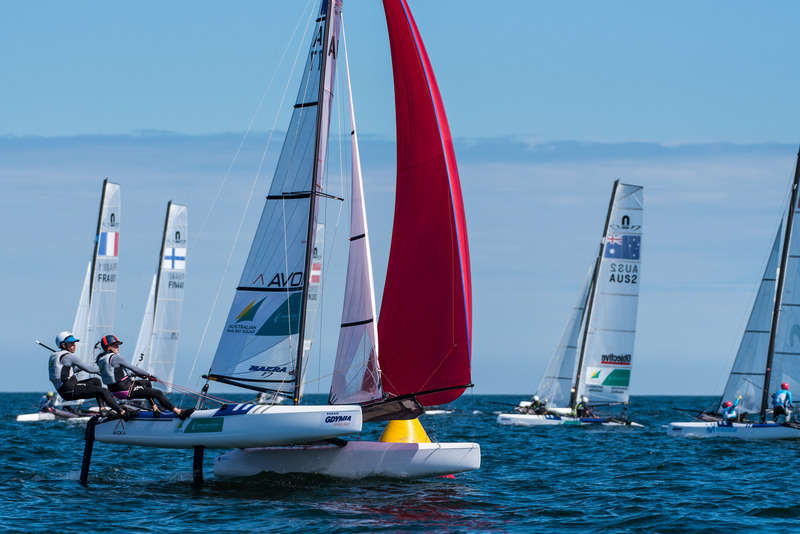 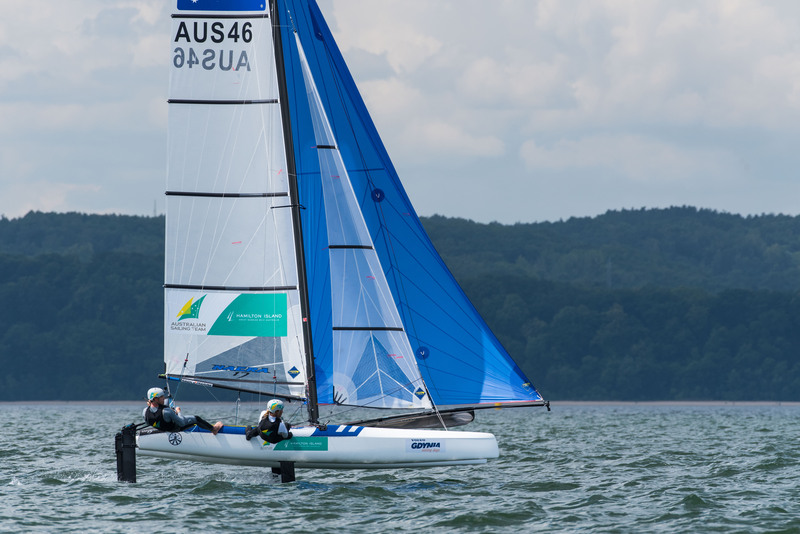 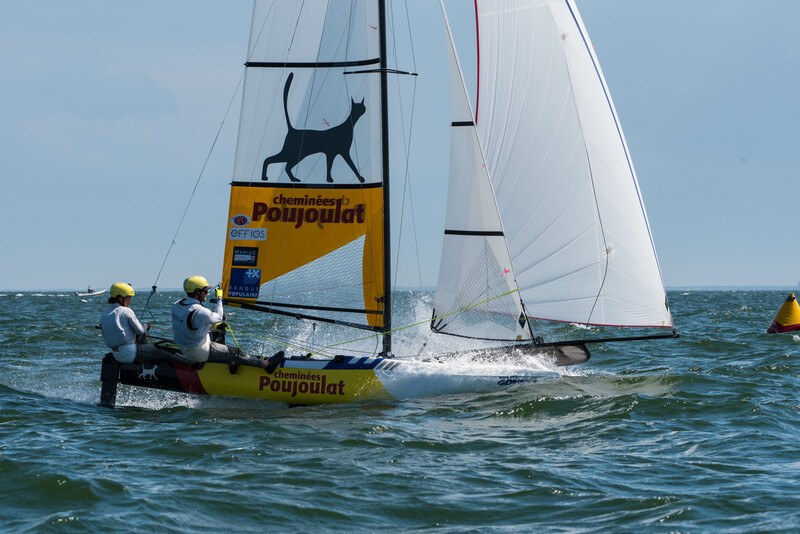 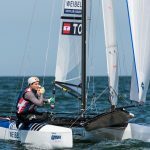 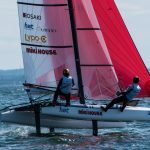 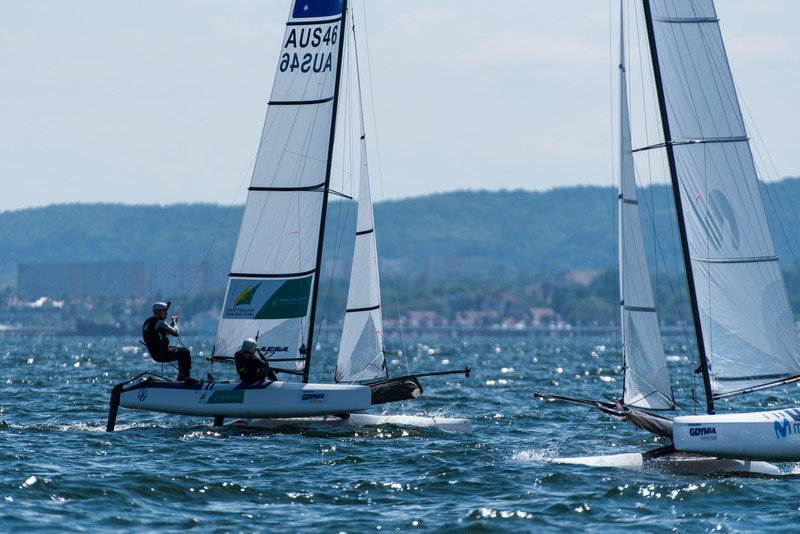 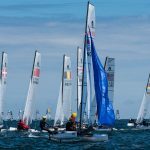 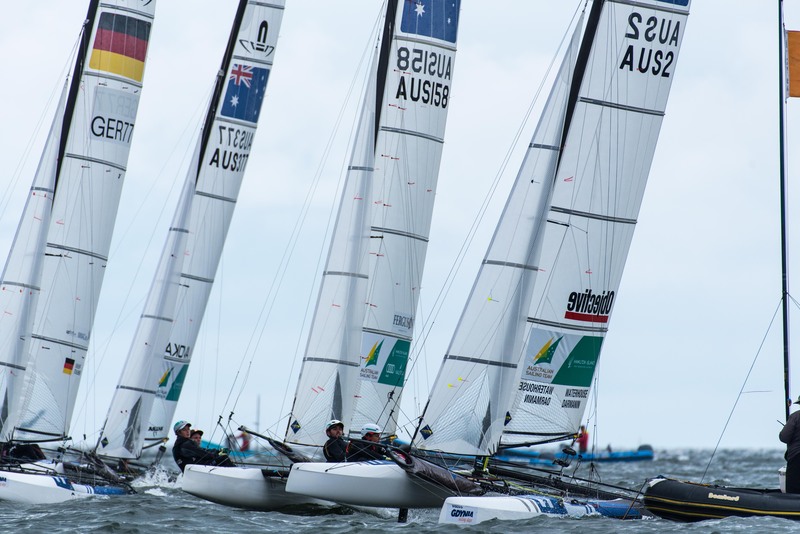 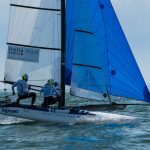 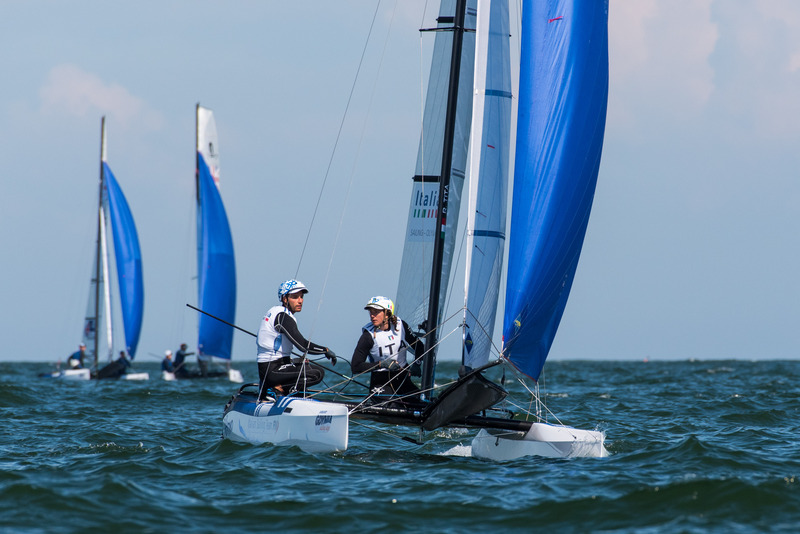 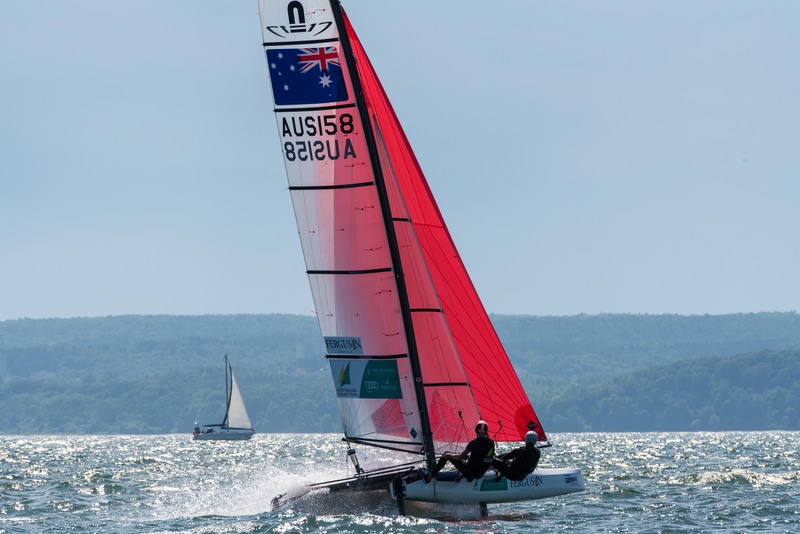 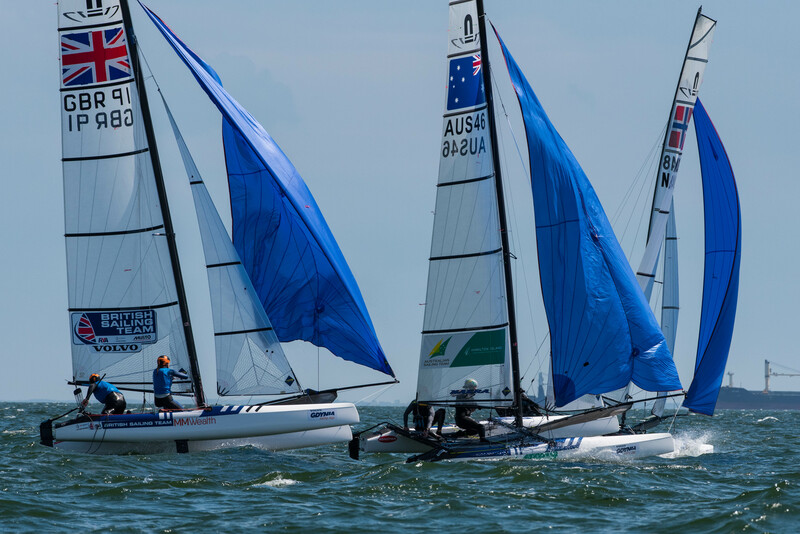 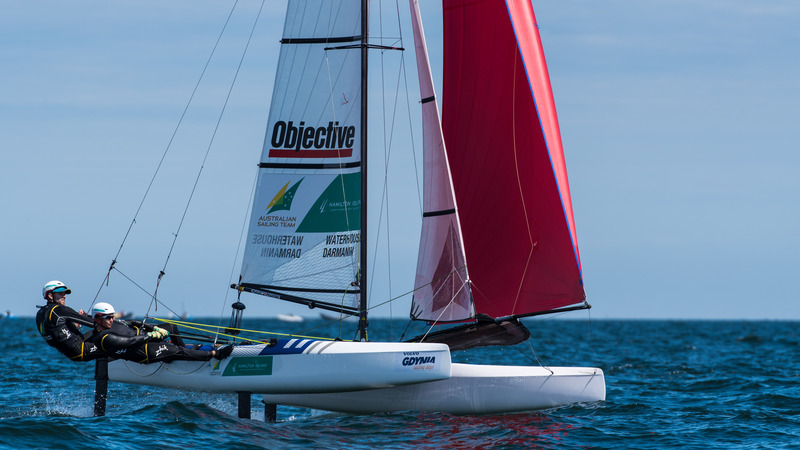 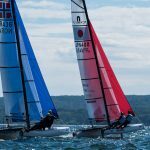 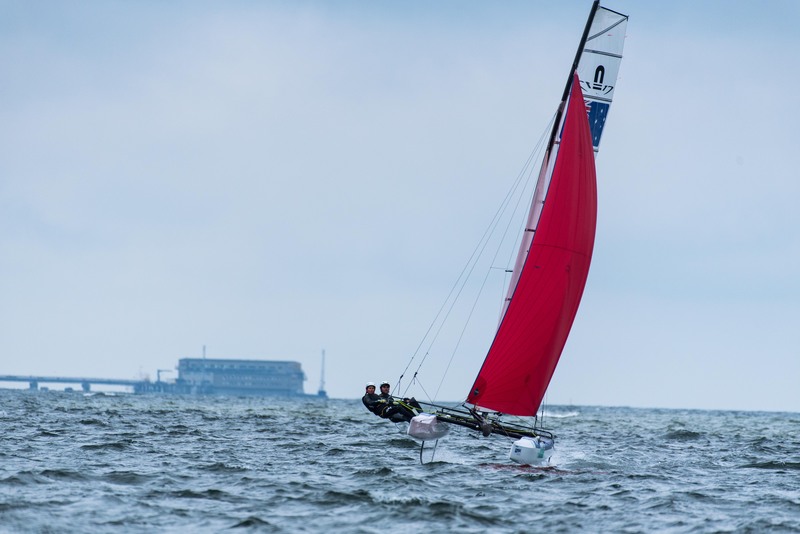 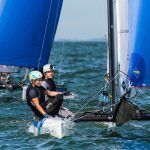 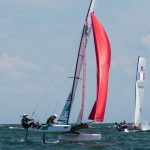 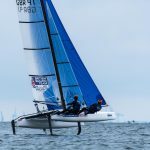 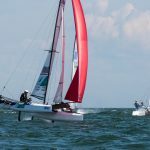 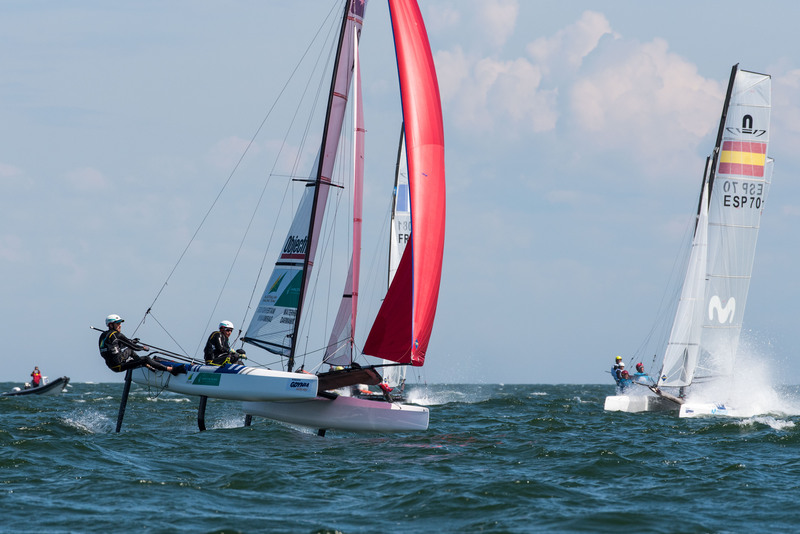 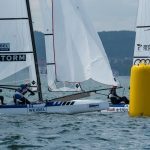 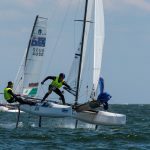 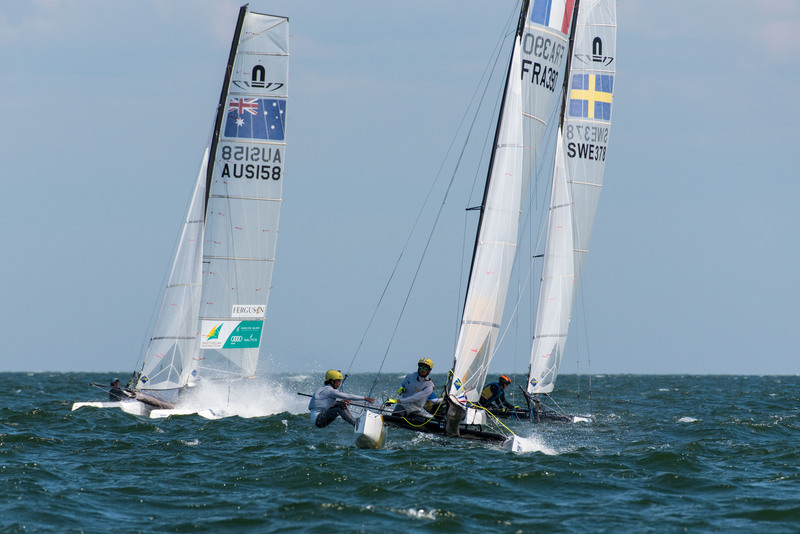 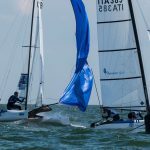 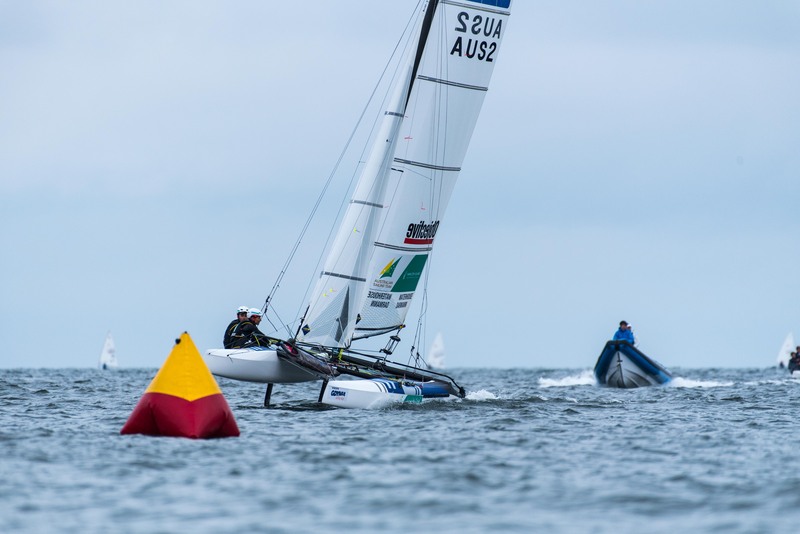 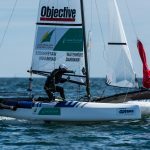 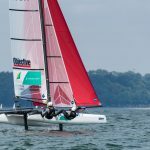 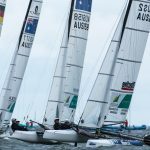 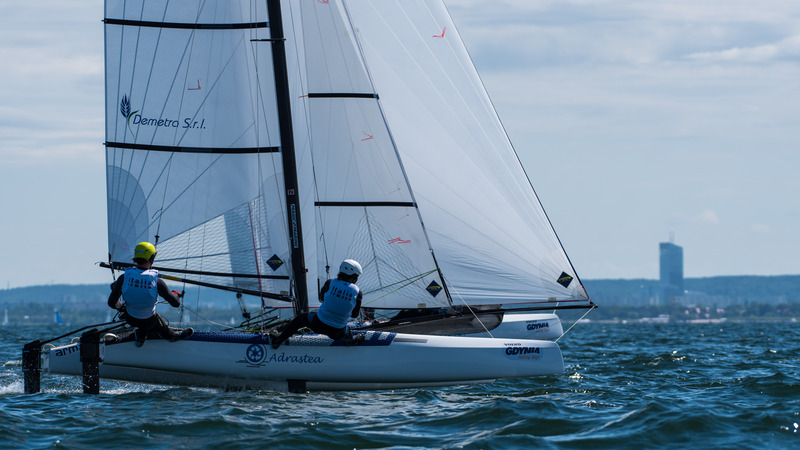 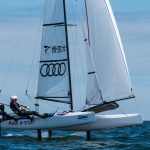 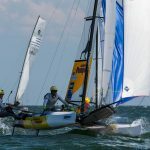 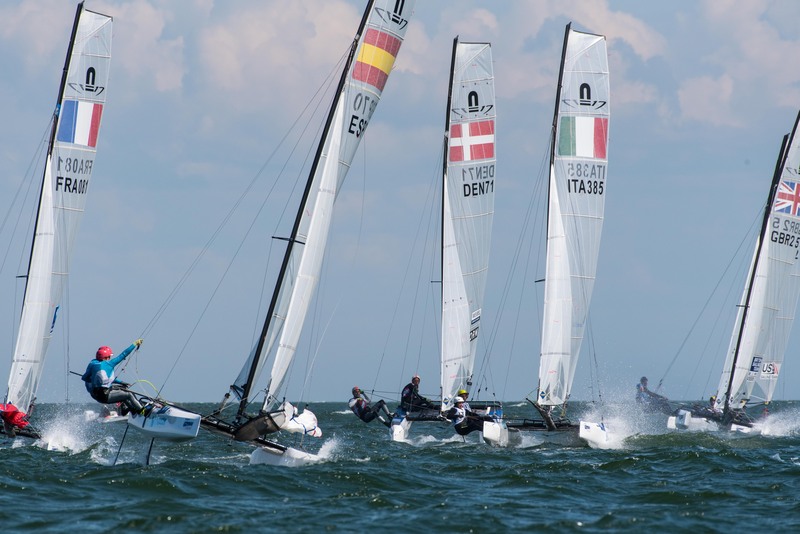 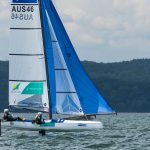 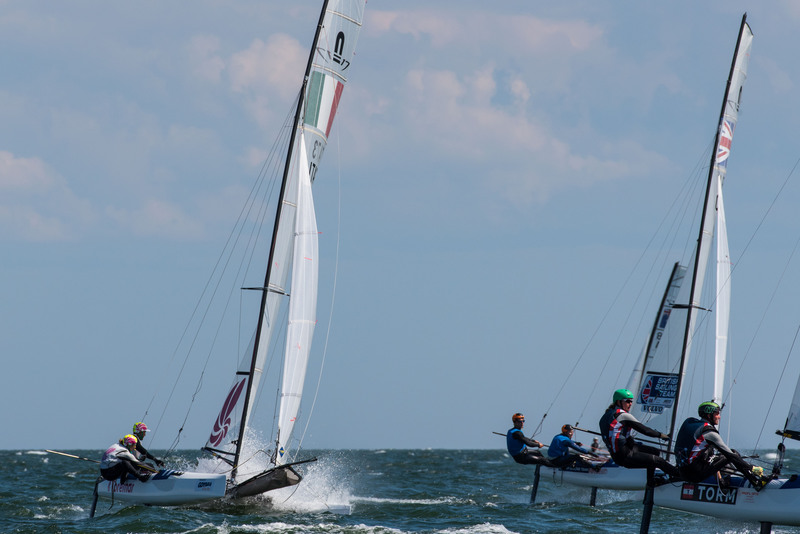 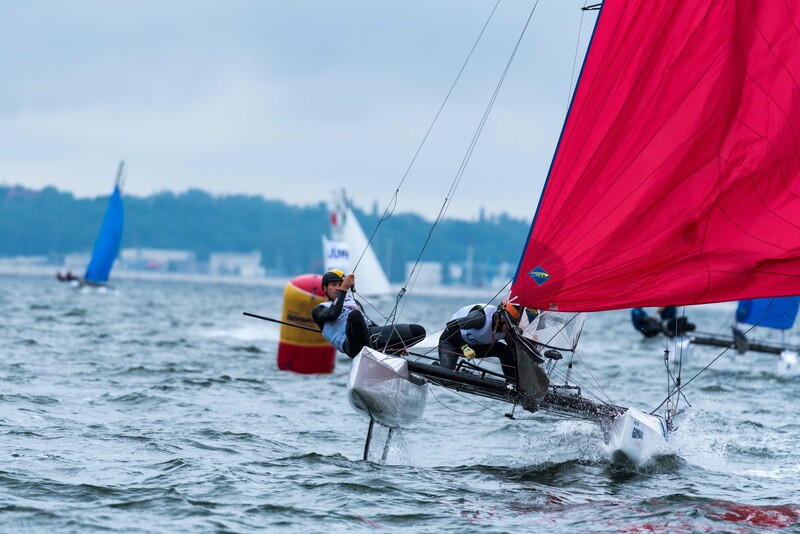 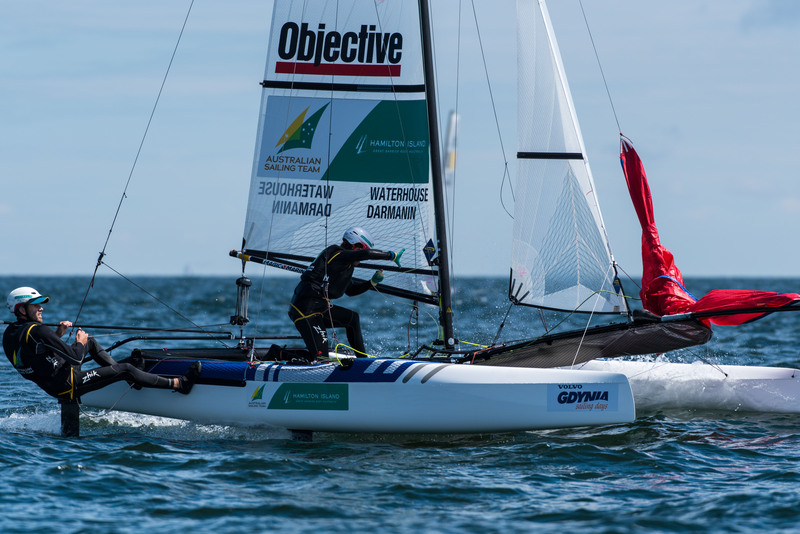 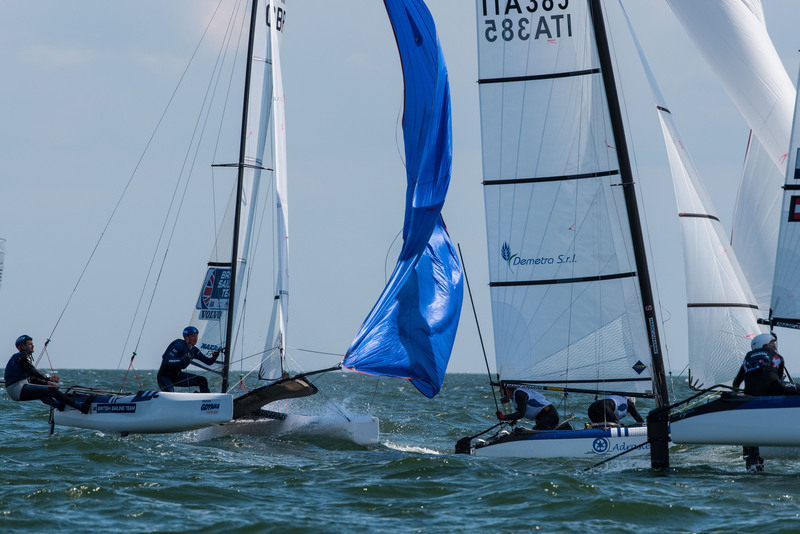 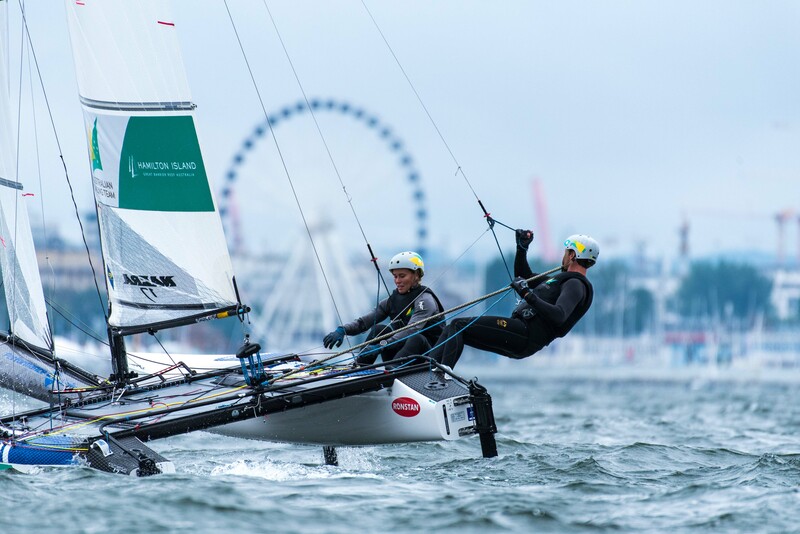 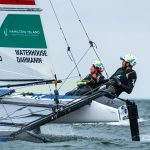 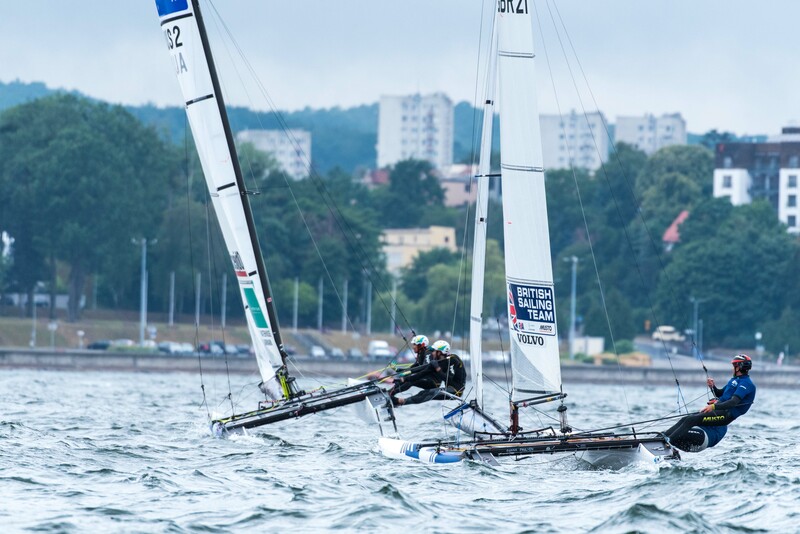 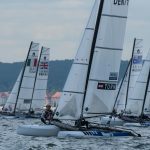 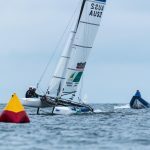 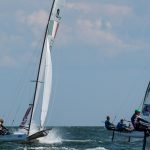 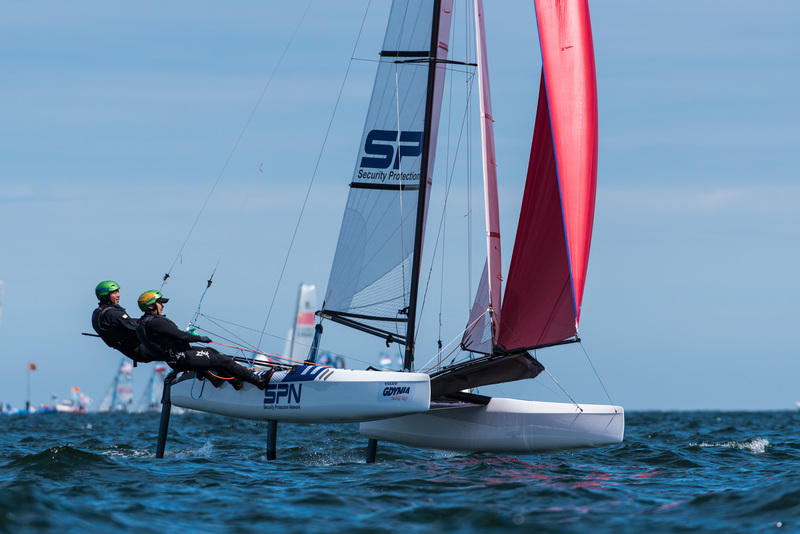 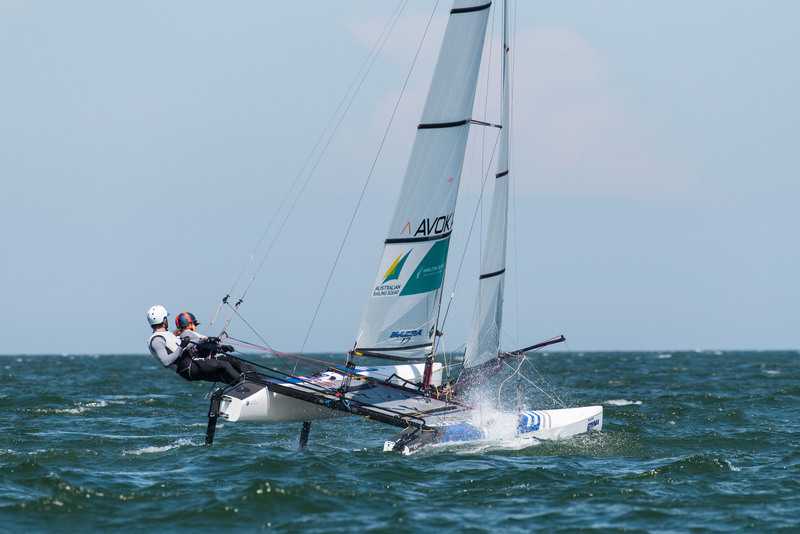 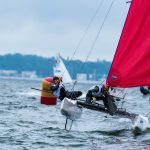 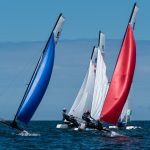 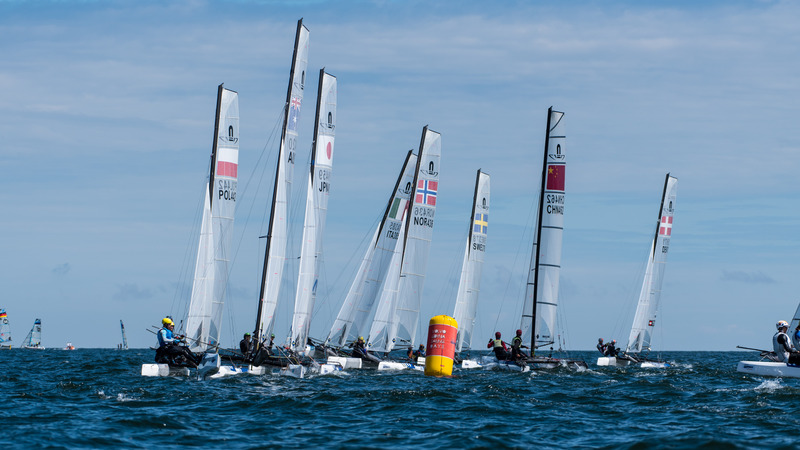 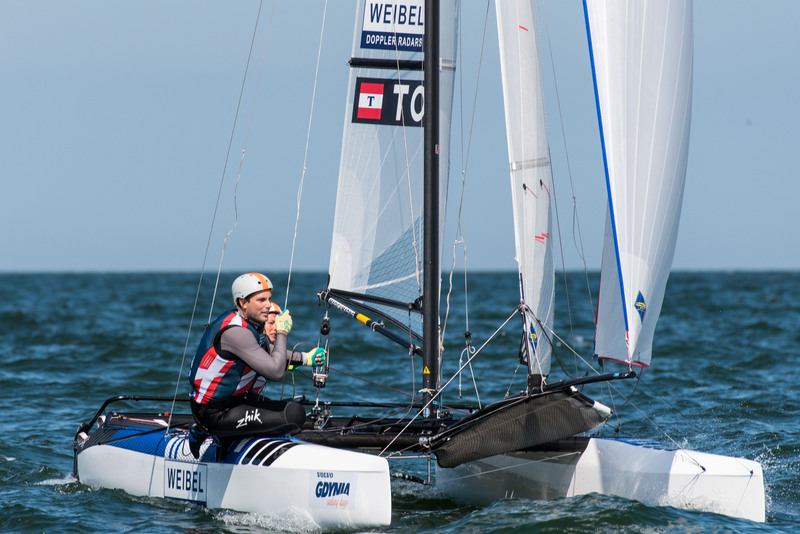 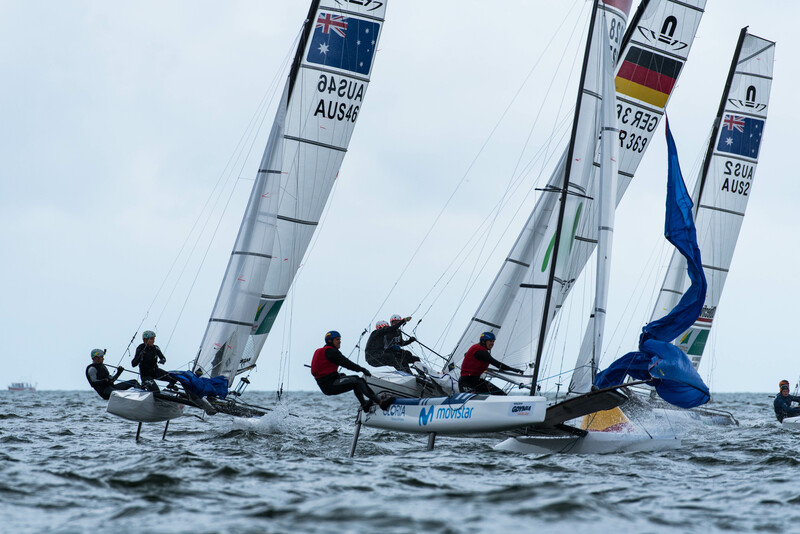 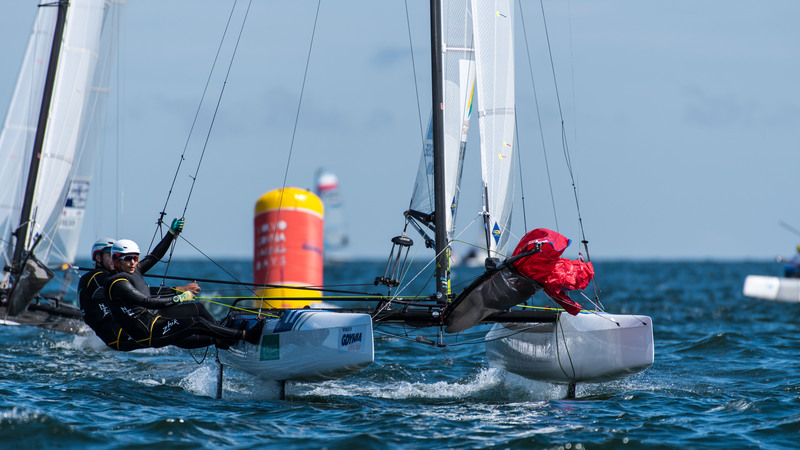 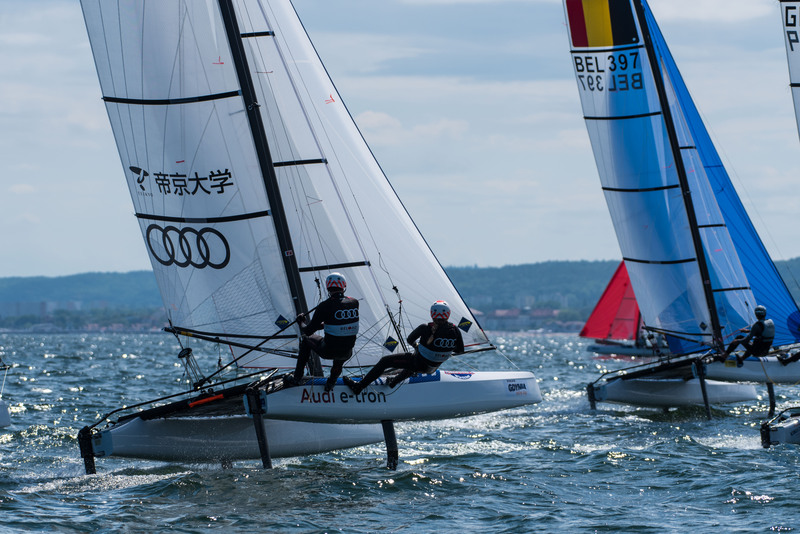 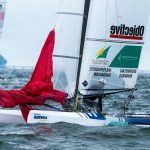 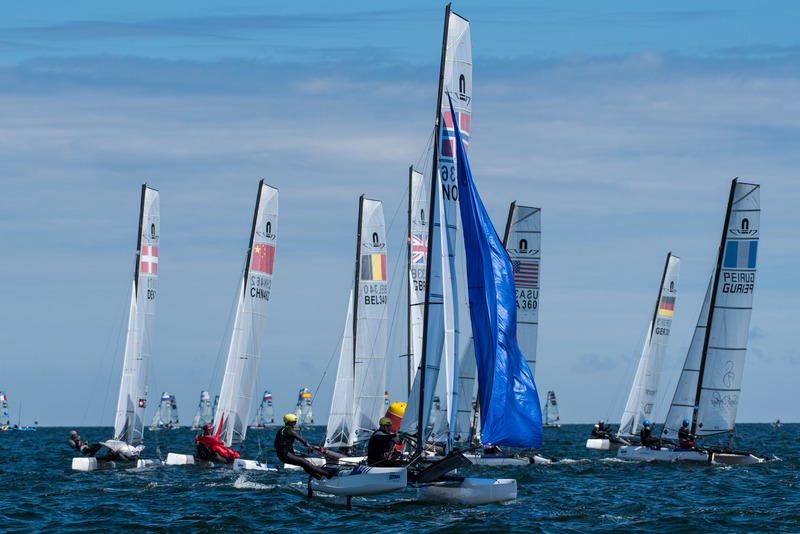 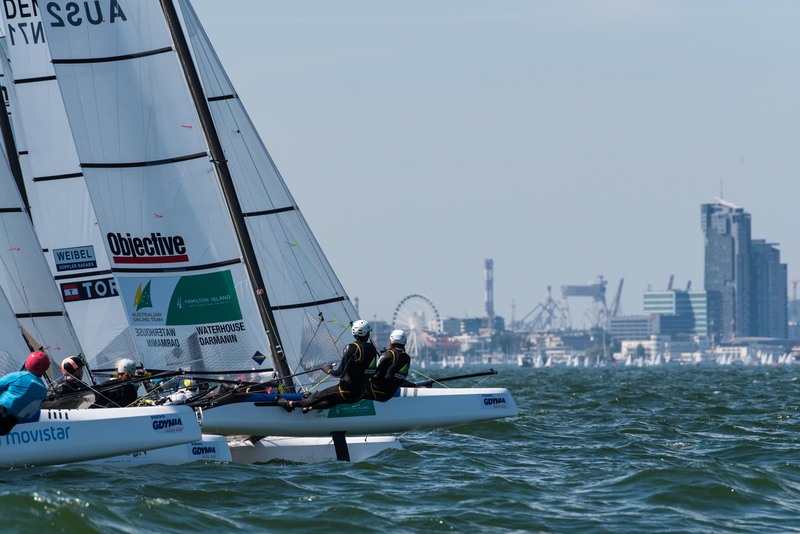 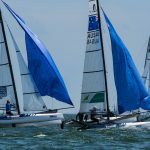 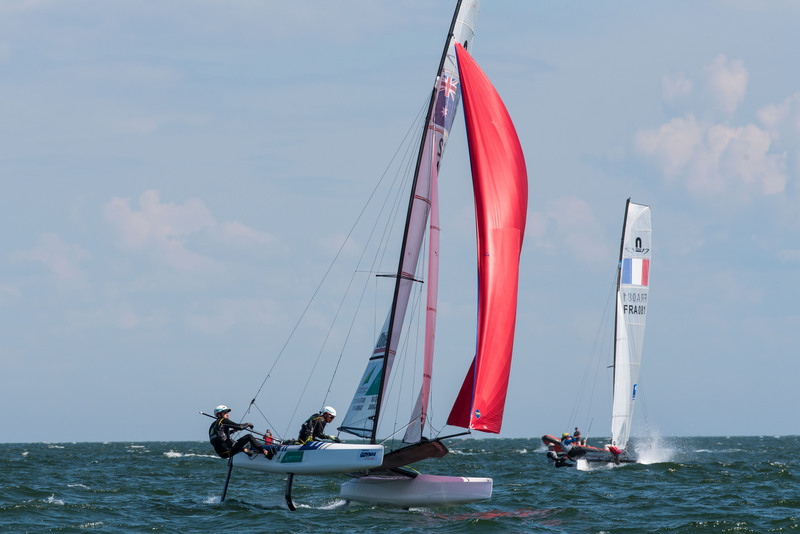 At just 26 years old, Austria’s Benjamin Bildstein and David Hussl sailed another stellar day, and if not for a port-starboard disqualification on Monday, the young duo would likely be crushing the fleet instead of sitting in 7th place, but they’re still just 7 points from the leaders. 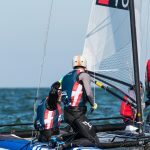 “It was disappointing to be disqualified when we are confident we didn’t commit a foul, but it’s in the past now, and we hopefully will learn a lesson from the situation. 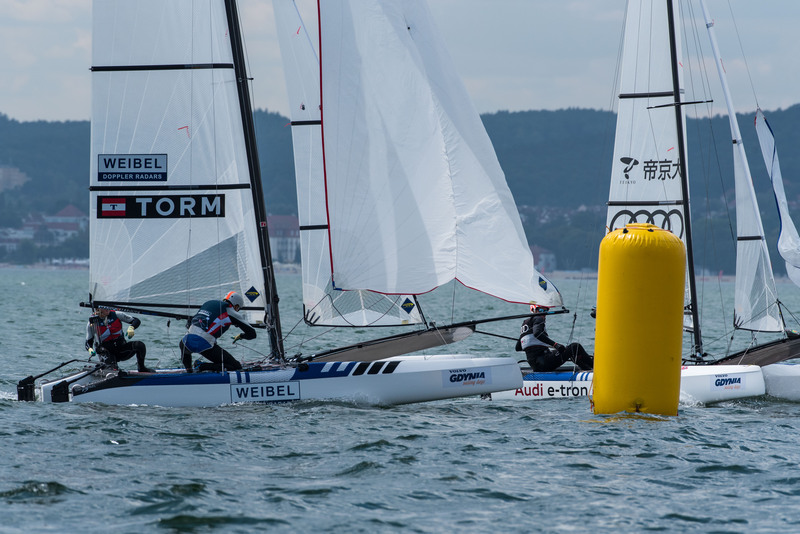 Hussl thinks his Austrian team is well-positioned for a Rio run. 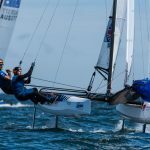 “I think we are now one of the experienced teams already, and it’s for sure playing in our favour,” he said. 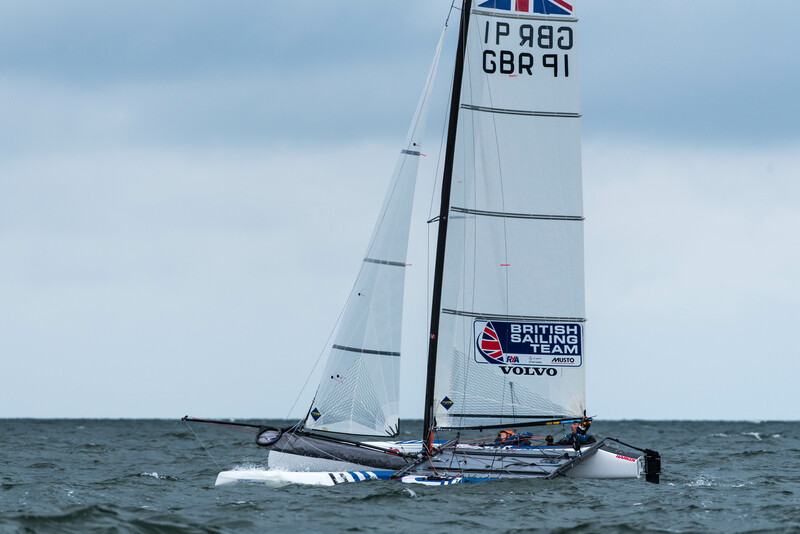 For the full post-race interview this afternoon, click here. 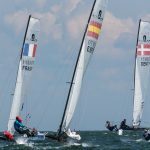 At the top of the standings, overnight leaders Will Phillips/Iain Jensen were overhauled by both Yago/Klaus Lange (ARG) and the top Polish team of £ukasz Przybytek and Pawel Kolodin, who themselves sit tied for the lead on 19 points. 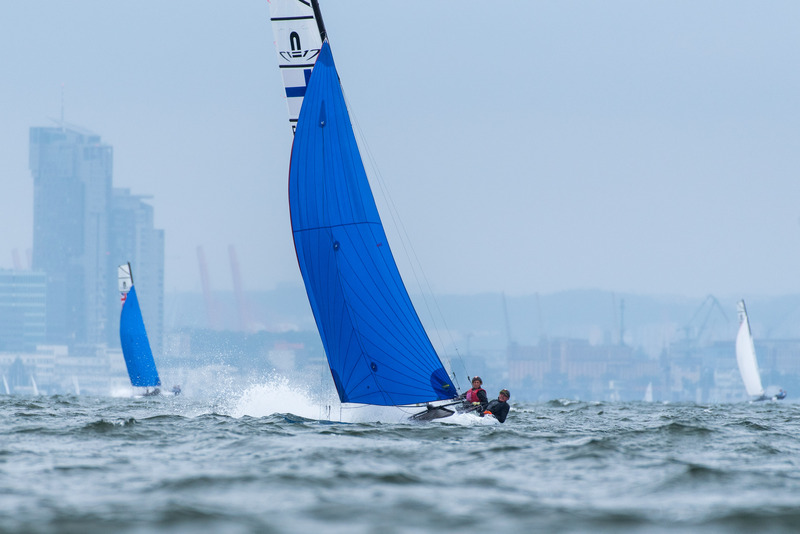 Those points will all matter at the end of the week, but with just 7 points covering the top 8 boats, no lead is safe and anything can – and probably will.